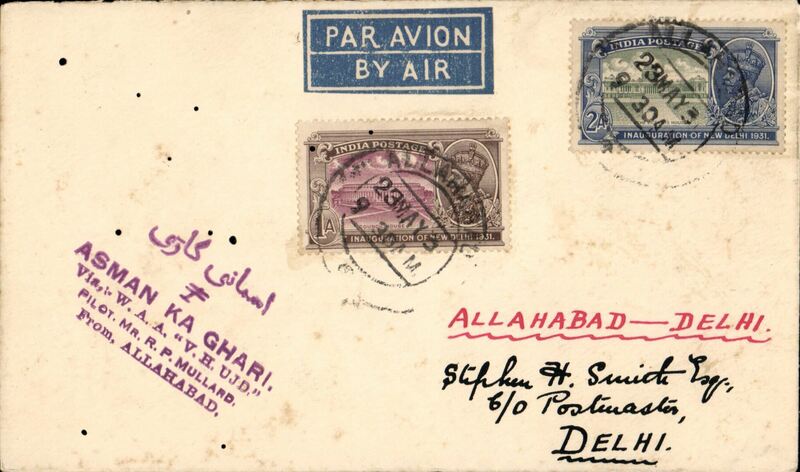 First Aerial Post, Allahahbad to Naini Junction, PPC franked KE 1 anna, canc 50% strike large circular magenta Exhibition postmark and fine strike Allahahbad 18 FE/11 cds. The front is fine, verso there is some localised staining on the picture side - see scan. 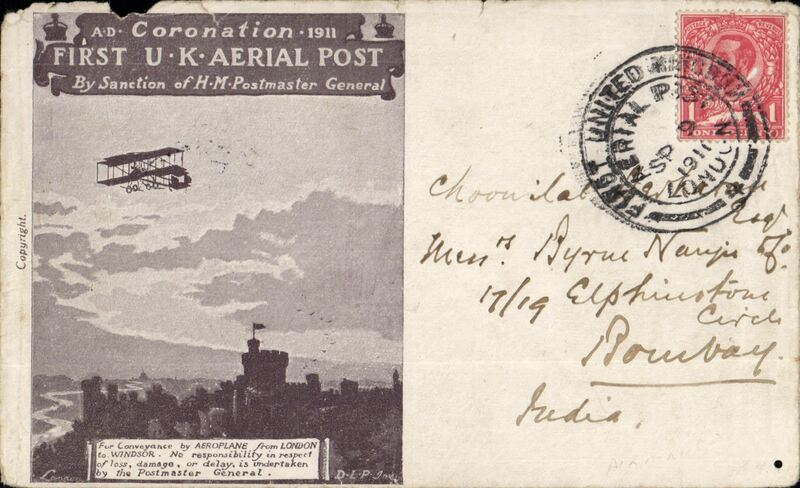 Coronation Aerial Post, inward to India from London, Bombay-Aden/Sea Post Office/24 SE.11 arrival ds verso, dark brown London to Windsor card, postmarked die number 4 London cancel. LH top edge nibble and small worm hole bottom rh corner. 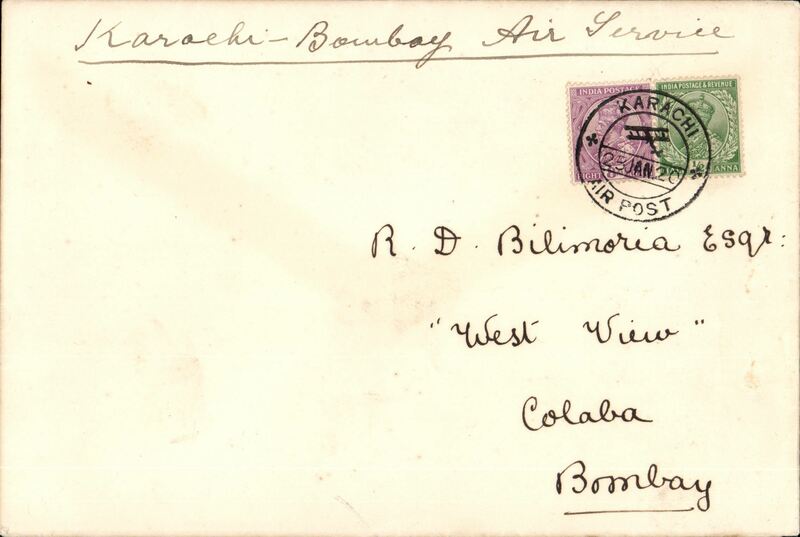 Bombay-Karachi, 7th flight northwards flown by RAF Squadron 97, registered (label verso) cover franked 10 1/2a, canc special "Bombay/6 Mar 20/Air Post'' cds, typed 'Via Bombay-Karachi Air Mail/Registered'. 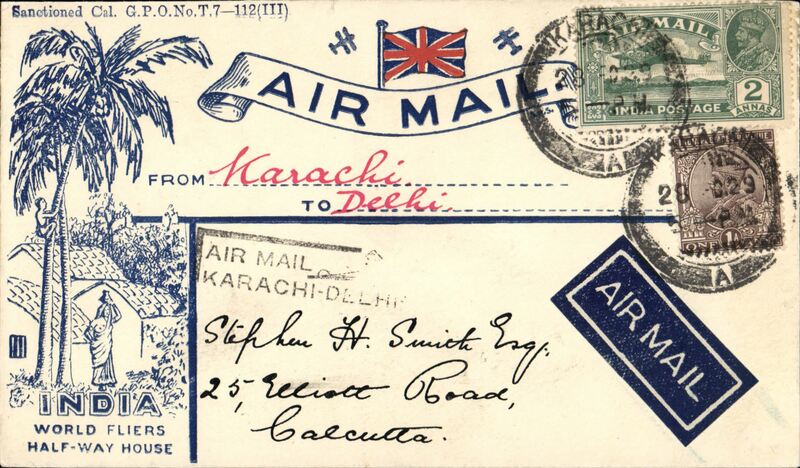 Lack of public support forced the govt to cancel this service after this, the seventh and last, flight..
Karachi-Bombay Airmail, 3rd flight southwards flown by RAF Squadron 97, cover franked 4 1/2 annas and 12p, canc 'Karachi/6 Feb 20/Air Post' cds, typed 'By Air Post', bs Santa Cruz 7/2/20 cds. There is some rear flap damage, but a residue of an embossed logo "Conjunctis Viribus" remains. Lack of public support forced the govt to cancel this service after only seven flights. 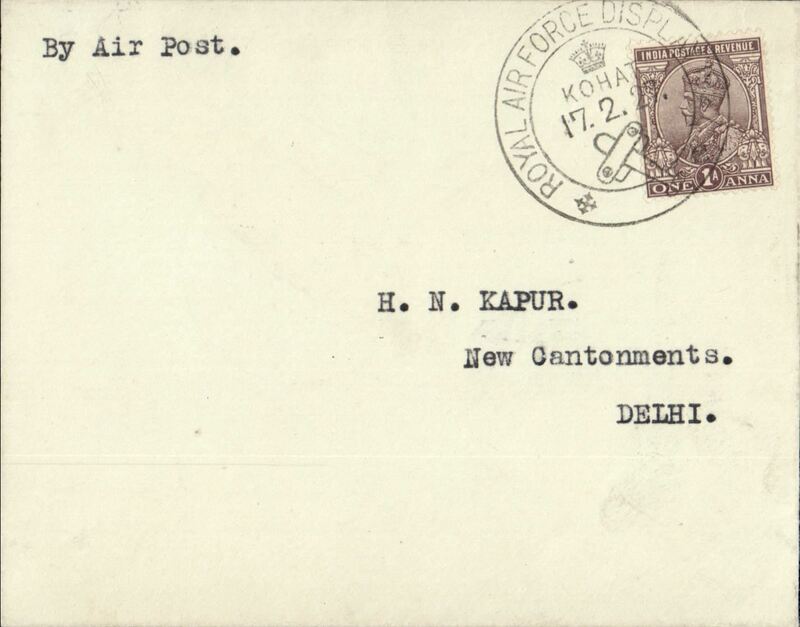 Karachi-Bombay Airmail, 4th flight southwards flown by RAF Squadron 97, 1/2 anna PSC with additional 8annas and 2p, cover franked 4 1/2 annas and 12p, canc 'Karachi/6 Feb 20/Air Post' cds, typed 'By Air Post', bs Santa Cruz 16/2/20 cds. Lack of public support forced the govt to cancel this service after only seven flights. 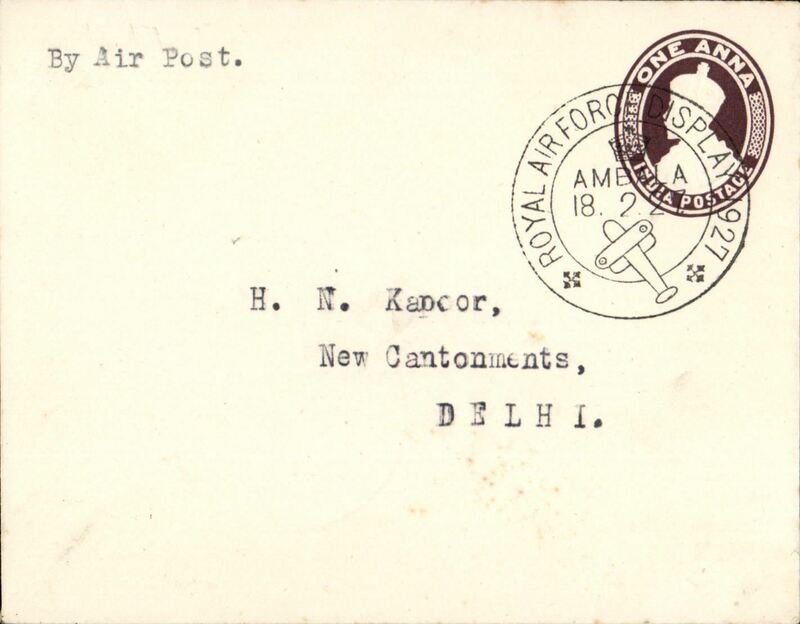 Bombay-Karachi, 7th flight northwards flown by RAF Squadron 97, cover franked 8 annas and 6p, canc "Bombay/11 Mar 20/Air Post'' cds, typed 'By Air Post', bs Karachi 12 Mar 20. Lack of public support forced the govt to cancel this service after only seven flights. 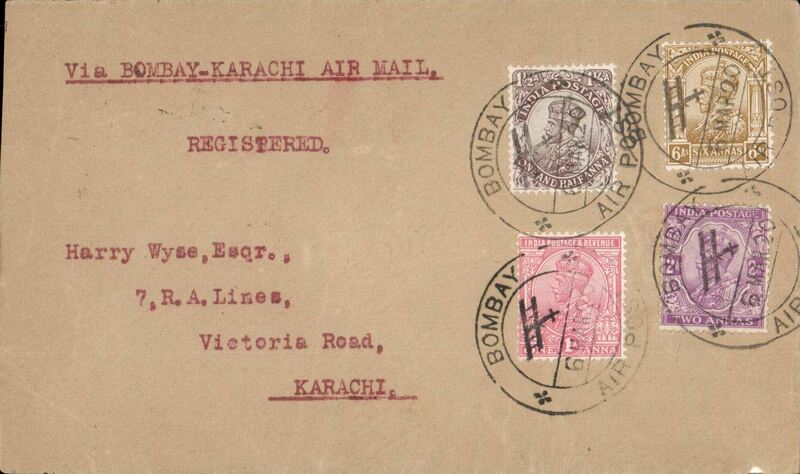 RAF, Bombay to Karachi, bs 12/3, plain cover franked 8 annas 6p, canc 'Bombay/11 Mar 20/Air Post' cds, ms 'Karachi Air Service'. 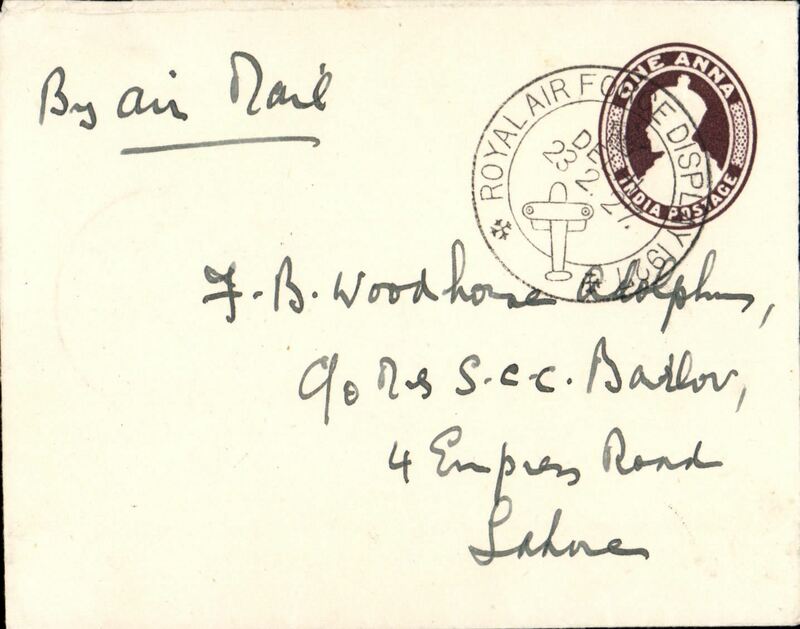 Calcutta-Risalpur Demonstration Flight, Risalpur to Nowshera, bs 3/2, plain cover franked 1 anna, fine strike circular violet cachet, signed by pilot Flt Graham, RAF. 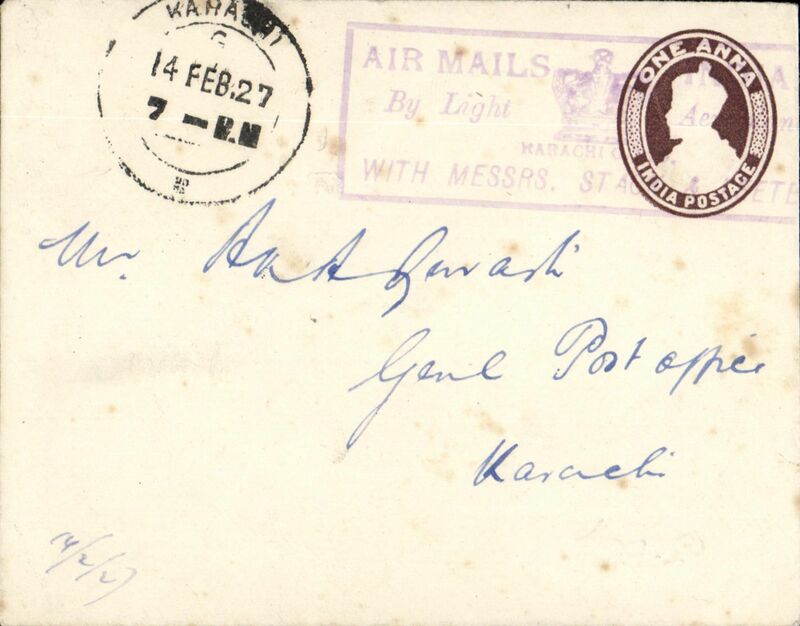 Stack and Leete deliver mail, Karachi to Lahore, bs special 'Royal Air Force Display/Lahore 17/2/27' cds, plain cover franked 1a tied by rectangular violet framed 'Messrs Stack & Leete' flight cachet (and similar verso), also Karachi/14 Feb 27 cds on front, Signed by the pilot Neville Stack. Francis Field authentication hand stamp verso. 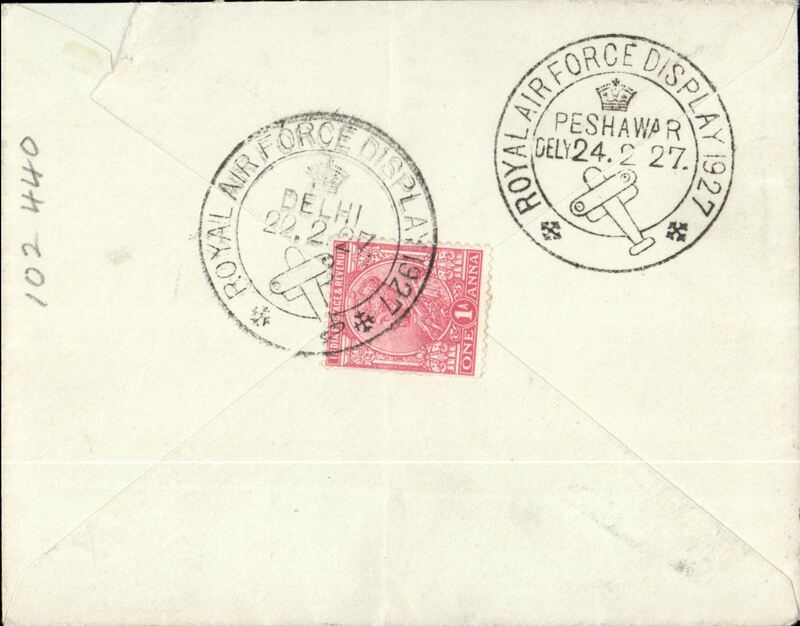 Stack and Leete deliver mail, Peshawar to Delhi, bs special 'Royal Air Force Display/Delhi/18.2.27', 1a PSW canc special 'Royal Air Force Display/Peshawar/17.2.27' cds. Closed top corner tear, barely detracts, see scan. 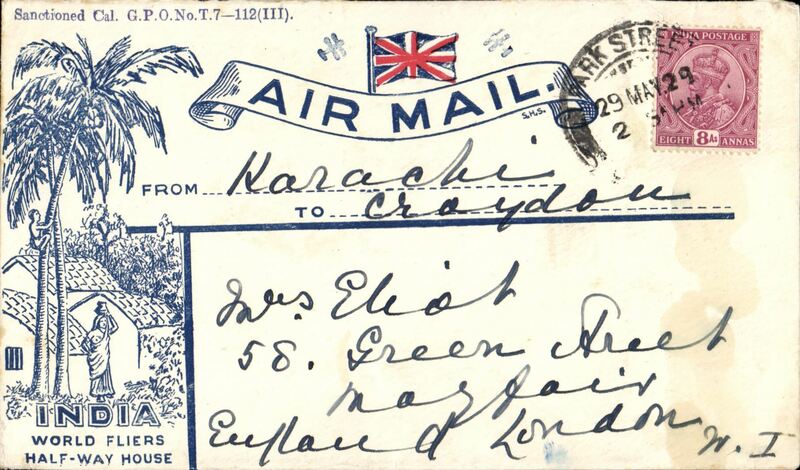 Stack and Leete mail delivery, Karachi to Lahore, franked 1 anna tied violet boxed cachet "Air mails of India/By Light Aeroplane/ with Messrs Stack and Leete" cachet, also Karachi 14 Feb cds, b/s RAF Display/Lahore 17/2 dr. cds, plain envelope. Only 60 flown to Lahore. 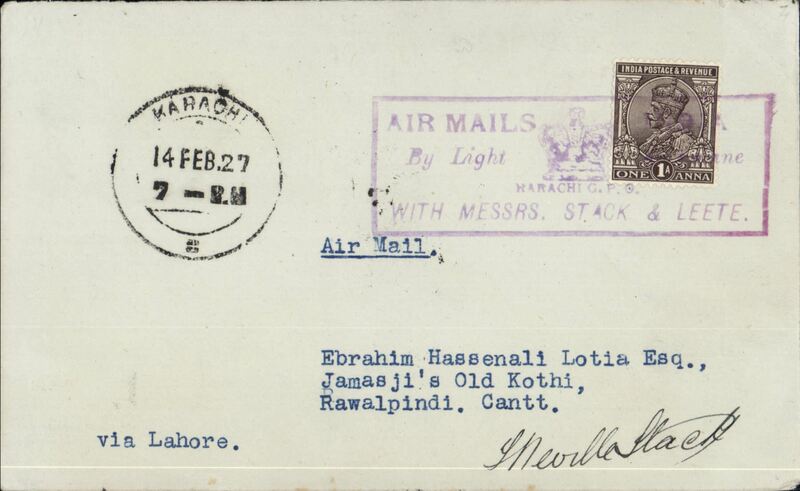 Stack and Leete mail delivery, Karachi-Lahore-Delhi-Karachi, round trip, brown/cream 1anna PSE tied by violet boxed cachet "Air mails of India/By Light Aeroplane/ with Messrs Stack and Leete" cachet, also Karachi 14 Feb cds, b/s Lahore 17/2 and 'RAF Display/Lahore 17/2 ' cds's, and Karachi 19/2 cds. 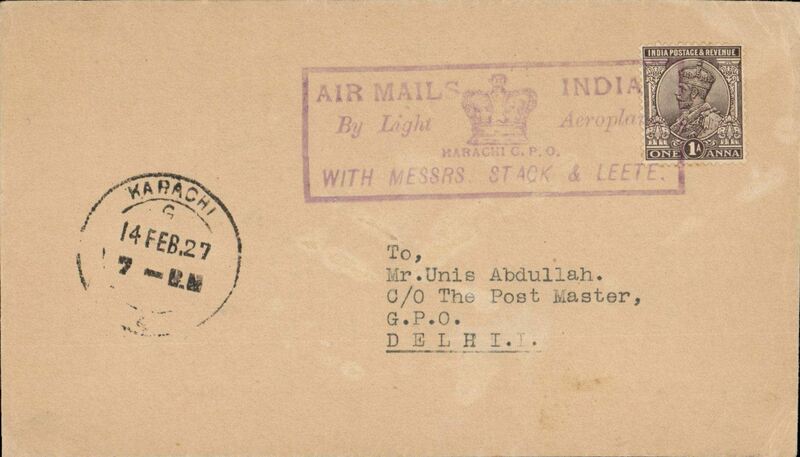 Stack and Leete deliver mail, Karachi to Delhi, bs special 'Royal Air Force Display/Delhi/18.2.27' cds, plain cover franked 1a tied by fine rectangular violet framed 'Messrs Stack & Leete' flight cachet, also Karachi/15 Feb 27 cds on front, Signed by B.M.Leete. Stack and Leete deliver mail, Ambala to Delhi, bs special 'Royal Air Force Display/Delhi/19.2.27' cds, 1a PSE canc 1a PSW canc special 'Royal Air Force Display/Ambala/18.2.27' cds. 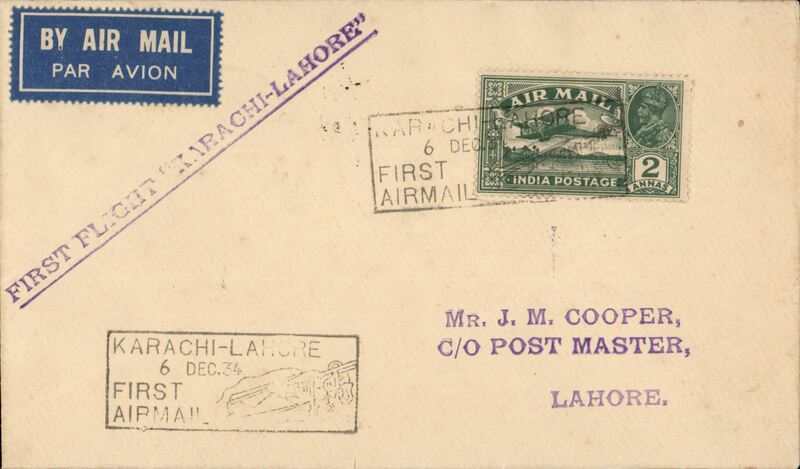 Stack and Leete deliver mail, Lahore to Delhi, bs special 'Royal Air Force Display/Delhi/18.2.27' cds, uncommon black/white OHMS 'Railway Dept' envelope franked 1a 'Service' canc special 'Royal Air Force Display/Lahore/18.2.27' cds. 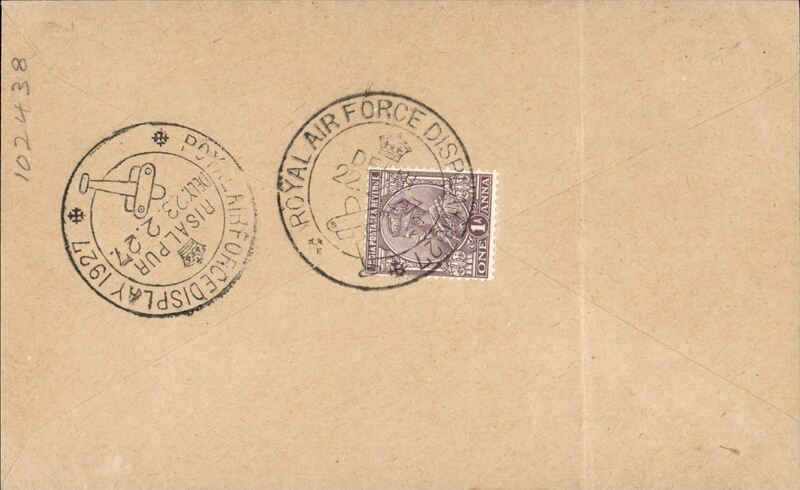 Stack and Leete deliver mail, Kohat to Delhi, bs special 'Royal Air Force Display/Delhi/18.2.27' cds, plain cover franked 1a canc special 'Royal Air Force Display/Kohat/18.2.27' cds. RAF Pageant Demonstration Flights, Delhi to Risalpur, special 'Royal Air Force Display/Risalpur/23.2.27' arrival ds, plain cover franked 1a canc special 'Royal Air Force Display/Delhi/22.2.27' cds. Non invasive ironed vertical crease. RAF Pageant Demonstration Flights, Delhi to Lahore, special 'Royal Air Force Display/Lahore/23.2.27' arrival ds, 1a PSE canc special 'Royal Air Force Display/Delhi/23.2.27' cds. RAF Pageant Demonstration Flights, Delhi to Peshawar, superb strike special 'Royal Air Force Display/Peshawar/24.2.27' arrival ds, plain cover franked 1a verso, canc special 'Royal Air Force Display/Delhi/22.2.27' cds. Top corner edge nick, does not detract. RAF Pageant Demonstration Flights, Delhi to Ambala, special 'Royal Air Force Display/Ambala/23.2.27' arrival ds, plain cover franked 1a canc special 'Royal Air Force Display/Delhi/23.2.27' cds. RAF Pageant Demonstration Flights, Delhi to Kohat, special 'Royal Air Force Display/Kohat/23.2.27' arrival ds, plain cover franked 1a canc special 'Royal Air Force Display/Delhi/23.2.27' cds. 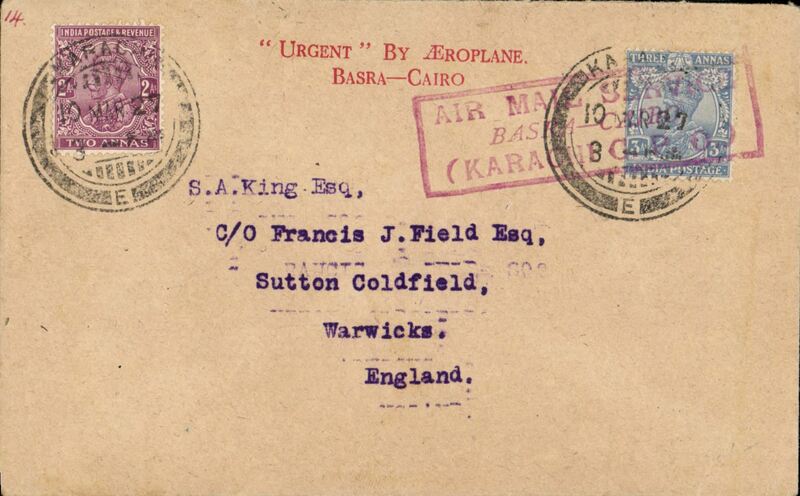 Basra-Cairo airpost, Karachi to London, no arrival ds, via Basra 17/3, buff envelope with uncommon printed in red 'Urgent By Aeroplane/Basra-Cairo', franked 5 annas, canc Karachi cds, fine strike oblong red boxed "Air Mail Service/Basra-Cairo/Karachi GPO" cachet (used until Sept 8th, 1927), Francis Field authentication hs verso. 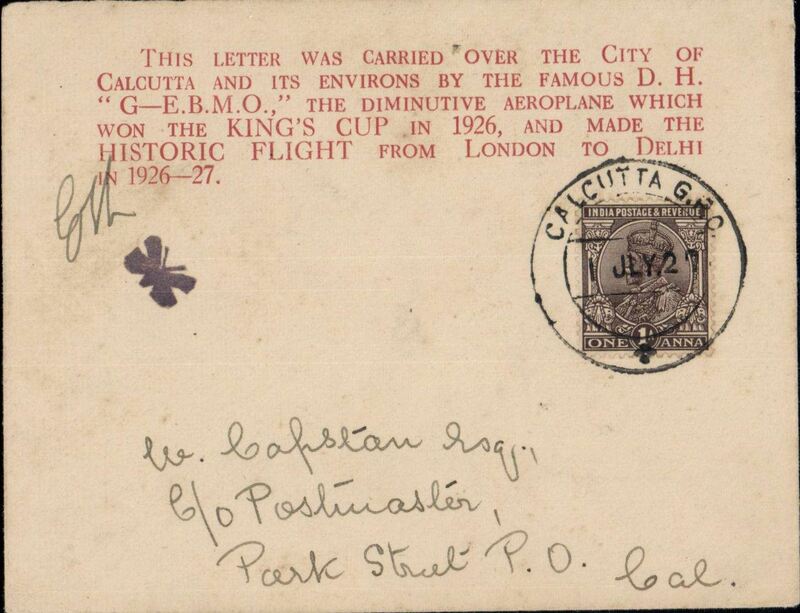 Second Calcutta Flight by 'Moth' plane, attractive red/buff printed souvenir cover with printed red six line 'King's Cup' cachet and small black 'Butterfly' cachet, franked 1a, canc Calcutta, also bs Calcutta 2/7, initialled by by FLt W H Vetch. 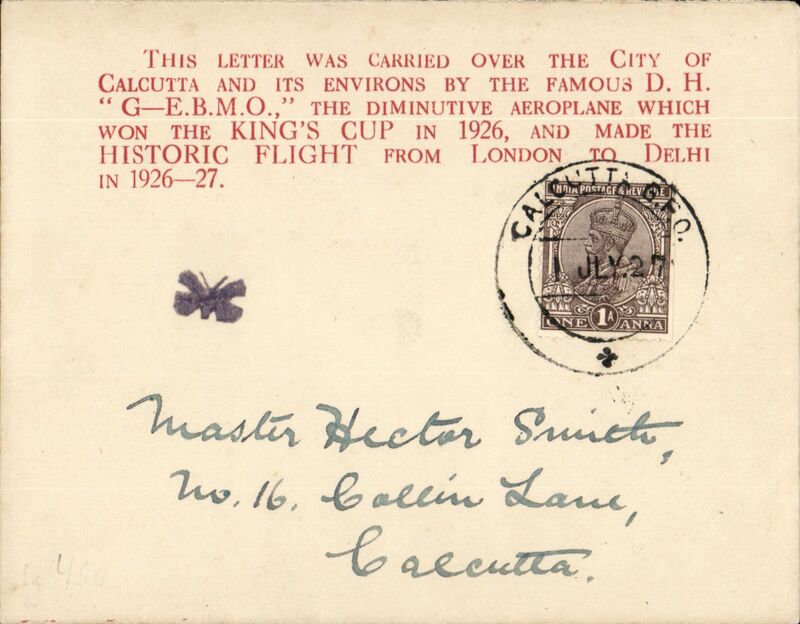 Second Calcutta Flight by 'Moth' plane, attractive red/buff printed souvenir cover with printed red six line 'King's Cup' cachet and small black 'Butterfly' cachet, franked 1a, canc Calcutta, also bs Calcutta 2/7, verso signed Stephen Smith, and Francis Field authentication hs. On 20 June 1927 at 4.45pm, the De Havilland DH60 Moth, which won the King’s Cup in 1926 and which had been flown by Neville Stack from London to arrived at Calcutta Race Course, piloted by Flight Lieutenant W H Vetch. The object of the flight from Karachi was to survey for suitable landing grounds for use on flights between Karachi, Delhi and Calcutta. 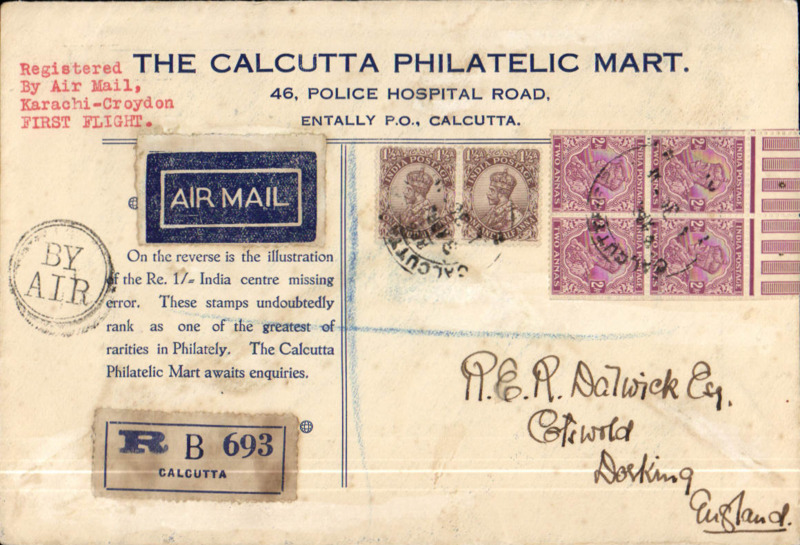 While in Calcutta, two souvenir mail flights were made by permission of the Postal Authorities, ref 27-65, Indian Air Mails, Brown J, 1995. 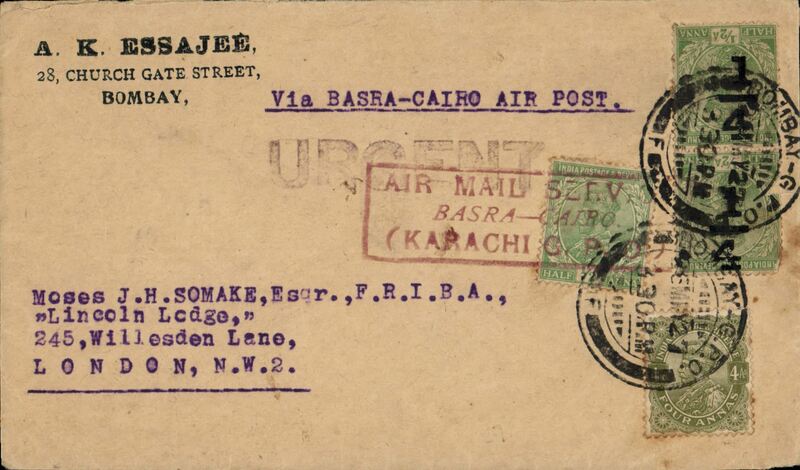 Basra-Cairo airpost, Bombay to London via Basra 15/7, registered (label) printed 'Via Air Mail Service/Basra-Cairo' corner cover franked 7 1/4 annas and 9p, canc Bombay cds, yellow/black airmail etiquette. 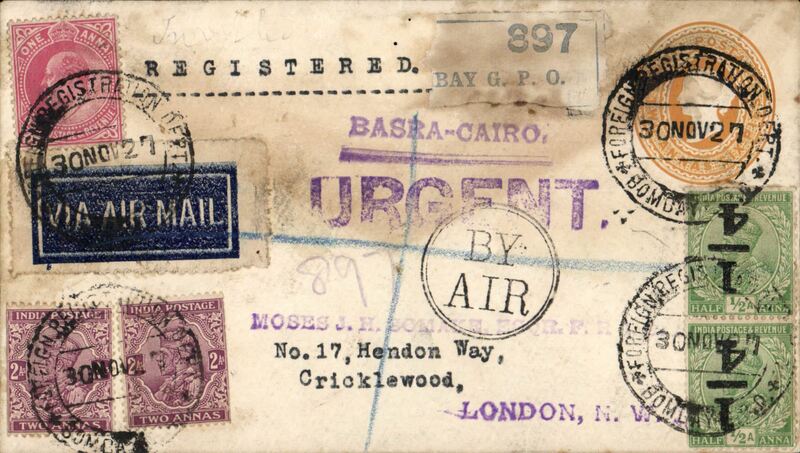 Basra-Cairo airpost, Bombay to London, 2anna 6p registered (label) PS envelope with additional 5 1/2 anna inc inverted 1/4 anna opt x2 (not listed by Stanley Gibbons) canc Bombay Registration cds, violet "Basra-Cairo" and "Urgent" hs's, black double circle "By Air" hs, tied dark blue/white etiquette, some gum suffusion top front and verso, see scan. Empire Cruise Seaplane flight, on 17 October 1927, four Supermarine Southampton flying boats left Plymouth on the first formation flight from England to Australia. Fourteen months later, they had flown from England to Australia, right round the Australian seaboard, and back to Singapore, then round the China Sea and back to Singapore again. 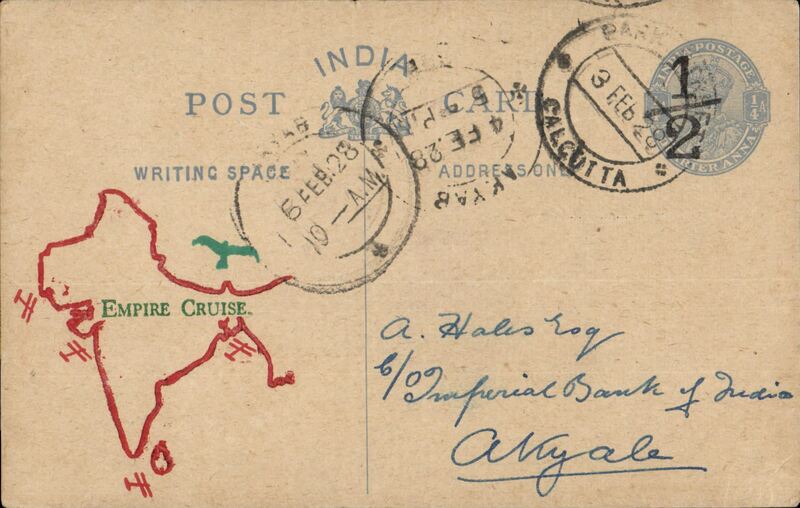 1/2 annas PSE, canc Park Street, Calcutta, Akyab 5/2 arrival cds on front, yellow/green/red cachet showing map of India with 'EMPIRE CRUISE / by Seaplane above aeroplane' one of 63 postcards flown from Cacutta to Akyab (ref Brown J, Indian Air Mails, 1995, 28-07). Underpaid Basra-Cairo airpost, Multan City to London, 23/3 , Basra 16/3 transit cds verso, commercial corner cover, franked India 4 annas and GB 1 1/2d postage dues canc GB 'T' /1 1/2d F.B/London E*' cds.' also first issue of Indian Air Mail label inscribed 'Air Mail' in white on blue background, black double ring 'By Air' hs. Nice item. 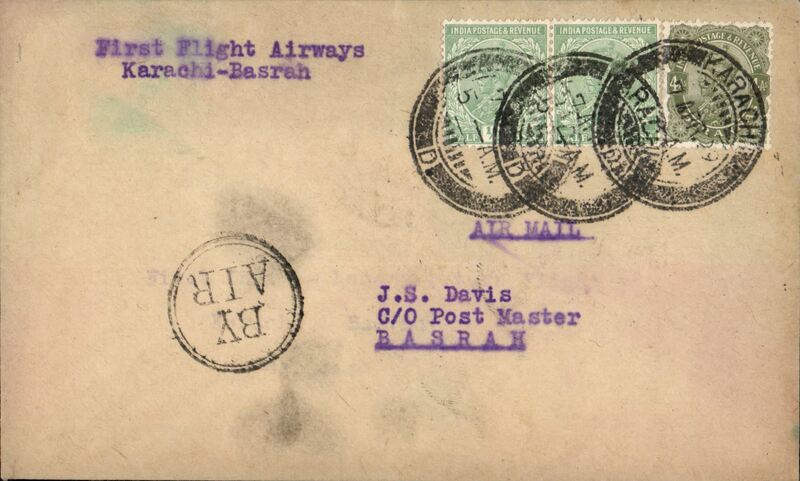 First issue of Indian Air Mail label inscribed 'Air Mail' in white on blue background, Basra-Cairo airpost, Karachi to London, no arrival ds, via Basra 23/3, buff envelope with printed 'Air Mail/Basra-Cairo' in red, franked 5 annas, canc Karachi cds, black double ring 'By Air' hs. 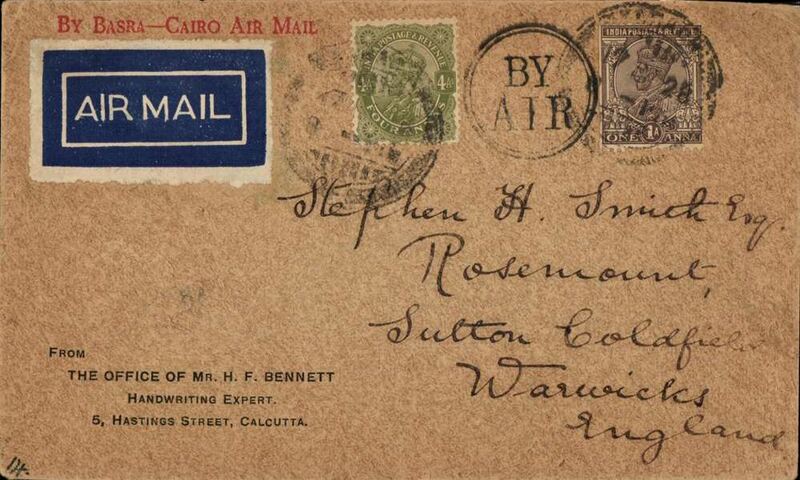 Basrah-Cairo airmail, Calcutta to England, printed corner cover from "The Office of Mr HF Bennett, Handwriting Expert, Calcutta" addressed to Stephen Smith, Sutton Coldfield, England, via Basra 17/2, franked 5 annas, red printed st. line "By Basra-Cairo Air Mail" instruction in top lh corner, etiquette, black circular "By Air" cachet, RAF. The transit time for UK-Iraq mail was, in this way, reduced from 27 by surface to 10 days by surface and air. Also a neat hand drawn map of the Cairo-Basrah service. 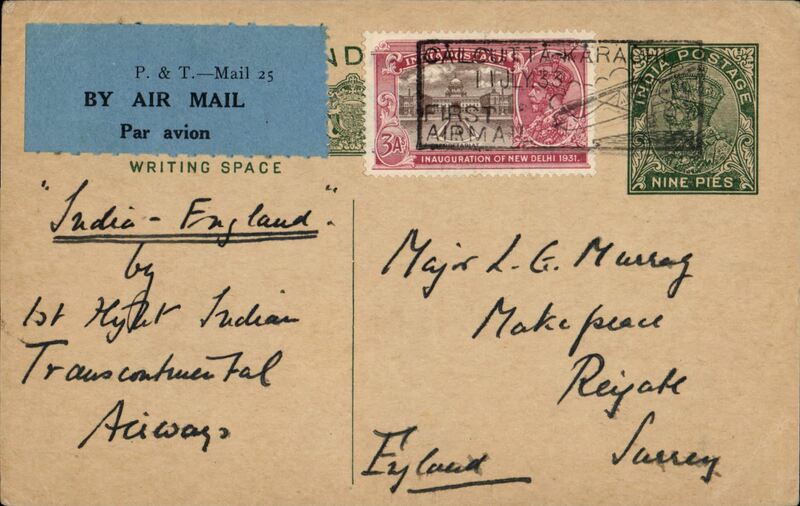 Bombay to London, no arrival ds, flown by the Marseilles to London Air Service, buff cover franked 5 anna, circular "By Air" cachet, two dark blue/white airmail etiquettes rated scarce by Mair, fine strike red straight line "Marseilles-London Air Service". If not the first, then likely the second flight by this route. The postage rate is too low for carriage also by the Basrah-Cairo service, so likely by sea to Marseilles. An uncommon item in fine condition. 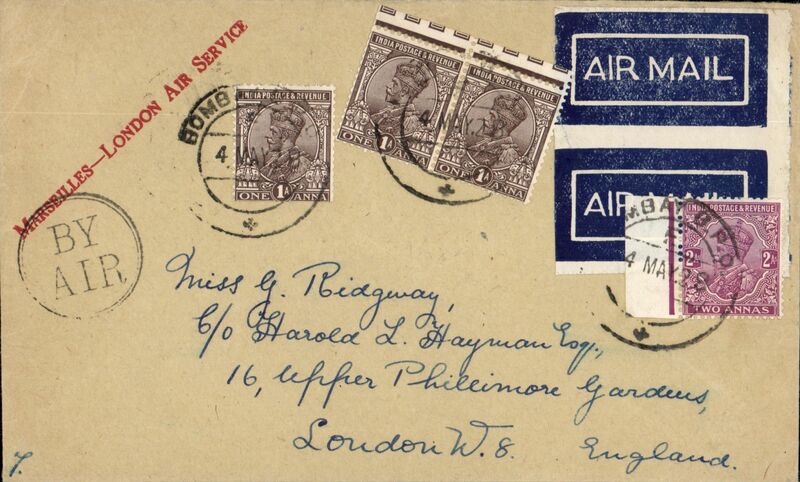 First combined Basra-Cairo and Marseilles-London airmail service, Bombay to London, buff envelope with 'Marseilles-London Air Service' printed in red in top lh corner, franked 5 annas canc Bombay cds, black double ring 'By Air' hs, pair tied dark blue/white airmail etiquettes. Scarce item in very fine condition. 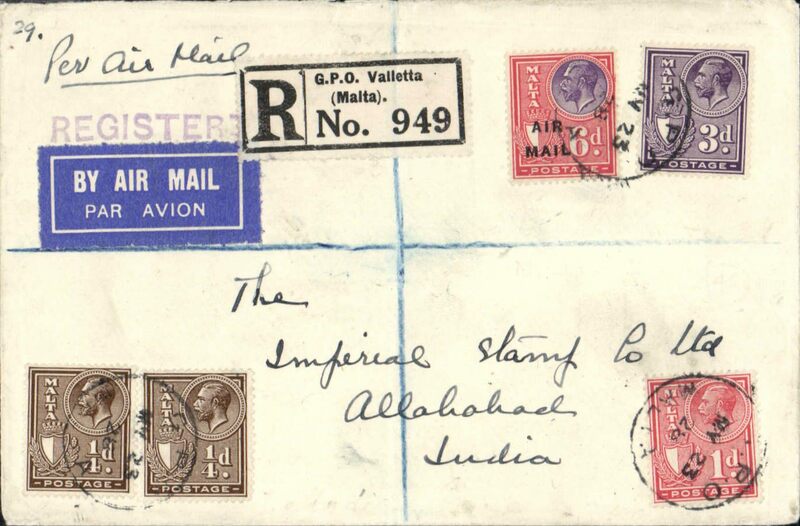 Malta to India, a likely first Malta accceptance for Allahabad, bs 11/6, via Alexandria 28/5, Cairo 28/5 and Karachi 7/6, registered (label) cover franked 4 1/2d plus the KGV red/violet 6d opt 'Air Mail' special airmail stamp (a 1928 Malta Govt. Post Office Notice reqired the air mail fee of 6d to be denoted by this special stamp), ms 'Per Air Mail', blue/white airmail etiquette, 'Registered' hs. 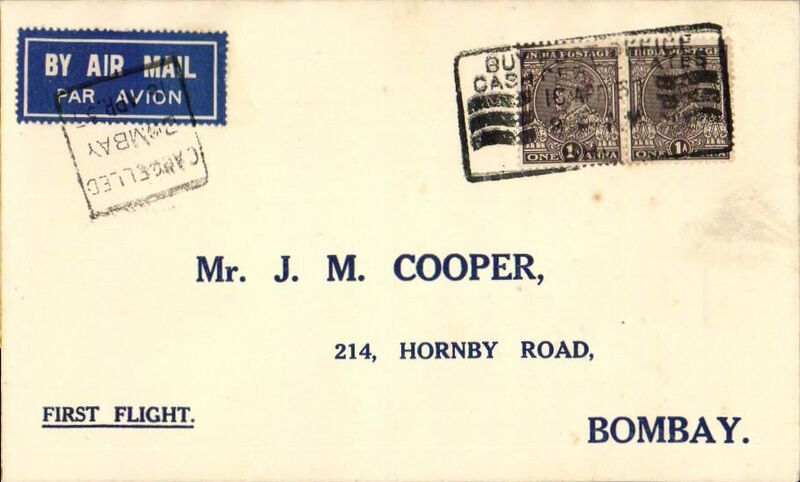 The Malta Study Circle Paper #29, p9, reports that this service was run by Imperial Airways, and that mail had to leave by sea until 19th July 1931. It also refers to an acceptance from Malta for Allabahad dated 23 May 1928. A rare item in fine condition. Karachi to Tokyo leg of the Berlin to Tokyo Flight by Baron von Huenefeld and Karl G. Lindner. 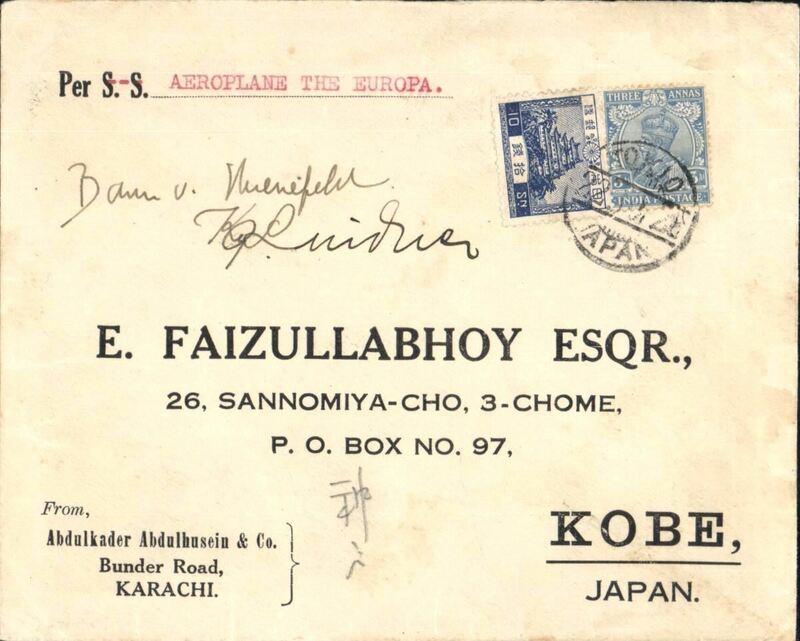 An Abdulkader Abdulhussin & Co, Bunder Road, Karachi corner cover endorsed 'Per Aeroplane The Europa' and addressed to Kobe Japan, franked India 3a and Japan 10s both tied upon arrival by Tokyo cds of October 22 and, on reverse, a Kobe receiving cds of October 24, signed on front 'Baron v. Huenefeld' and 'K G Lindner'. Karachi was a stage on the Berlin to Calcutta leg of this flight. Records show that 47 items were carried from Calcutta to Tokyo, but we could find no record of one having been carried from Karachi. Furthermore, it is one of only a few of the items carried which was pilot signed. A fine and rare item. 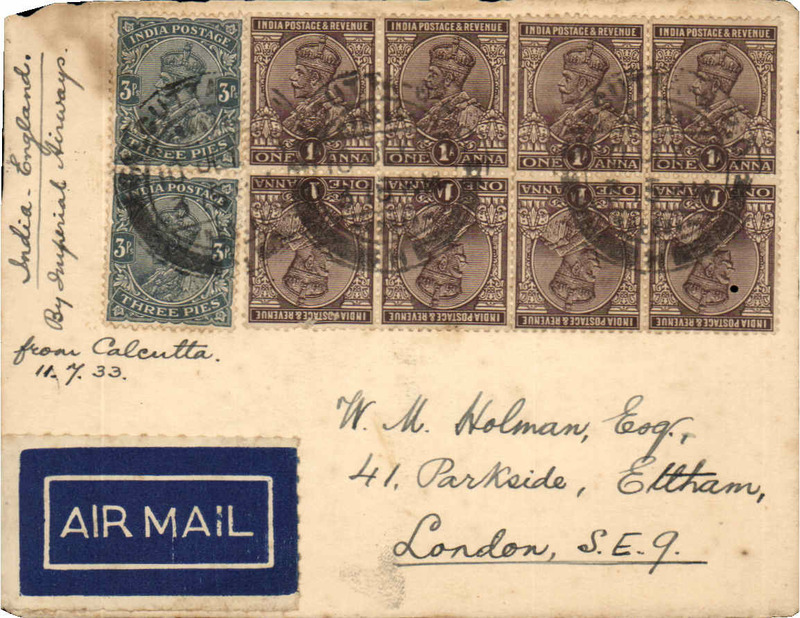 Calcutta to London, bs 15/4, flown on first return service Karachi to London, registered (label) souvenir cover with illustration block of India 1/- centre missing error verso, black dr "By Air" hs, 1929 etiq rated very scarce by Mair, blue/cream Calcutta Philatelic Mart souvenir cover franked 10 annas, typed "Registered/By Air Mail/Karachi-Croydon/FIrst Flight", Imperial Airways. Registration label toned, see scan. 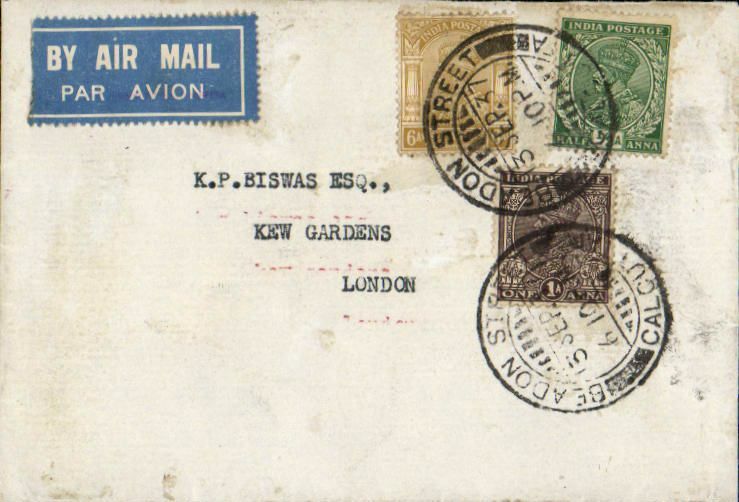 Imperial Airways, Bombay to London, bs 15/4, carried on first return service Karachi to London, a non philatelic cover franked 11 annas, black double ring circular "By Air" hs. 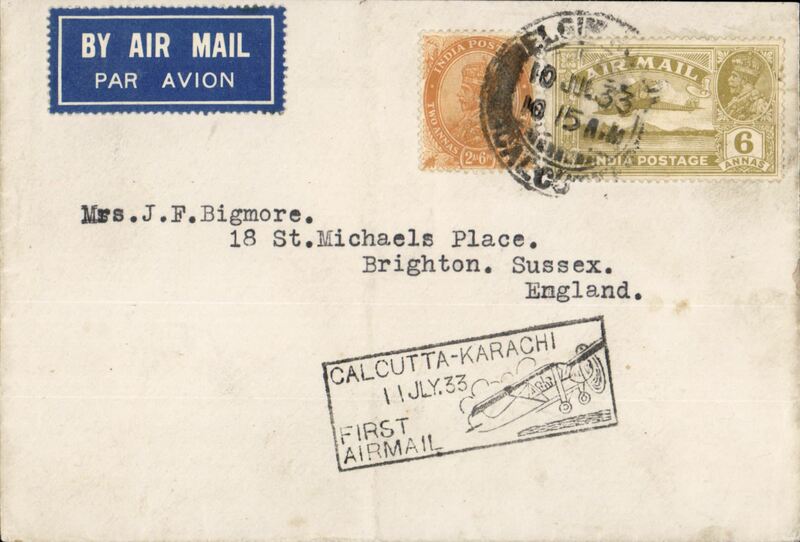 Imperial Airways, Karachi to London, bs 15/4, flown on first return service Karachi to London, a non philatelic cover franked 8 annas, black double ring circular "By Air" hs. Also original message on sender's headed note paper am sending this by the first regular Air Mail service from India to London". 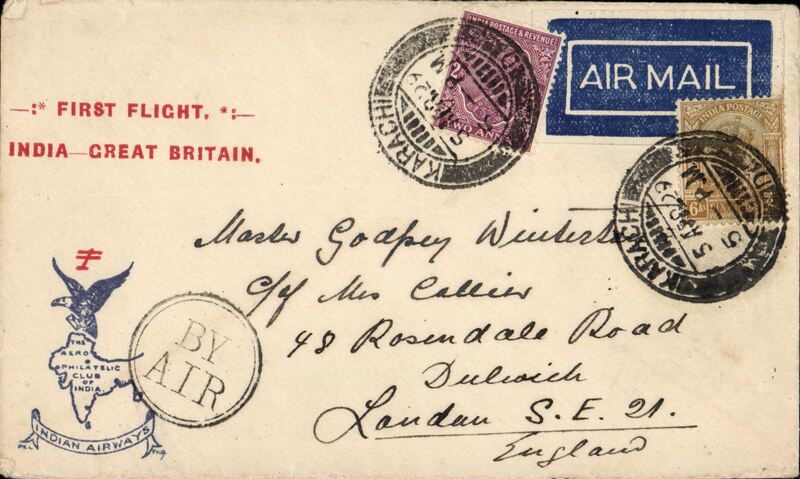 Imperial Airways, Karachi to London, Liverpool 15/4 arrival ds on front, flown on first return service Karachi to London, plain cover franked 8 annas, black double ring circular "By Air" hs, Imperial Airways. 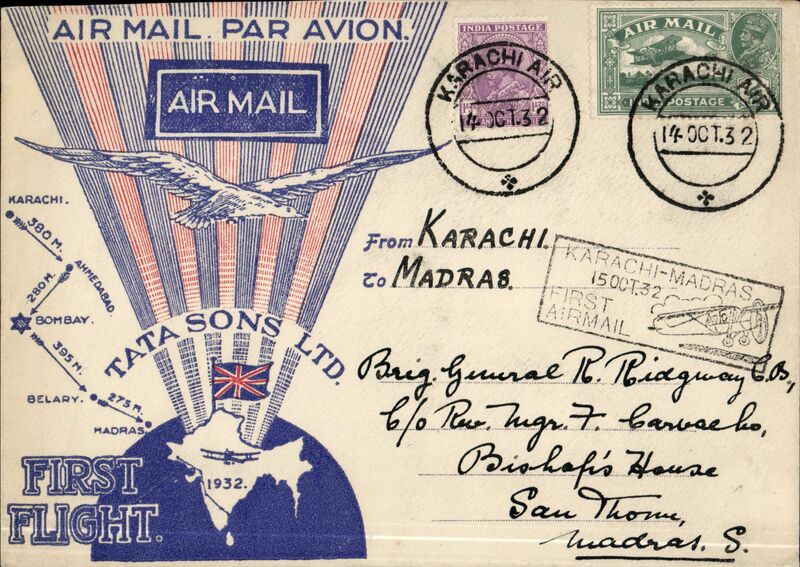 F/F Karachi to London, uncommon red/white/blue souvenir cover with printed "1st Flight /India-Great Britain" in red and "Indian Airways eagle and logo" printed in blue, franked 8a canc Karachi cds tying 1929 etiquette rated scarce by Mair, black dr "By Air" hs, 'Stephen Smith' printed in blue verso. 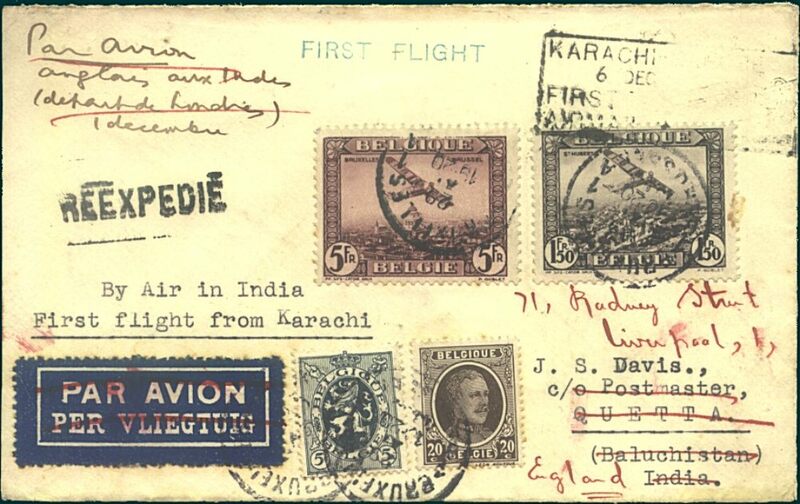 Imperial Airways, Karachi to London, 15/4 arrival ds on front, flown on first return service Karachi to London, red/buff souvenir "1st Flight/India-Great Britain" cover, franked 8a, black dr "By Air" hs. 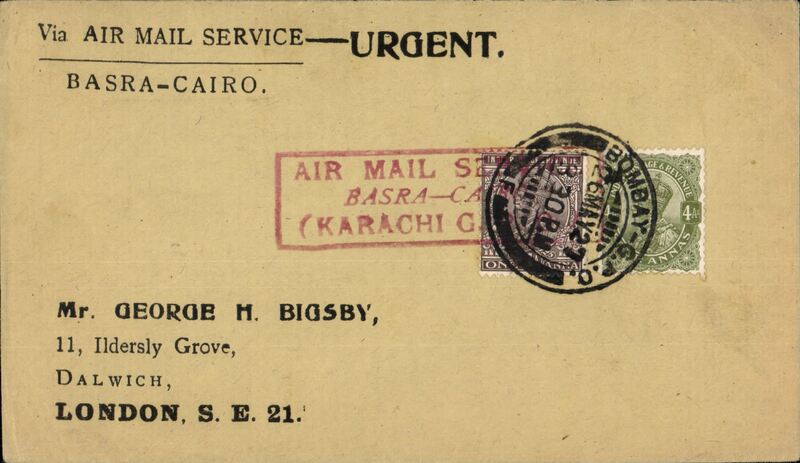 First return sevice from India, Karachi to Basrah, bs 8/4, circular "By Air" cachet, Imperial Airways. Newall 29.05Aa, 100units. 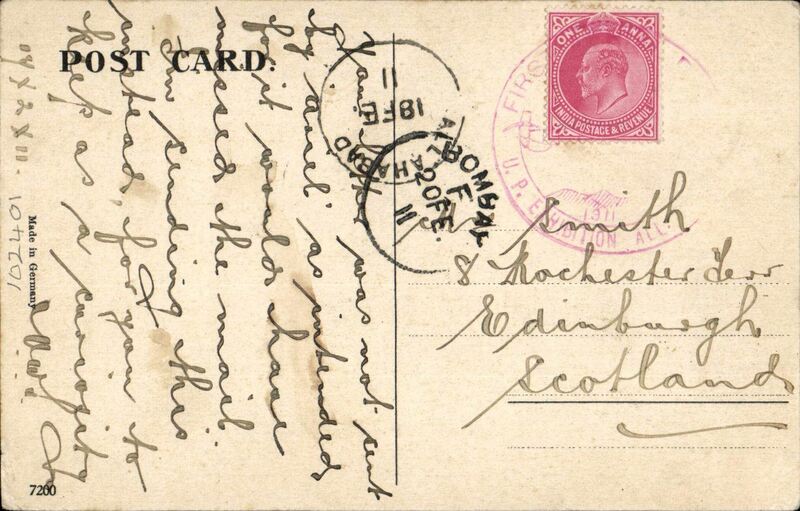 Faint red imprint from F/F England-India souvenir cover verso. 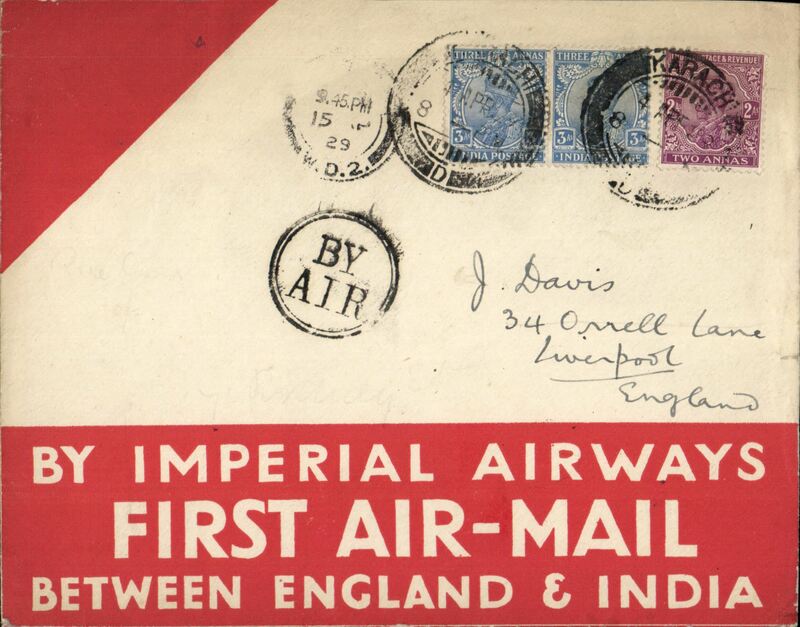 Imperial Airways, first return sevice from India, Karachi to London, 15/4 arrival ds on front, red and white "First Air-Mail" souvenir cover franked 8a, circular "By Air" cachet. A picture (not a photo), 16x12cm, of DH66 Hercules G-EBMY 'City of Baghdad' accompanies this item. F/F Karachi to Cairo, bs Alexandria 24/4, third flight IW3, uncommon red/buff/green souvenir cover with printed "Karachi to Cairo/By Imperial Airways" in red and "Indian Airways eagle and logo" printed in green, franked 7a canc Karachi cds tying 1929 etiquette rated scarce by Mair, black dr "By Air" hs, signed by 'Stephen Smith' verso (not facsimile). 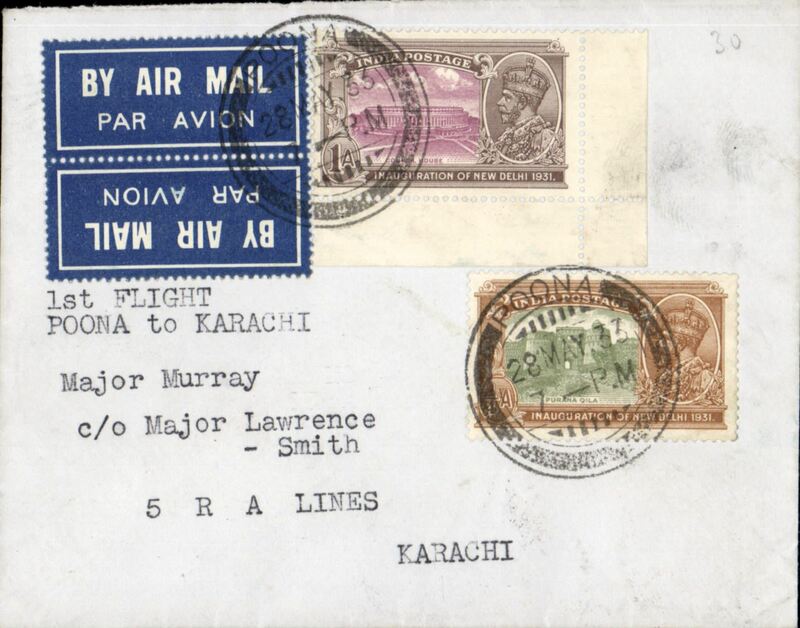 Imperial AW 4th flight Karachi to London, ms arrival 5/5 confirmation, uncommon red/white/blue PC with printed "(ms 4th) flight/ India to Great Britain/By Imperial Airways" and "Indian Airways eagle and logo" printed in dark blue, franked 7 1/2 anna canc Karachi cds, black dr "By Air" hs, signed by 'Stephen Smith' verso (not facsimile). 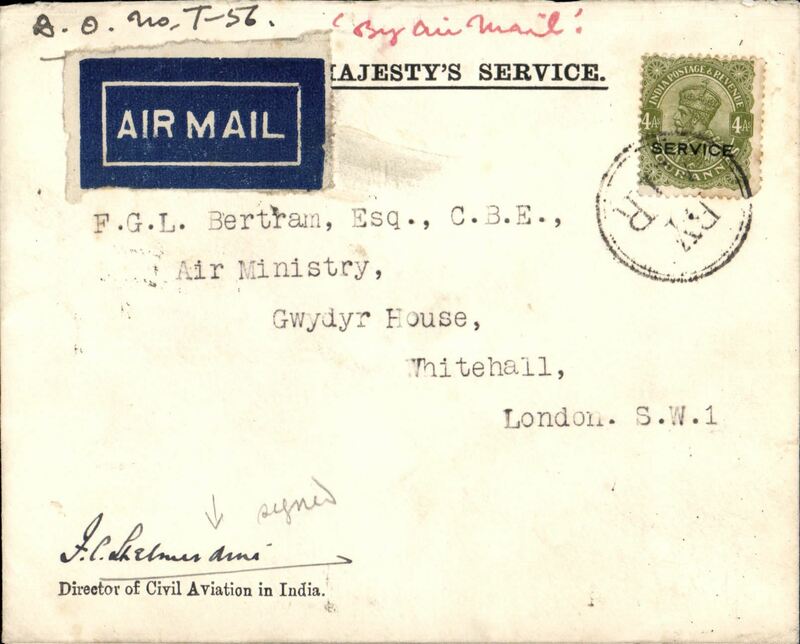 Scarce signature, carried on third IAW flight from India to London, official OHMS envelope with embossed logo verso, from the office of the Director of Civil Aviation in India, franked 4 annas 'Service' opt on front uncancelled but tied by black double ring 'By Air' hs, also and 1anna 'Service' opt x4 verso, signed on front by Lt Col Shelmerdine who was the first Director General of Civil Aviation in India. 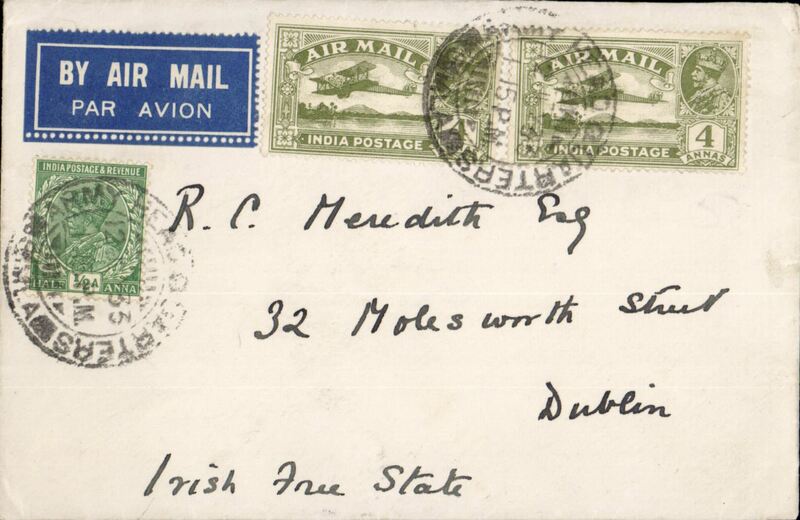 Bengal Air Transport Co, illustrated 'Half Way House' cover, Calcutta to Siliguri, franked 1a, also bs Mount Hermon 22/5 and Darjeeling 22/5, F/F and Bengal Air Transport Co Ltd hand stamps and Francis Field autentication hs verso. On 21 May 1929, the Bengal Air Transport Company introduced, for one week, an experimental service to test the possibilities of a permanent route linking Calcutta with Silliguri and Darjeeling. The pilot was Neville Vintcent and the aeroplane a De Havilland Limousine. See Brown J, Indian Air Mails, 1995, #29-31). Bengal Air Transport Co, experimental air service Calcutta-Siliguri-Darjeeling, unfranked newspaper wrapper to Darjeeling, insribed "Press Packet/The Englishman/Per Bengal Air Transport Co." The intention of this short lived flight, partly sponsored by Imperial Airways, was to test the possibility of a permanent Calcutta-Darjeeling service. Due to bad weather, the flight had to terminate at Siliguri, and continue to Darjeeling by car. The pilot was Neville Vintcent. Certified by Stephen Smith Genuine flown copy (ref ref Brown J, Indian Air Mails, 1995, #29-32). A scarce historical item in superb condition. 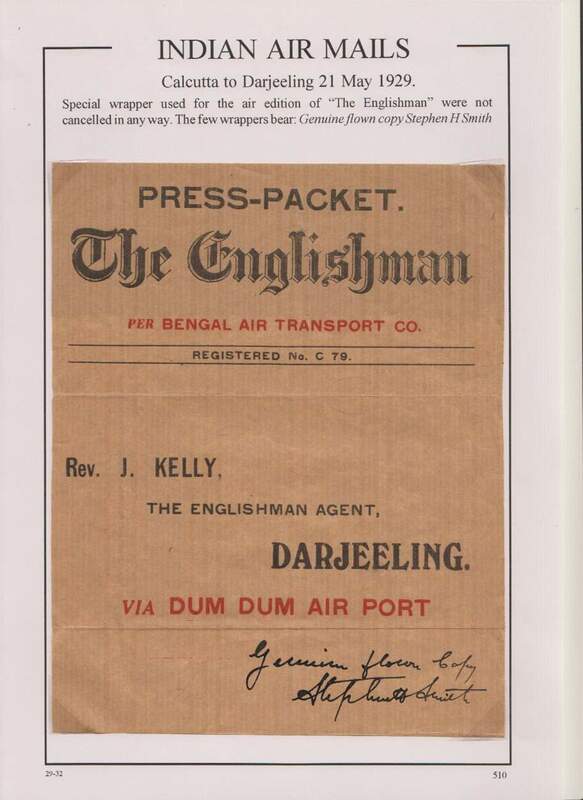 Bengal Air Transport Co, experimental air service, Calcutta-Siliguri-Darjeeling, a truly rare advertising poster, 45x62c, of the air edition of the 'Englishman' newspaper, certified by Stephen Smith as a genuine flown copy and inscribed in his hand "This poster was carried by aeroplane on the first flight from Calcutta to Darjeeling on the 21st May, Stephen Smith". The intention of this short lived flight, partly sponsored by Imperial Airways, was to test the possibility of a permanent Calcutta-Darjeeling service. Due to bad weather, the flight had to terminate at Silliguri, and continue to Darjeeling by car. The pilot was Neville Vintcent.. Even rarer than the 'Englishman' newspaper, so much so that Brown was unable to find a copy to illustrate in his book (Brown J, Indian Air Mails, 1995, #29-33). A precious historical item in fine condition. Karachi to Croydon, flight IW9, interrupted twice by sandstorms between Bushire and Baghdad, see Wingent p18, attractive World Fliers Half-Way House cover franked 8 annas. 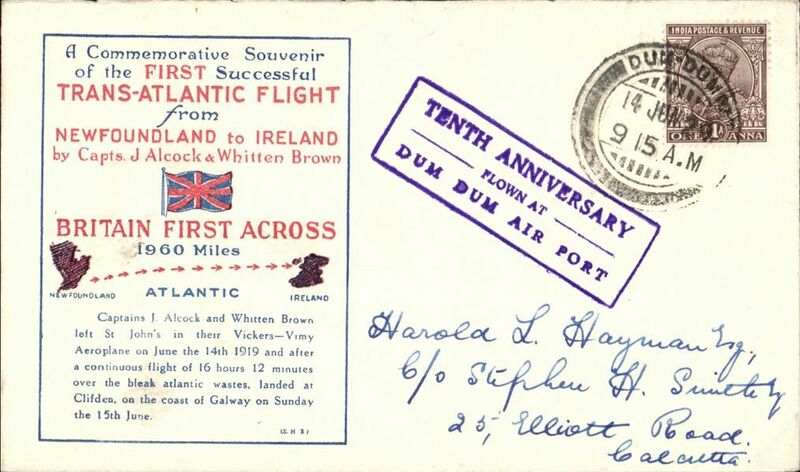 Alcock & Brown commemorative flight, flown at Dum Dum airport, red/blue/cream souvenir cover franked 1 anna, canc Dum Dum cds, inscribed blue framed "First Successfull Trans-Atlantic Flight................" cachet , boxed purple "Tenth Anniversary/Flown at/Dum Dum Air Port" cachet , signed Stephen Smith 14/6/29 and 14/6/ Park Street/Calcutta/ 14 Jun 29 ds verso. Francis Field authentication hs verso. Nice item in fine condition. 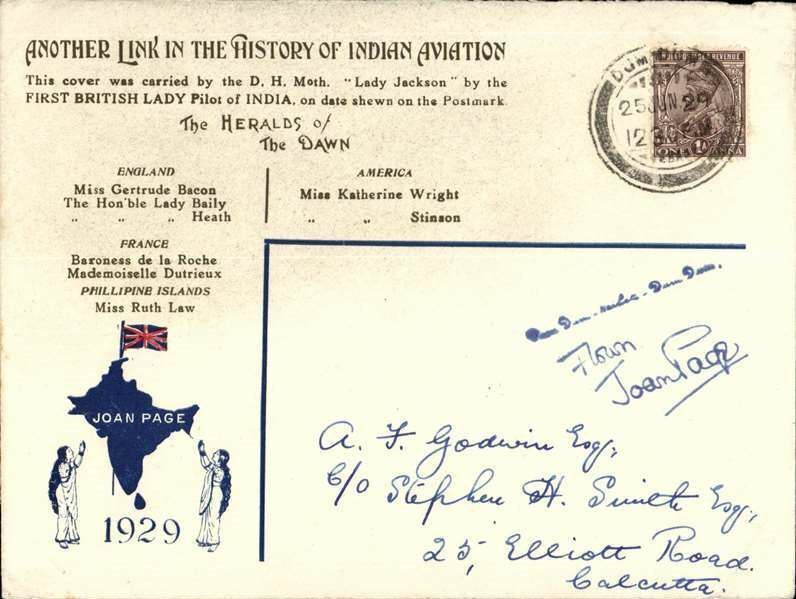 Joan Page flight, Dum Dum-Naihati-Dum Dum, souvenir envelope, franked 1 anna, canc Dum Dum 25/6, printed "ANOTHER LINK IN THE HISTORY OF INDIAN AVIATION / This cover was carried by the D H Moth Lady Jackson by the first BRITISH LADY pilot of INDIA on the date shown on the postmark, and under the heading THE HERALDS OF THE DAWN are listed names of lady fliers around the world, also the name Joan Page within map of India with Union Jack, 1929 and the names of lady supporters. 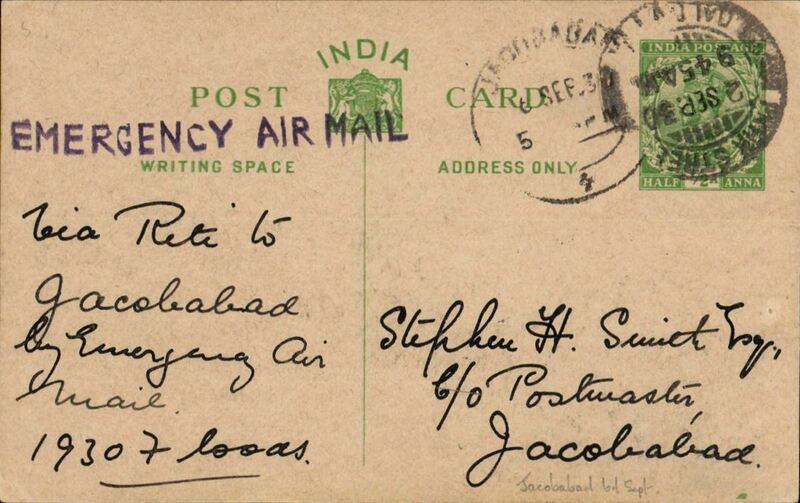 Joan Page flight, post marked Dum-Dum 25 Jun 11 929, 12.30pm, bs Calcutta 25/6, special cream/brown printed souvenir cover facsmile signature of pilot front and verso, also Stephen Smith signature verso. Minor scuff lower left hand corner, see scan. 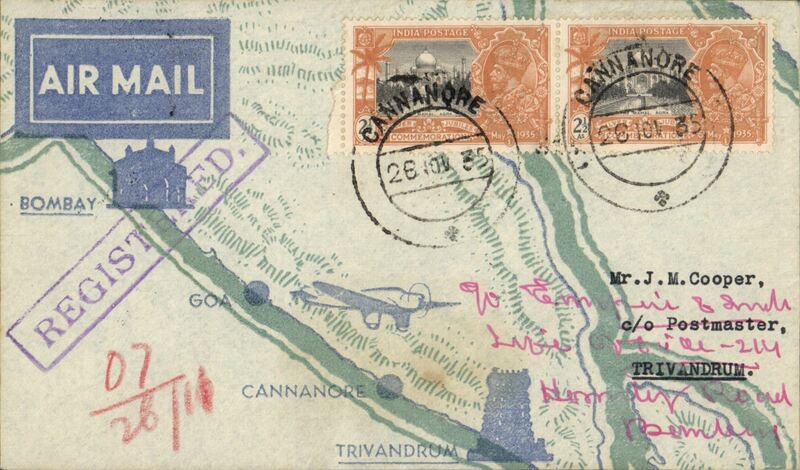 Interrupted Bangkok-Delhi Goodwill Flight by three Siamese Army aircraft, franked 1925 air 10s,15s and 50s, canc special boxed "Goodwil/Flight/Bangkok-Delhi/Dec 22, 1929" depart cachet, registered (label) air cover, typed "By First Air Mail to India". The leading plane crashed early in the flight. 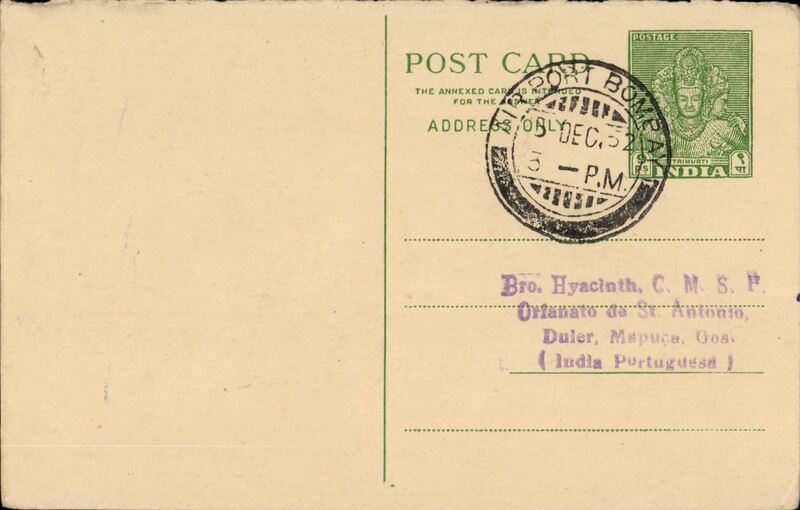 All the mail was rescued and returned to Bangkok and forwarded to Calcutta, bs 15/1, by surface mail. This cover is one of only 9 signed by the pilot Capt Chang Nitinandana in consideration of a donation to the memorial fund for his co-pilot who was killed in the crash. Ni 291222. A nice item in fine condition. 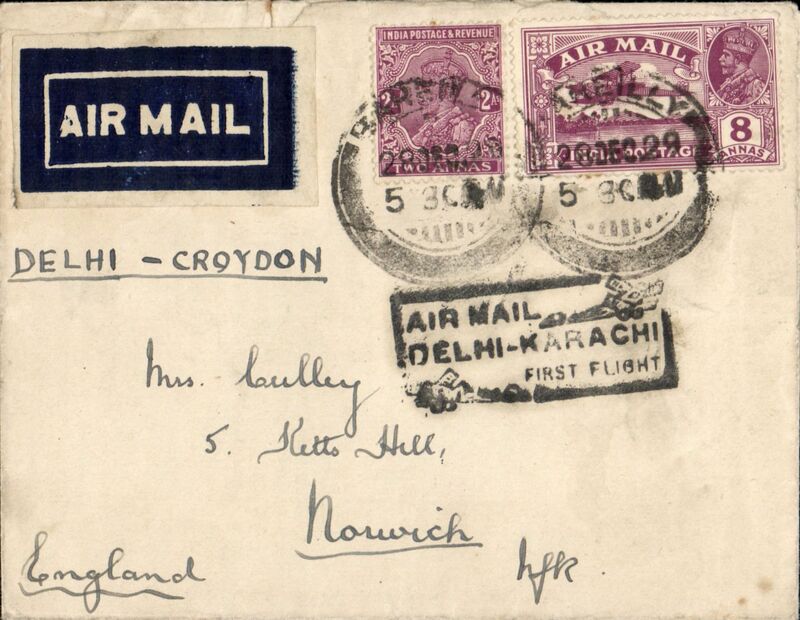 Karachi to Croydon, flight IW38, Karachi to Croydon, franked 8 annas canc (Karachi) 'AERODROME' cds. This is the second earliest recorded. The PO at the aerodrome did not have full status, but was a branch office opened to coincide with the scheduled flights. The cover is grubby and has some rough opening verso. Scarce nevertheless. 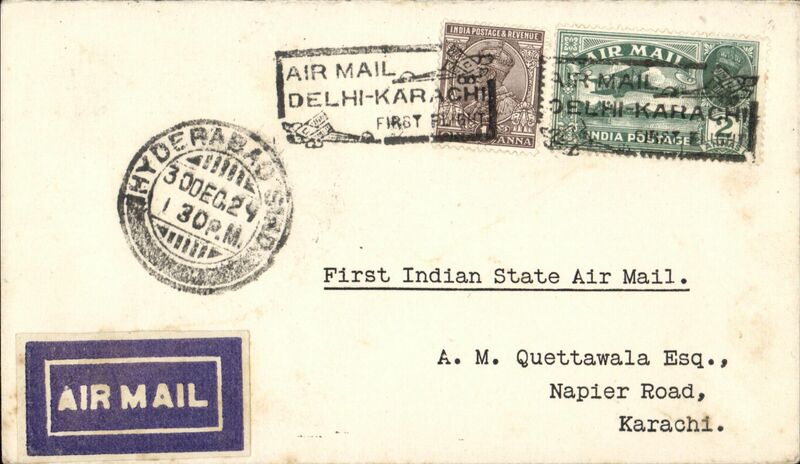 F/F Karachi to Delhi, no arrval ds, franked 3a, black boxed flight cachet,1929 etiquette rated very scarce (Mair), plain cover, typed "First Indian State Air Mail", India State Air Service. India State Air Service/Imperial AW F/F Delhi-London, carried 1st return of Delhi-Karachi service, then Imperial AW to London, nice strike black 'Air Mail/Delhi-Karachi/First Flight' rectangular boxed flight cachet, 1929 etiquette rated scarce by Mair, lain cover franked 10 annas to include the extra air fee of 2 annas. Inauguration of India State Air Service, F/F Karachi to Delhi, black boxed "Air Mail/Karachi-Delhi/First Flight" cachet, plain cover franked 3 annas, 1929 etiquette rated very scarce (Mair), typed 'First Indian State Air Mail'. 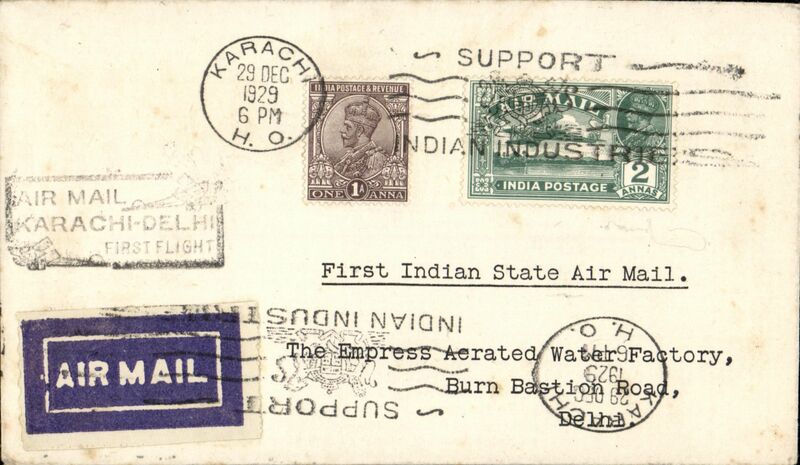 Indian State Air Service, F/F Hyderabad to Karachi, bs 3/12, carried on the Indian Air Service F/F Karachi-Delhi, plain cover franked 3 anna, black boxed "Air Mail/Delhi-Karachi/First Flight" cachet, 1929 etiquette rated very scarce by Mair. Small mail from Hyderabad. Map of route included with this item. Indian State Air Service, F/F Delhi to Karachi, bs 3012, black boxed Delhi-Karachi flight cachet, 1929 etiq rated very scarce by Mair, red/white/blue printed souvenir cover. 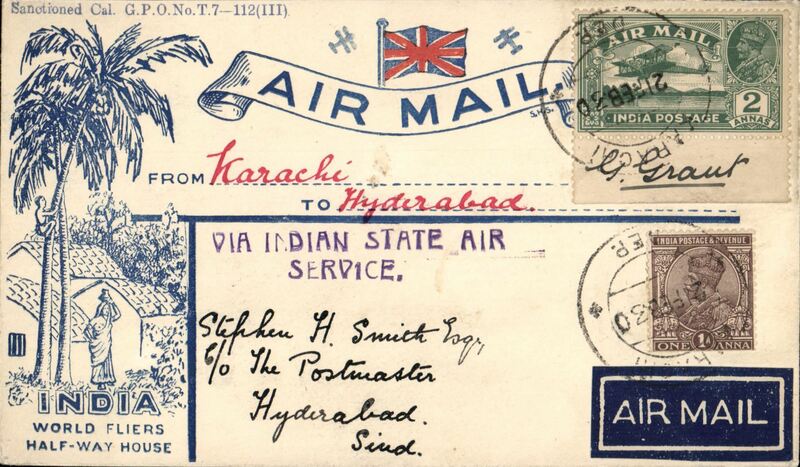 Karachi to Hyderabad, bs 24/2, attractive 'India/World Fliers/Half-Way House' cover franked 2a + 1a canc Karachi cds, black two line 'Via Indian State Air/Service' hs, signed Stephen Smith verso. The edging of the 2a stamp is signed by the stamp's designer G. Grant, who has also signed flap. In 1930 the Indian State Air Service is known to have operated a flight from Karachi to Hyderabad, but we know nothing else about this service. One for the specialist. 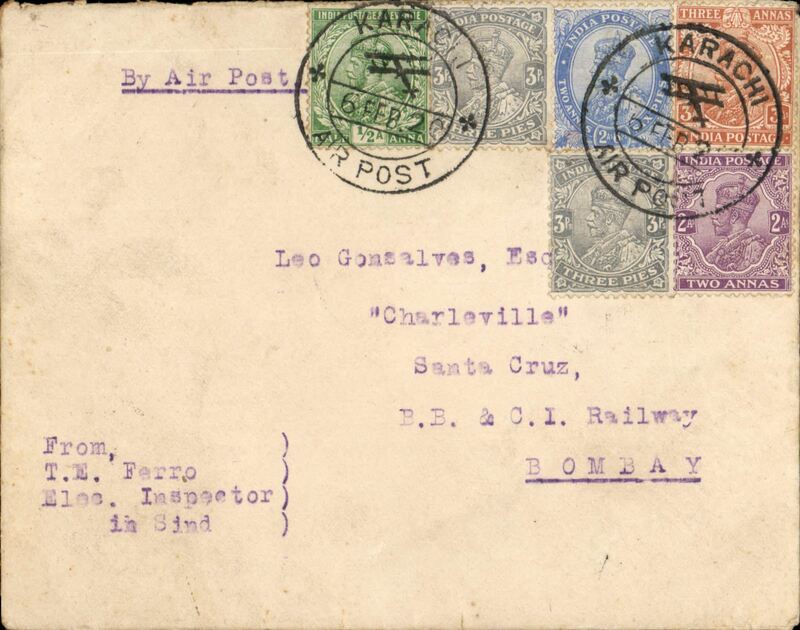 Early underpaid intended airmail, Bombay to Bautzen, Germany, no arrival ds, printed Nayak company cover, typed "By Air Mail", franked 9a, canc Girgaum, Bombay cds, airmail etiquette cover canc blue crayon cross likely applied in Bombay, black 'T' in circle, ms '33 1/3'. very fne strike framed violet "Insufficiently Paid For/India-London Air Service". Ironed vertical crease, otherwise fine. 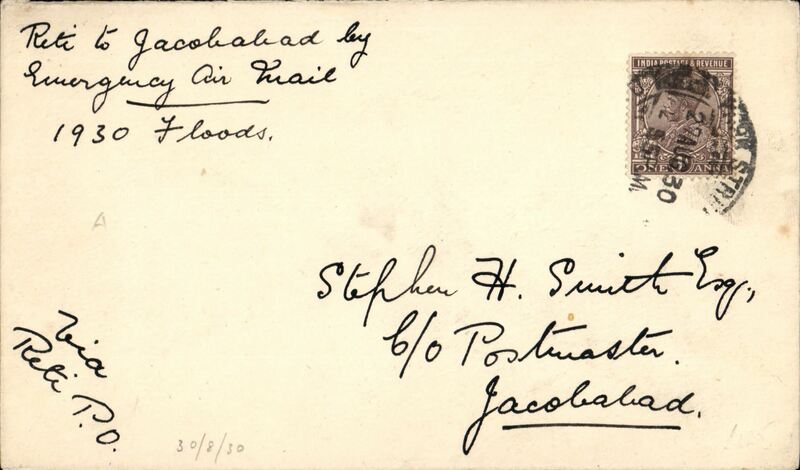 Emergency Flood flight operated by the RAF on account of the floods between Sultankot and Shikapur, 1/2 anna PSC ettiquette cover, franked 1a, sent from Cacutta postmark 2 Sep, flown Riti to Jacobadad, 6 Sep arrival ds on front, violet "Emergency Air Mail" cachet, ms "Jacobadad by Emergency Air Mail", signed Stephen Smith verso. 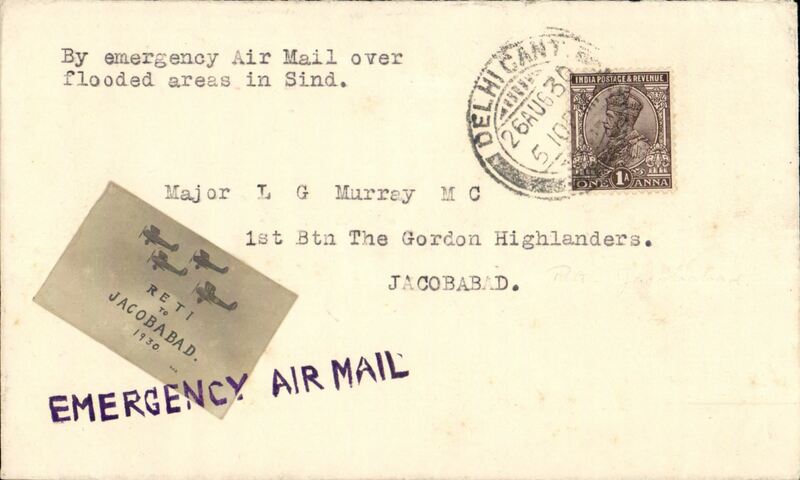 Emergency airmail over flooded areas in Sind, Reti to Jacobabad, bs 28/8 plain cover franked 1 anna canc Delhi Canton cds, attractive black/grey photo label with four RAF planes 'Reti to Jacbabad 1930' tied by violet 'Emergency Air Mail' hs. Signed by Stephen Smith verso (not facsimile). 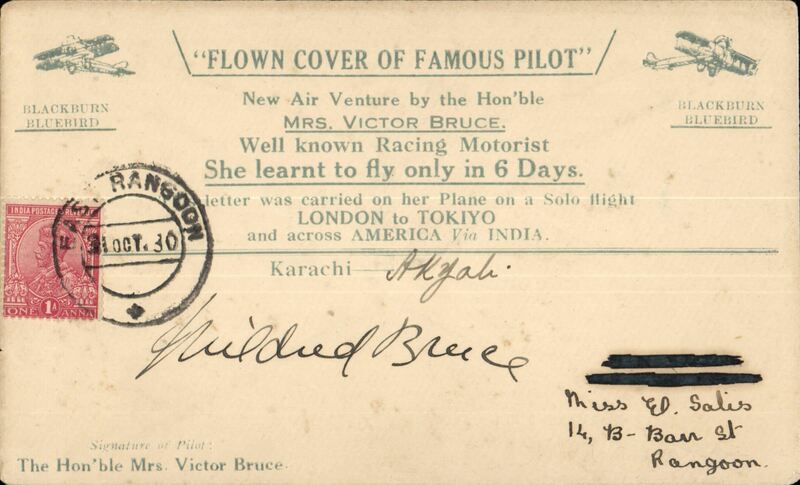 World Flight by Hon Mrs Victor Bruce, cover flown from Karachi to Rangoon (via Akyab) on 29 October 1930, franked 1 anna, cancelled East Rangoon on arrival 31 October, souvenir pale blue/cream cover, inscribed: ‘FLOWN COVER OF FAMOUS PILOT’ / New Air Venture by the Hon’ble / MRS. VICTOR BRUCE / Well known Racing Motorist / She learnt to fly only in 6 Days / This letter was carried on her Plane on a Solo flight / LONDON to TOKIYO / and across America Via India. Two depictions of an aeroplane above BLACKBURN BLUEBIRD” and signed Mildred Bruce above Signature of Pilot: / The Honorable Mrs Victor Bruce. A B&W picture (not photo), 10x8cm, showing Hon. Mrs Victor Bruce being greeted on arrival at Akyab aerodrome accompanies this item. 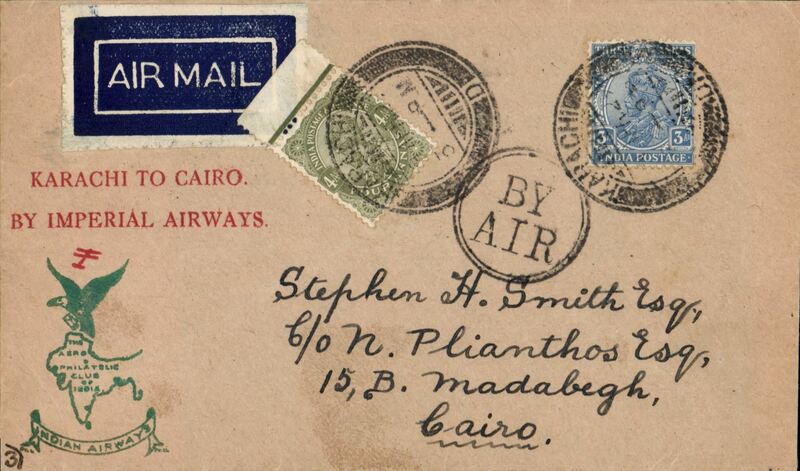 Intally (Calcutta) to Aswan, Egypt, bs 1/3, via Cairo/Par Avion 2*/2, India acceptance for carriage on the inaugural London to East Africa service, attractive dark blue/buff Aero Philatelic Club of Calcutta cover, franked 8 1/2 annas, blue/white etiquette rated scarce by Mair, Imperial Airways. 2cm closed top edge tear, hardly visible - see scan. 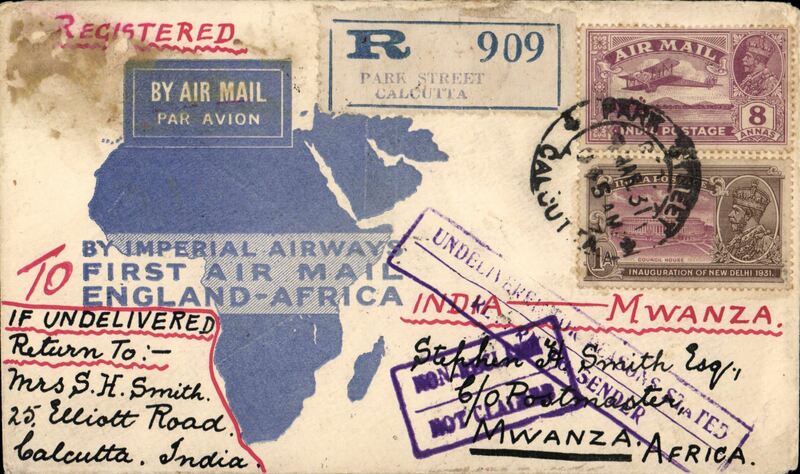 Jodhpur to Kampala, Uganda, bs 9/3, India acceptance for carriage on the inaugural London to East Africa service, attractive dark blue/buff Aero Philatelic Club of Calcutta cover, franked 10 1/2 annas, blue/white etiquette rated scarce by Mair, Imperial Airways. 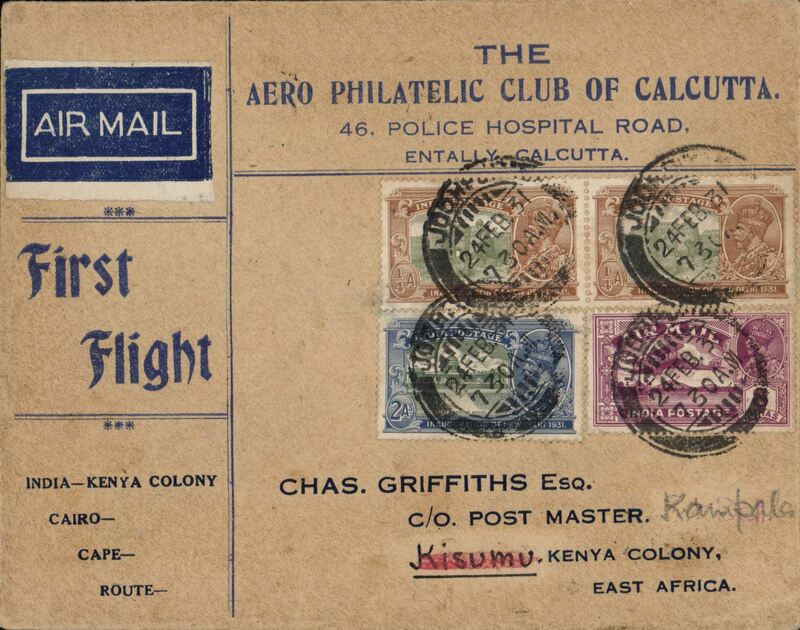 Jodhpur to Kampala, Uganda, bs 11/3 via Cairo 4/3 and Kisumu 10/3, India acceptance for carriage on the inaugural London to East Africa service, attractive dark blue/buff Aero Philatelic Club of Calcutta cover, franked 10 1/2 annas, blue/white etiquette rated scarce by Mair, Imperial Airways. 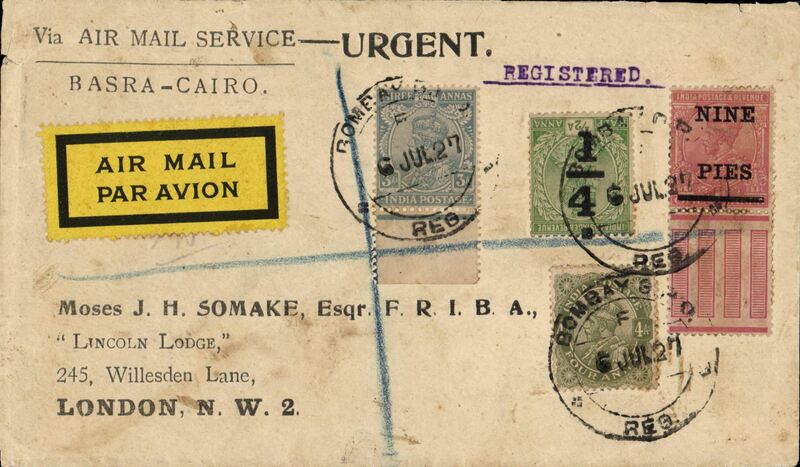 Persian Coast acceptance for the first southbound London-East Africa service, Gwadur to Wadi Halfa, 6/3, for despatch from India to East Africa, carried Karachi/Cairo via Basra, 26/2 transit cds, then first Cairo/Mwanza service, for 6 1/2 annals Indian stamps, Aero Philatelic Club of Calcutta cover, printed "Gwadur- (ms 'Sudan')", Imperial Airways. Scarce (see Donaldson 1975). 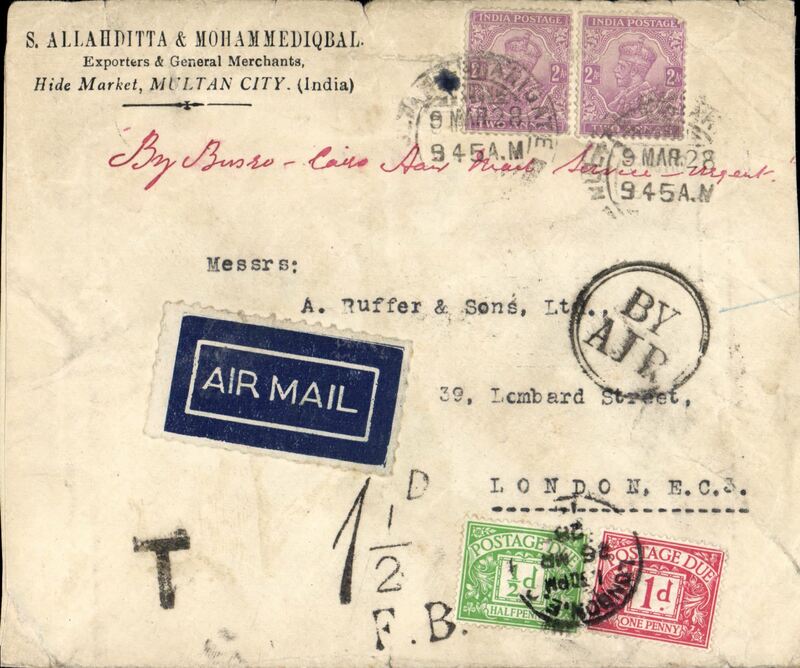 First dispatch of mail from India to East Africa entirely by air, Bombay to Dar Es Salaam, bs 25/3, via Mwanza 23/3, registered (label) souvenir map cover franked 13 annas, carried by Trans-Indian Air Service to Karachi, then Imperial AW Eastern service to Cairo, then on F/F IAW London to East Africa service to Mwanza. Some damage top lh corne causing two small holes on front only, otherwise fine (see scan). 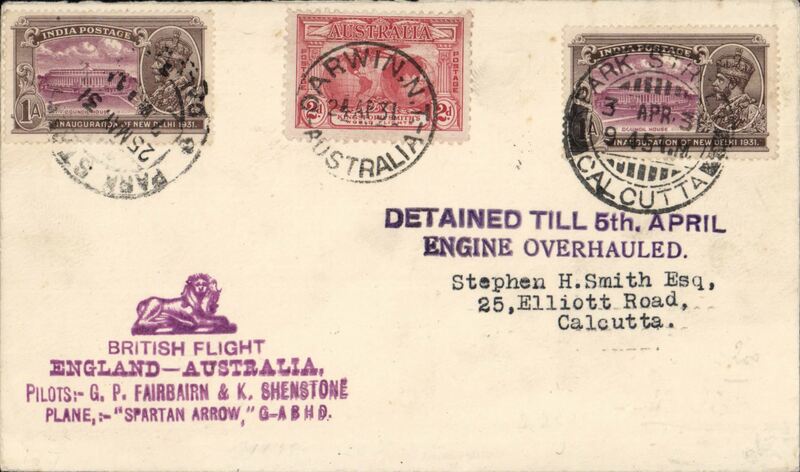 Fairburn and Shenton, Calcutta to Darwin leg their England to Australia flight, cover carried in the "Spartan Arrow" with India 1a franking tied by despatch cds, Australia 2d tied by Darwin cds. 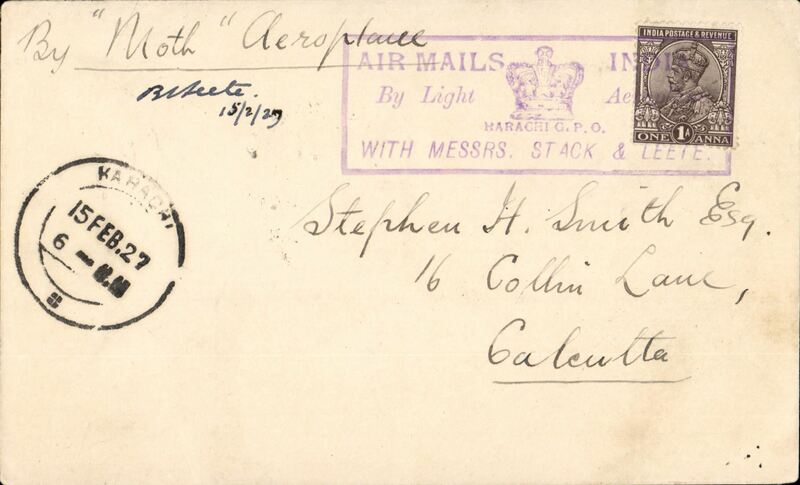 (24 Apr) and returned to Calcutta and franked with another 1a tied by Calcutta cds (25 May) for inland postage to Stephen Smith (signed on reverse), violet "DETAINED TILL 5th APRIL/ENGINE OVERHAULED" and "Lion/BRITISH FLIGHT/ENGLAND-AUSTRALIA" cachet. The aircraft was involved in a crash at Darwin. 43 flown. Scarce item in fine condition. Also B&W photo, (13x8cm), of both pilots in the cockpit of their plane. 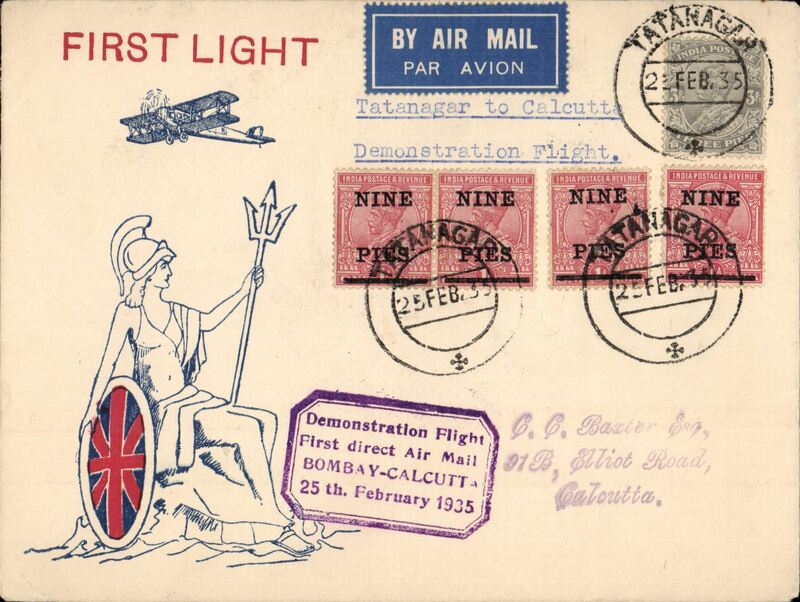 First experimental flight Delhi to Victoria Point, Burma, bs 22/4, red/buff printed 'England-Australia via India' souvenir cover franked 6 annas canc fine strikes New Delhi cds, only 30 covers carried on tis stage. 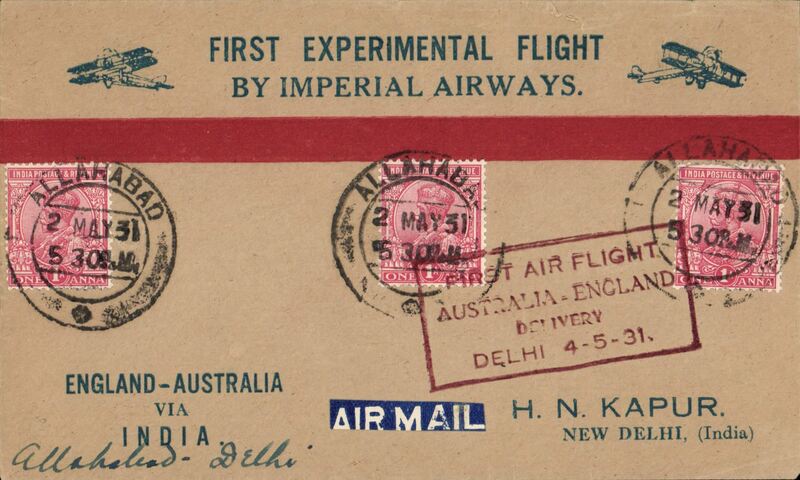 India to Tasmania, first experimental flight England-Australia, India-Australia leg, Karachi to Hobart, bs 31/4, via Darwin 25/4, franked 8 annas, typed endorsement "By First India-Australia Air Mail", dark blue/white etiquette. Plane crashed at Kupang, mail picked up by Kingsford Smith and carried to Darwin in the Southern Cross. Nice item. 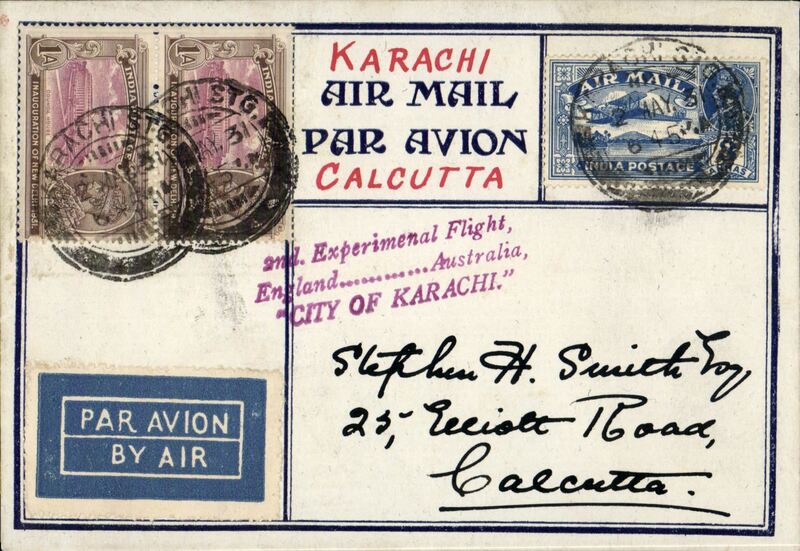 Karachi to Darwin, bs 25/4, first experimental flight England-Australia, India-Australia leg, attractive 'Aero Philatelic Club of Calcutta' registered (label) souvenir cover franked 21 annas, dark blue/white etiquette. Plane crashed at Kupang: mail picked up by Kingsford Smith and carried to Darwin in the Southern Cross. Nice item. 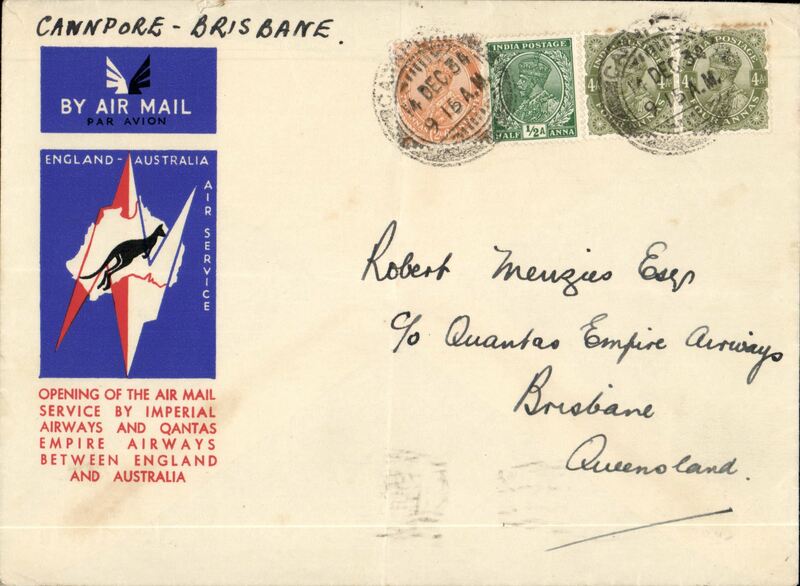 Imperial Airways 1st experimental flight England-Australia, Calcutta to Rangoon, bs 15/4, attractive 'World Fliers' printed souvenir cover, franked 4 annas, canc Calcutta cds, violet boxed 'First Airmail/Burma-Australia' cachet, also fine strike three line 'Via Imperial Airways/1st Experimental Flight/England to Australia' cachet, signed facsimile Stephen Smith verso. 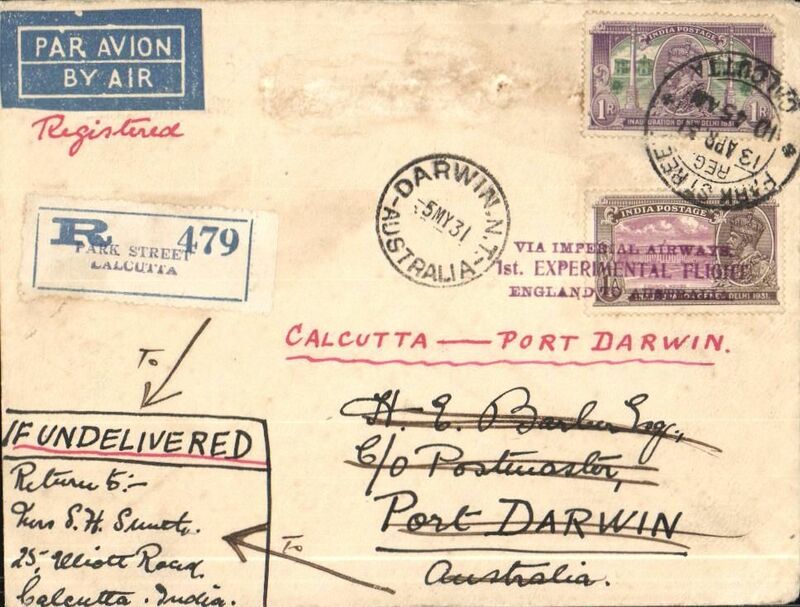 First experimental flight England-Australia, India-Australia leg of Imperial Airways, Calcutta to Darwin, bs 25/4, registered (label) cover franked 1R 1anna, canc Calcutta cds, ms endorsement "Calcutta to Port Darwin", dark blue/white etiquette, Imperial AW.Slight mottling near centre top edge. See scan. 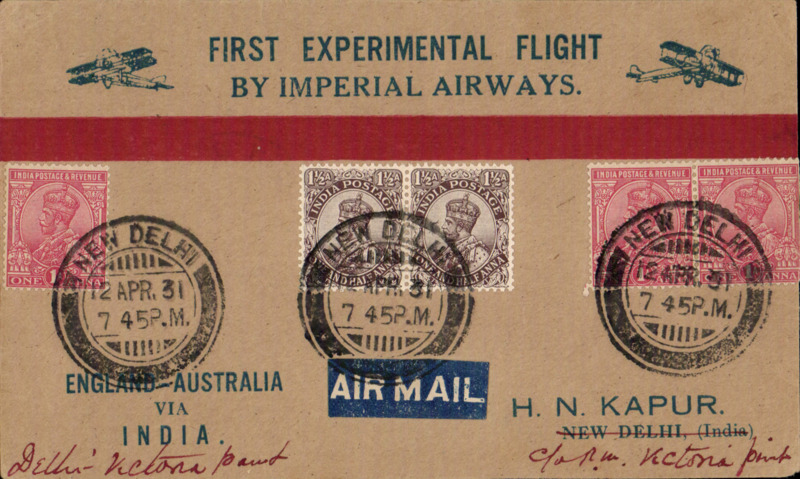 Return First Experimental England-Australia flight, Calcutta to Delhi, special red boxed "First Flight/Australia-England/Delivery/Delhi 4-5-31" arrival cachet on front, red/biff/blue "First Experimental Flight/By Imperial Airways" Kapur souvenir cover, franked 3a, Imperial Airways. 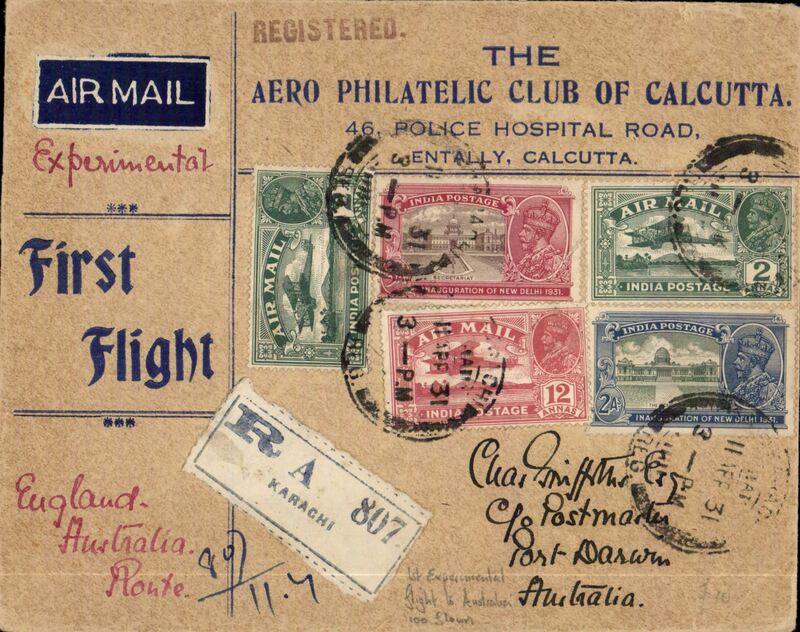 Small mail - only 123 were flown from Calcutta to Delhi. Tiny closed nick rh side. 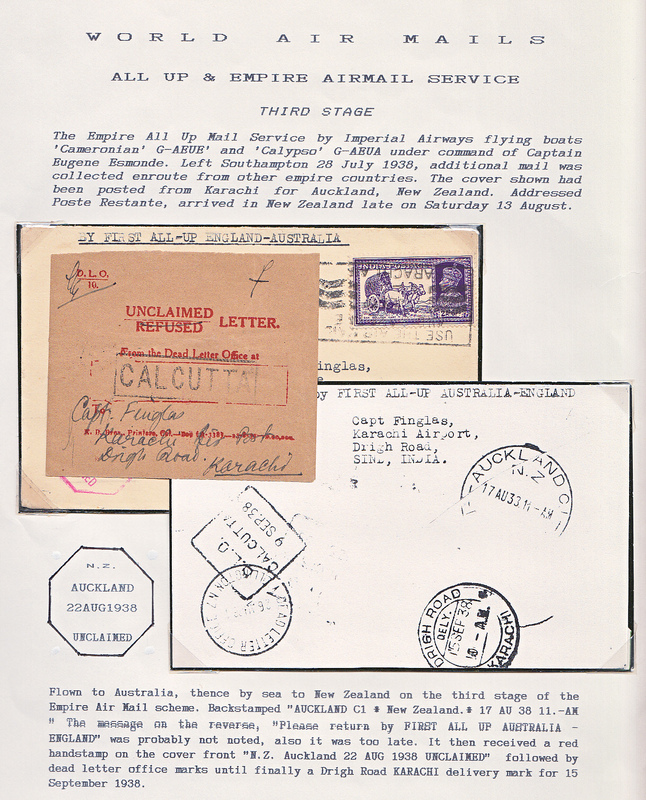 A ten page photocopy of article by Stephen Smith detailing dispatches from India on the 1st and 2nd England-Australia flights and published in the Monthly Bulletin of the Indian Airmail Society accompanies this item. 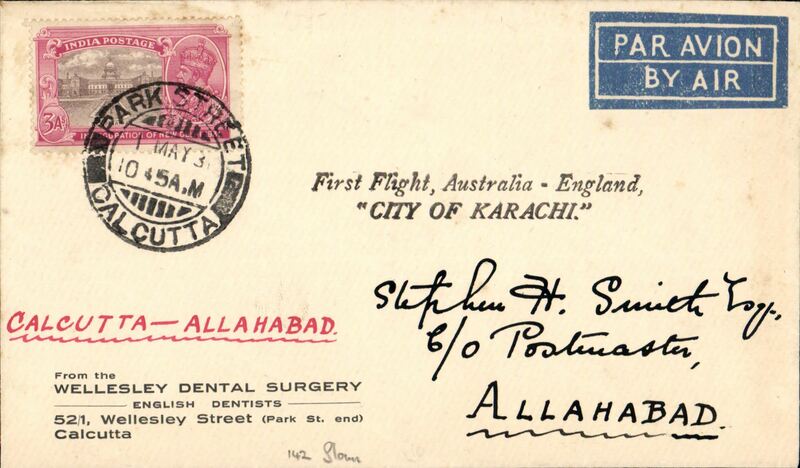 Return First Experimental England-Australia flight, Calcutta to Allahabad, bs 4/5, franked 3annas, fine strike violet two line "First Flight, Australia-England/City of Karachi", printed Wellesley Dental Surgery corner cover addressed in hand of Stephen Smith. 142 items were collected from Calcutta for Allahabad. 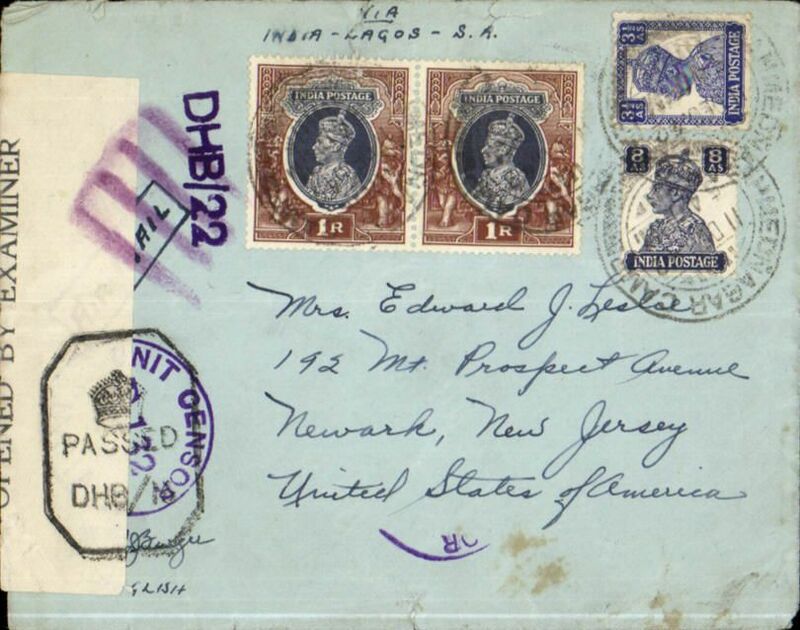 Return First Experimental England-Australia flight, Allahabad to Delhi, red/blue/buff Kapur souvenir cover, franked 3 annas, red boxed "First Air Flight/ Australia-England/Delivery/Delhi 4-5-31" arrival ds on front.. 50 flown. 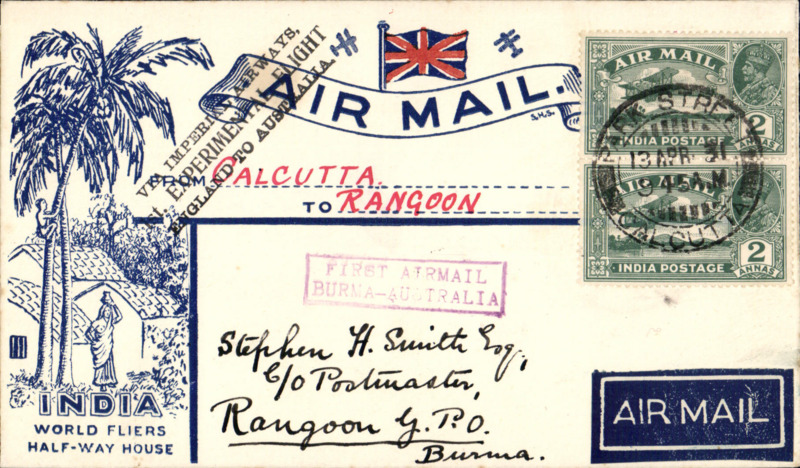 Return First Experimental England-Australia flight, Calcutta to Allahabad, bs 5/5, red/blue/buff 'Aero Philatelic Club of Calcutta' souvenir cover, franked 3 1/2 annas, Imperial Airways. 142 items were collected from Calcutta for Allahabad. A ten page photocopy of article by Stephen Smith detailing dispatches from India on the 1st and 2nd England-Australia flights and published in the Monthly Bulletin of the Indian Airmail Society accompanies this item. 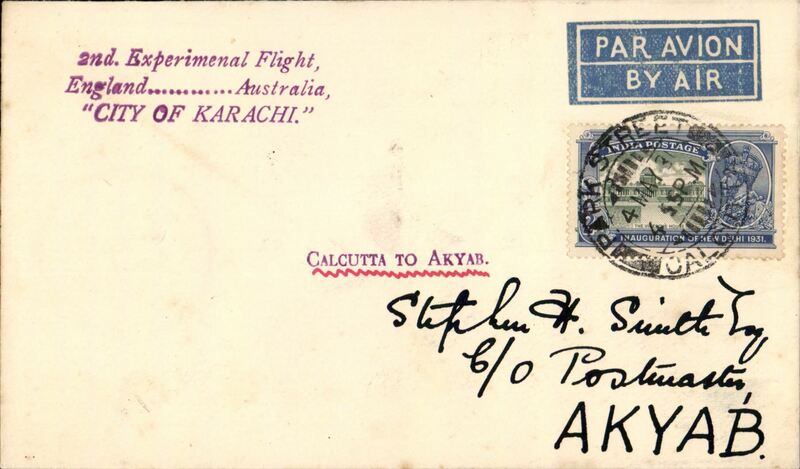 2nd Experimental England-Australia flight, Calcutta to Akyab, bs 6/5, plain cover franked 4a, very fine strike magenta "2nd Experimental Flight/England.......Australia/City of Karachi" and "Calcutta to Akyab" cachets, addressed and signed by Stephen Smith, also also BB Joffe authentication hs. Only 20 pieces carried. 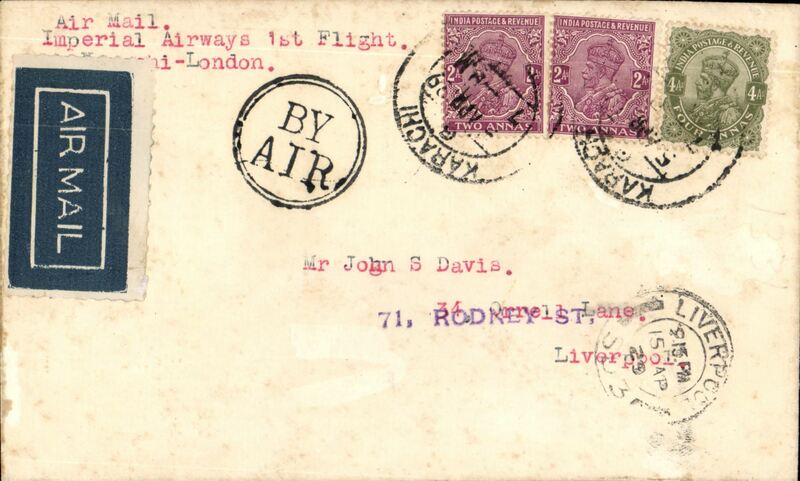 Westbound 2nd Experimental England-Australia flight, Calcutta to Allahabad, bs 26/5, plain cover franked 3a, fine strike violet "Asmani Ghari/Carried by the West Australian/Airways Air Liner, V.H.UJD/Pilot; Mr R.R.Mullard", addressed and signed by Stephen Smith. 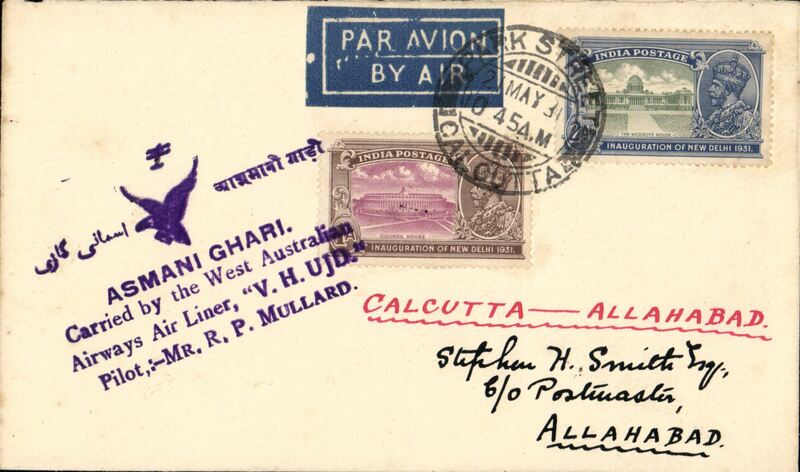 Westbound 2nd Experimental England-Australia flight, Allahabad to Delhi, bs 26/5, franked 3a, fine strike violet "Asmani Ghari/Carried by the West Australian/Airways Air Liner, V.H.UJD/Pilot; Mr R.R.Mullard", addressed and signed by Stephen Smith . Several tiny worm holes, otherwise fine. See scan. Return 2nd Experimental England-Australia flight, Calcutta to Karachi, bs 27/5, attractive and unommon red/white/blue "Britannia with trident and Union Jack shield" Baxter souvenir cover with blue 'JB' embossed logo on flap and black "Australia-England/ Second Official/Trial Flight/Calcutta-Karachi" cachet, franked 5a, black framed Karachi Delivery/27 May 31 hs. 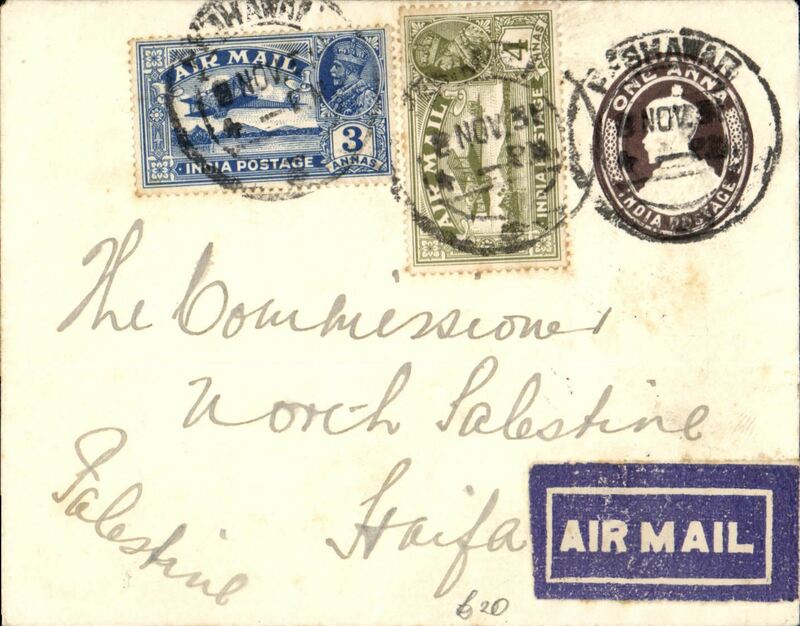 Early airmail from India to Palestine, Peshawar to Haifa bs14/11,1anna PSE with additional 7anna, dark blue/white etiquette. Delhi Flying Club, F/F Karachi to Delhi, bs 5/1, plain buff cover, franked 3 anna 3p, magenta two line "First Flight/Delhi Flying Club", Stephen Smith signature hs verso. 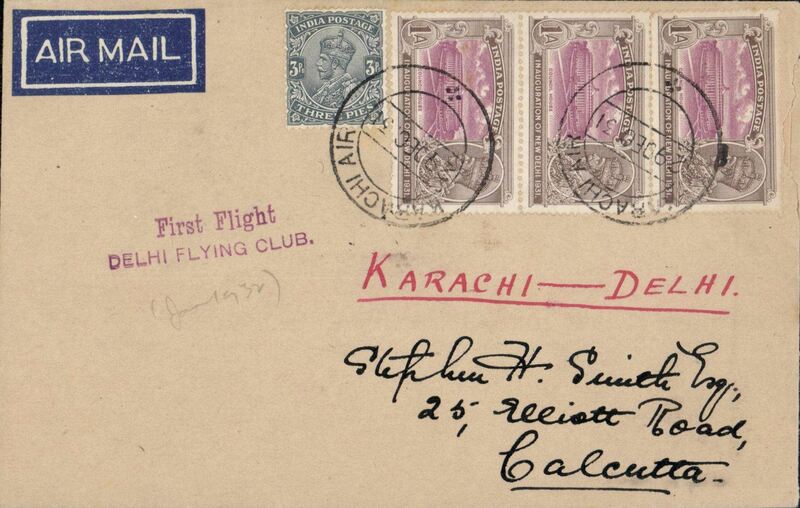 Delhi Flying Club, F/F Karachi to Delhi, bs 3/1, airmail etiquette cover, franked 3 anna 3p, fine strike magenta two line "First Flight/Delhi Flying Club", Stephen Smith signature verso. 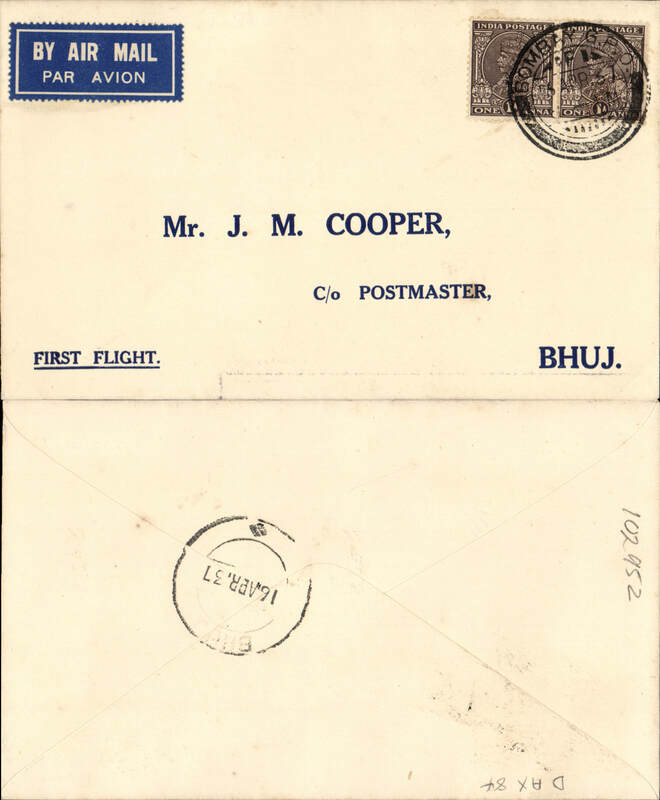 The Imperial Airways’ route from London to Delhi via Jodhpur was flown by the Delhi Flying Club beginning 2nd January 1932. The Club continued to provide this service until 4 July 1933, when Indian Trans-Continental Airways introduced its Karachi-Calcutta service. 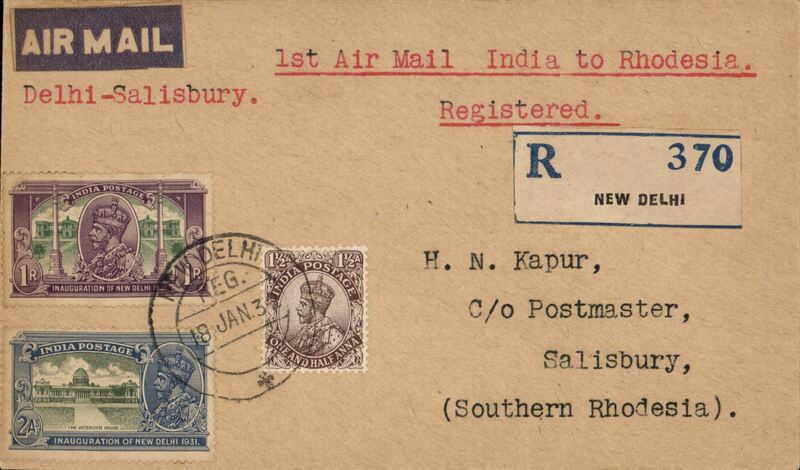 Delhi Flying Club/Imperial Airways, first direct airmail from Delhi to Southern Rhodesia, Delhi to Salisbury, bs 31/1, registered (label) cover franked 1R 3 1/2a, canc New Delhi cds, typed 'Delhi-Salisbury'. 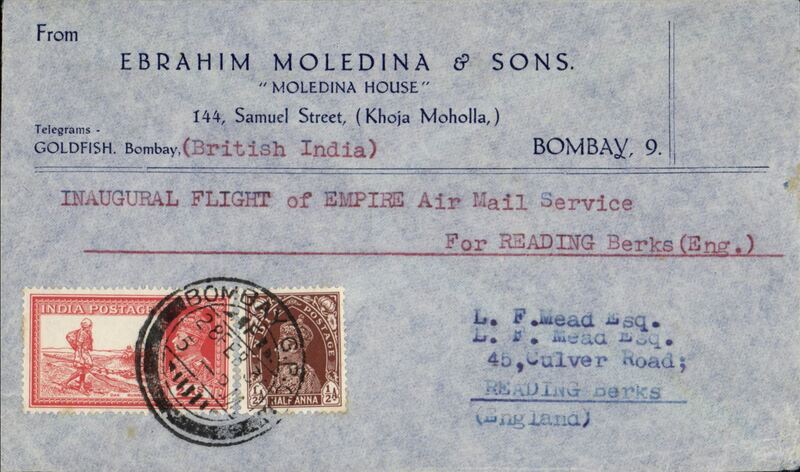 First acceptance of mail for Southern Rhodesia on the Delhi-Karachi service, then carried from Cairo on the F/F Imperial Airways Regular Service from London to Cape Town. Only 29 acceptances from India for Salisbury. Of these 19 were from Delhi, see Airmails of British Africa, p50. Superb double first flight item. 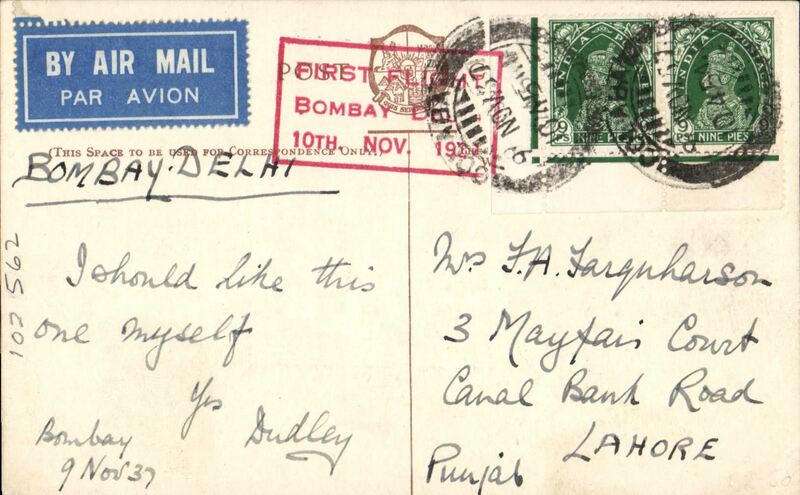 Delhi Flying Club/Imperial Airways, first direct airmail from Delhi to Johannesburg, bs 1/2 registered (label) cover franked 1R, 4 annas, 18p, canc New Delhi cds, typed 'Delhi-Johannesburg'. 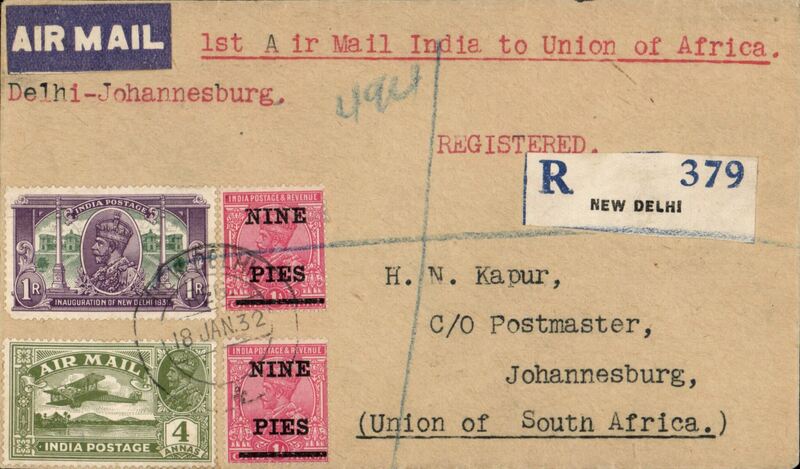 First acceptance of mail for South Africa on the Delhi-Karachi service, then carried from Cairo the F/F Imperial Airways Regular Service from London to Cape Town. Only 14 carried. Superb double first flight item. Viceroy Cup Air Race at Delhi, cover to Calcutta franked 15p and cancelled on arrival, special green/red label affixed giving details of the 12 participants tied by two line "Flown/Feb 20.1932" hs and signed by the pilot R.N.Chawla and sponsor S.G.Goenka, who entered a Gypsy 1. On 20 and 21 February 1932, the first all-India civil aviation meeting was held at Delhi. A race for the Viceroy's Cup was held on the first day and an air display on the second. The race was over a course of 709 miles, starting at Delhi and flying by way of Agra, Jhansi, Lucknow and back to Delhi. There were landing controls at Agra and Lucknow. Twelve competitors took part, six British (of which two were women) and six Indian. Ref Jeffrey Brown's 1995 Edition of Indian Air Mails. 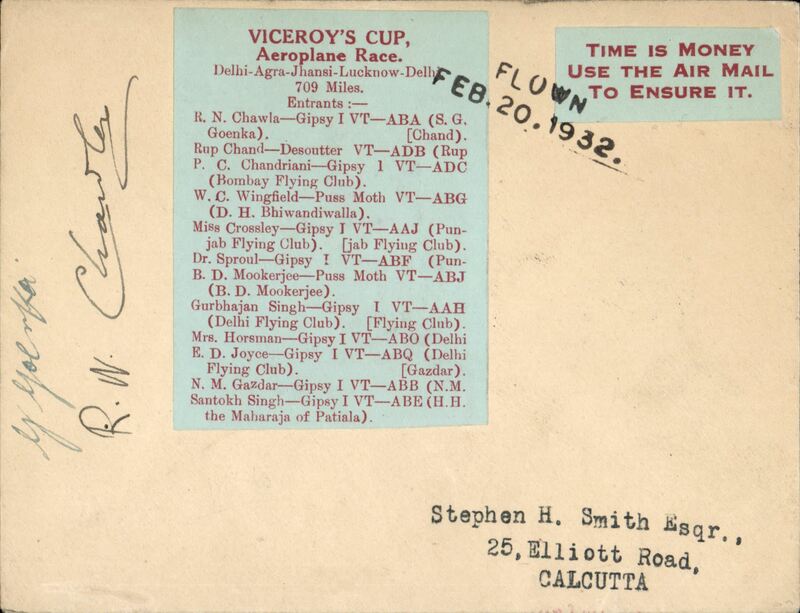 Viceroy Cup Air Race at Delhi, cover to Calcutta franked 5x 3p verso and cancelled 21/2/32 on arrival, special green/red label affixed giving details of the 12 participants tied by two line "Flown/Feb 20.1932" hs and signed by the pilot R.N.Chawla and sponsor S.G.Goenka, who entered a Gypsy 1. Francis Field authentication hs verso. 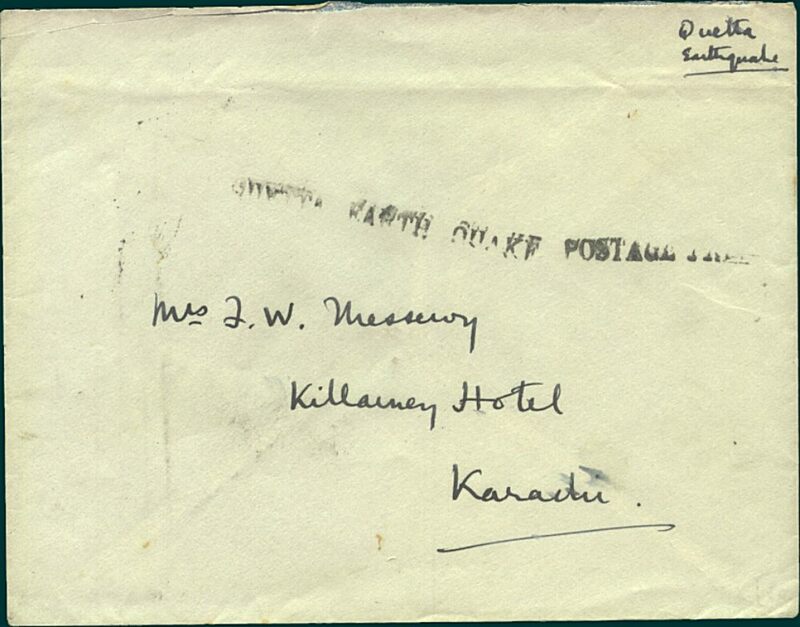 Rough proof of the official envelope designed, signed and dated 13/7/32 by Stephen Smith for the inauguration of the new Tata Karachi-Maras service. It was red and blue and showed a Union Jack over the map of India. It was approved for sale by Tata on 27 June 1932 but was withdrawn from sale 11 days later - being deemed unpatriotic for an Indian venture. Nice item in fine condition. 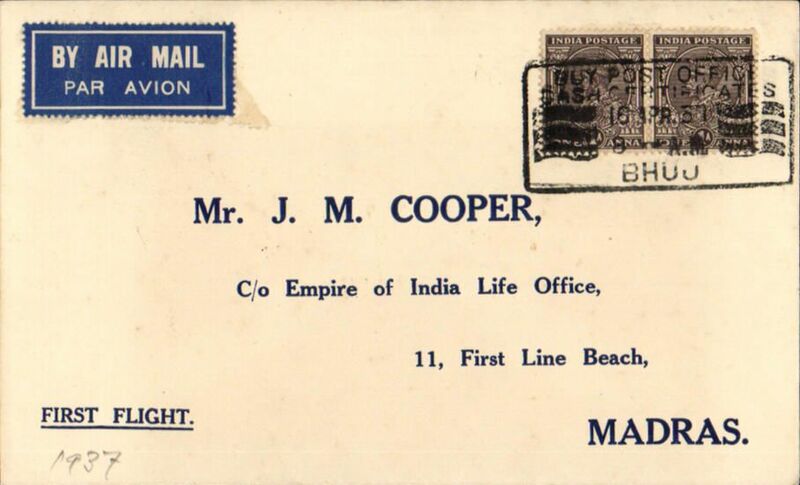 Imperial Airways, OHMS airmail etiquette initialled 'Director of Civil Aviation in India' corner cover with embossed 'Govternment of India' logo on flap, addressed to the Air Ministry, London, no arrival ds, franked 8a, 2a, 1/2a 'Service' opts, canc Simla dr cds. 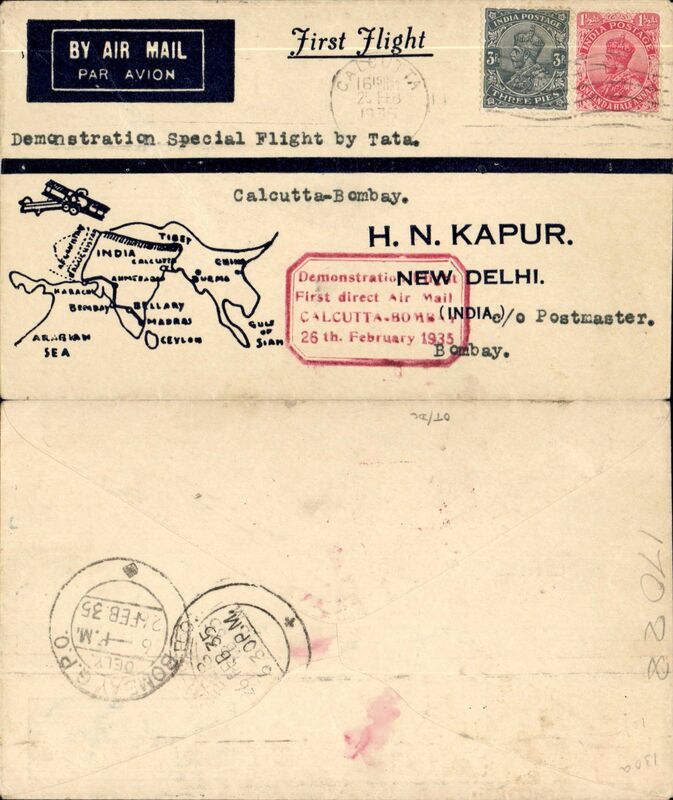 TATA take over mails from IAW for Karachi-Madras route, London to Bombay, bs 15/10, buff cover, franked 8d, black 'Karachi to Madras/15 Oct 32/ First Airmail' cachet, etiquette cancelled by fine black double cross Jusqu'a applied at Bombay, "By Indian Air Mail/and by Air in India" hs, flown by Neville Vincent, Newall 60u. 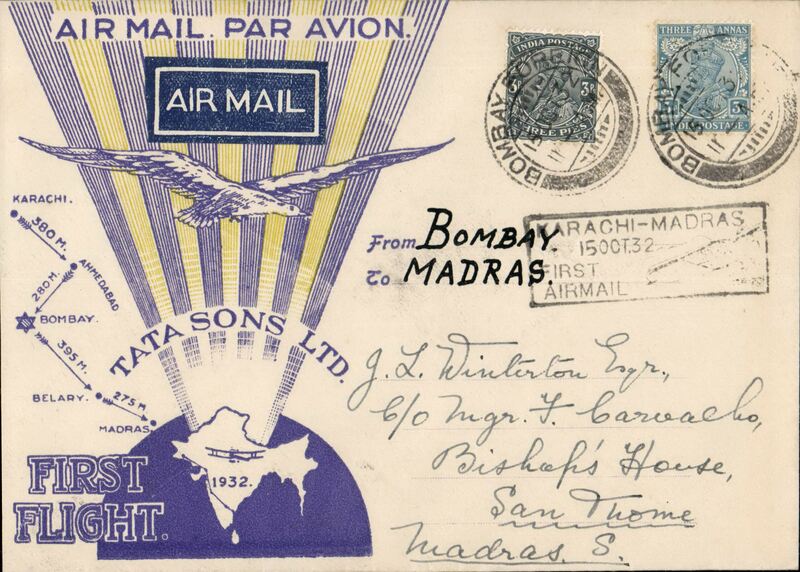 TATA take over mails from IAW for Karachi-Madras route, F/F Bombay to Ahmedabad, bs 19/10, special TATA cover with yellow rays and no Union Jack, franked 3anna 3p, black boxed 'Madras-Karachi/First Air Mail/18 Oct 32' cachet, signed Stephen Smith verso. Flown by Neville Vincent, Newall 60u. 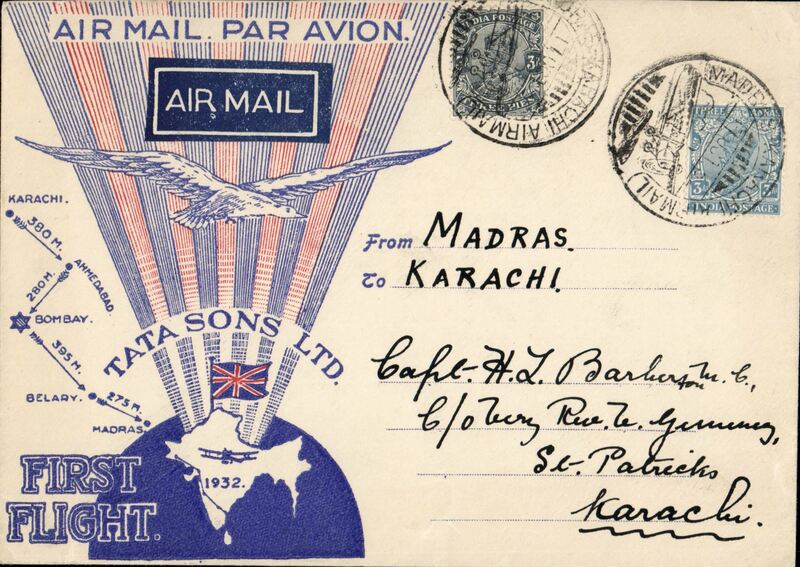 F/F Karachi-Madras, bs Saidapet 16/10 carried on the inaugural Karachi to Madras service, black boxed ' Karachi-Madras/15 Oct 32/First Airmail' flight cachet on front, plain cover, franked 3 annas 6p, canc Karachi Air cds. Bears signature 'J.R.D.Tata/Pilot/15.10.32'. 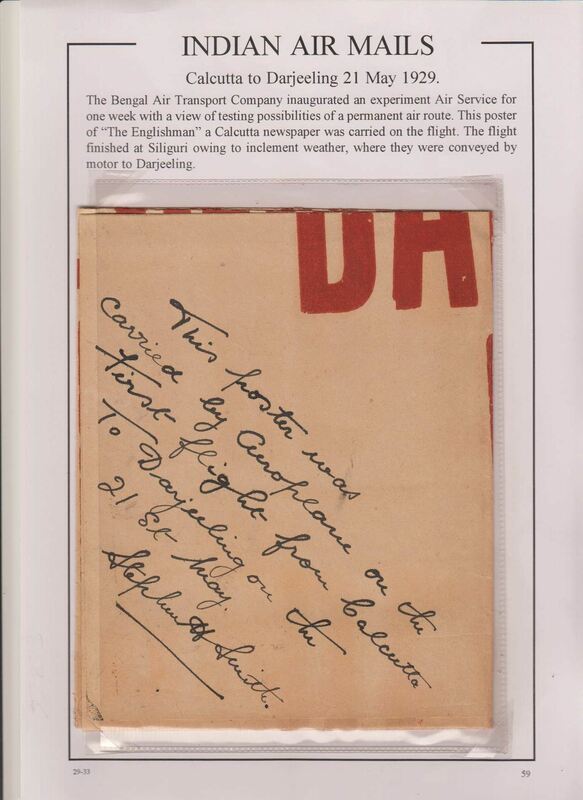 PLEASE NOTE: An eminent Indian aerophilatelist has questioned the authenticity of the signature on this item and has kindly drawn our attention to three genuine signatures featured on his JRD Tata gallery web-site http://www.airindiacollector.com/jrd-tata-gallery.html .We have now concluded that the signature on Lot 295 is not genuine have amended the original description and price accordingly. 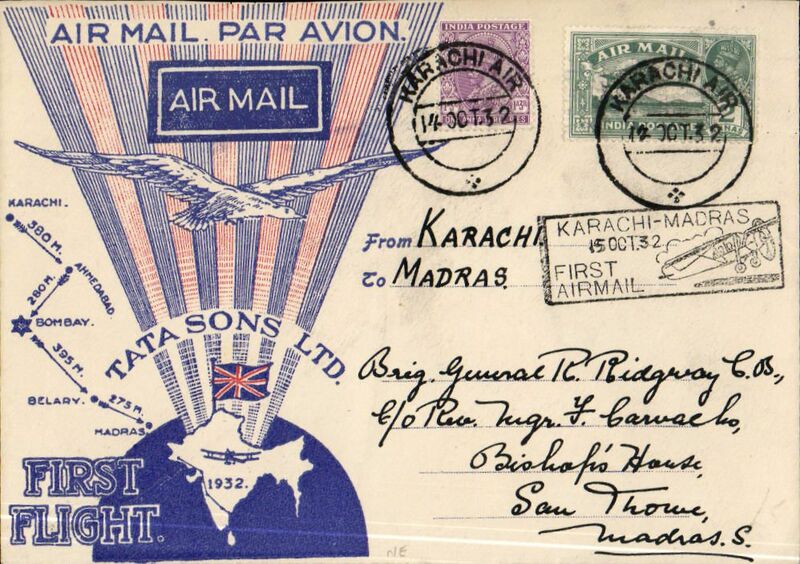 TATA & Sons Ltd, F/F Karachi-Madras, bs 16/10 carried on inaugural Karachi to Madras service, black boxed ' Karachi-Madras/15 Oct 32/First Airmail' flight cachet on front, special TATA souvenir cover with red rays and Union Jack, franked 3 annas 3p, canc Karachi Air cds. Signed Stephen Smith verso. F/F Karachi to Bombay, bs 15/10, boxed Karachi-Madras cachet, printed black & white souvenir cover, franked 2a 6p, and 9p, scarce dark blue/white etiquette cancelled by fine black Bombay "double cross" jusqu'a (black usage uncommon, see McQueen p97), TATA. TATA & Sons Ltd, F/F Bellary to Madras, bs 16/10, carried on inaugural Karachi to Madras service, attractive Phlatelic Magazine London cover, franked 2 1/2anna 3p, canc black boxed ' Karachi-Madras/16 Oct 32' cachet used as postmark which also ties etiquette, Bellary 16/10 cds verso. 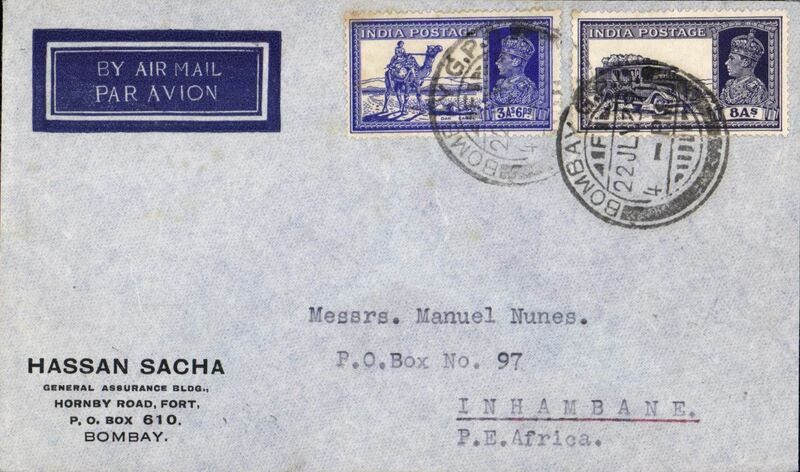 India 1932, Oct 17 First acceptance of African mail from India, Bombay to Mwanza, b/s 31/10, carried on F/F TATA Madras - Karachi feeder service connecting with IAW Karachi-London flight IW 185, then at Cairo (bs 21/10) with IAW London-Cape Town flight AS 86 (see Wingent), then surface to Mwanza via Dar-Kigoma TPO 30/10, black boxed Madras-Karachi cachet, white on indigo etiquette rated scarce by Mair, attractive Aero-Philatelic Club of Calcutta envelope with coloured route map verso. Small mail, nice exhibit item. First acceptance of Iraq mail from India, Bombay to Rutbah Wells, b/s 24/10, via Baghdad 21/10, carried on F/F TATA Madras - Karachi feeder service connecting with IAW Karachi-London flight IW 185 (see Wingent), boxed "Madras-Karachi/18 Oct 32" flight cachet, white on indigo etiquette rated scarce by Mair, attractive Aero-Philatelic Club of Calcutta envelope with coloured route map verso, franked 5 1/2 annas and 3p. Small mail, nice exhibit item. 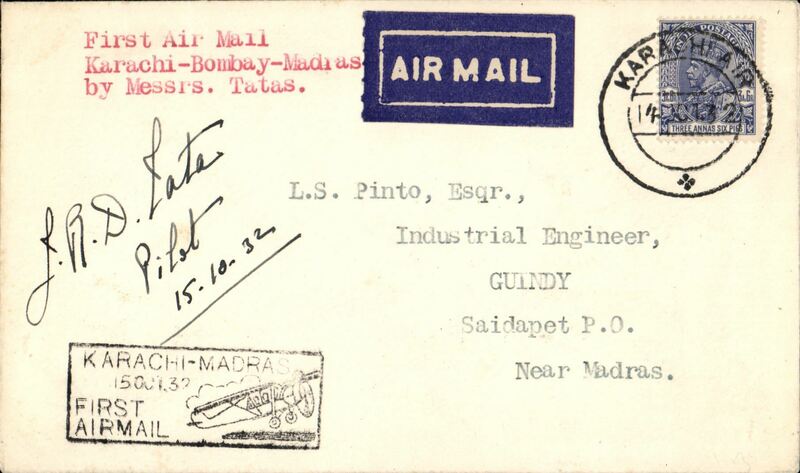 TATA take over mails from IAW for Karachi-Madras route, F/F Madras to Karachi, bs 19/10, special TATA cover with red rays and Union Jack, franked 3 anna 3p, canc special 'Madras-Karachi Airmail' cds, black boxed 'Madras-Karachi/First Air Mail/17 Oct 32' cachet verso, signed Stephen Smith verso. Flown by Neville Vincent, Newall 60u. 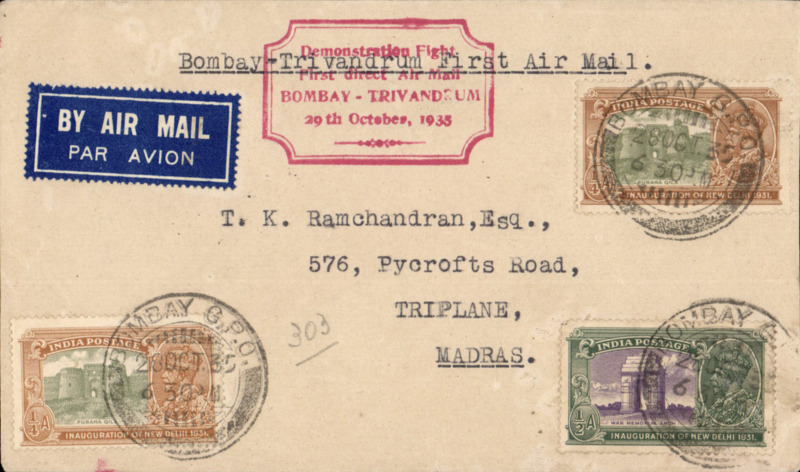 Tata Sons Ltd, F/F Madras to Bombay, bs 18/10, imprint airmail etiquette cover franked 3a3p canc Bellary cds, etiquette cancelled by red double cross Jusqu'a applied in Bombay, black framed 'Madras-Karachi/18 Oct 32 flight cachet used in Bombay only, signed by the pilot Neville Vintcent. 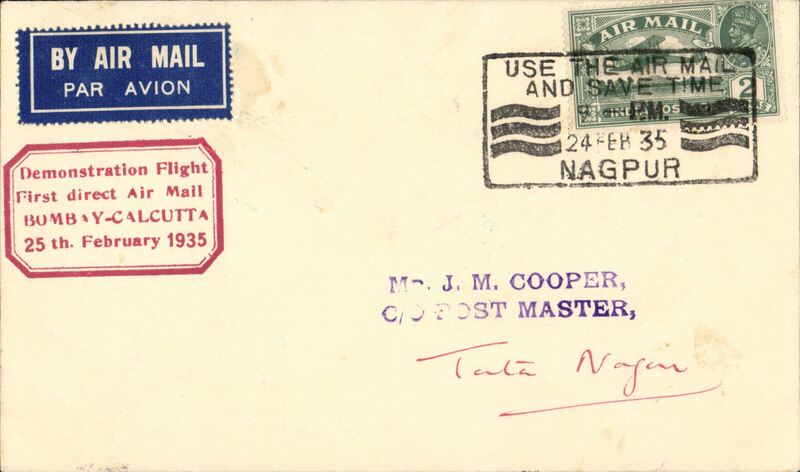 TATA take over mails from IAW for Karachi-Madras route, F/F Bellary to London, Anglesey 25 Oct 32 arrival ds on front, special TATA cover with yellow rays and no Union Jack, franked 3 anna 3p, signed Stephen Smith verso. Flown by Neville Vincent, Newall 60u. Carried by Tata from Bellary-Karachi, then IAW to London. 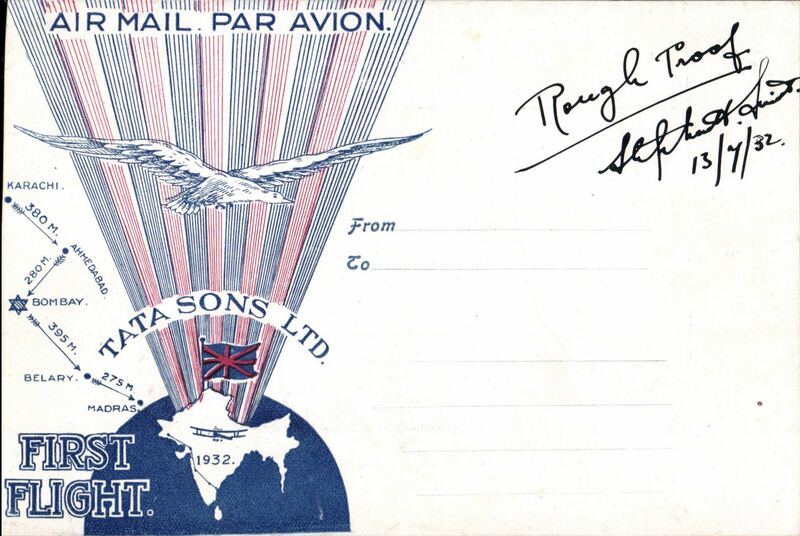 TATA take over mails from IAW for Karachi-Madras route, F/F Madras to London, bs Kensington 25 Oct 32 cds, special TATA cover with yellow rays and no Union Jack, franked 11 anna 6p, black boxed 'Madras-Karachi/First Air Mail/17 Oct 32' cachet and signed Stephen Smith verso. Flown by Neville Vincent, Newall 60u. Carried by Tata from Madras-Karachi, then IAW to London. 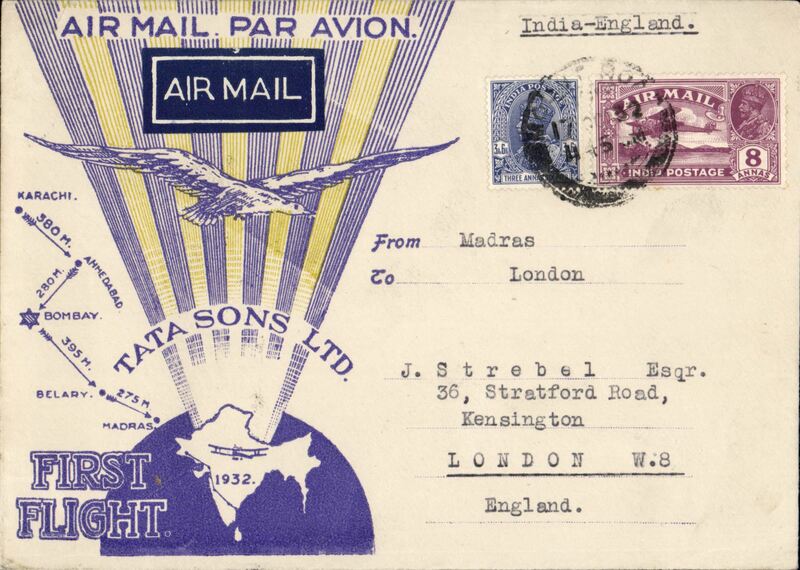 TATA take over mails from IAW for Karachi-Madras route, F/F Bombay to London, no arrival ds, special TATA cover with yellow rays and no Union Jack, franked 3 anna 3p, black boxed 'Madras-Karachi/First Air Mail/18 Oct 32' cachet, signed Stephen Smith verso. Flown by Neville Vincent, Newall 60u. Carried by Tata from Bombay-Karachi, then IAW to London. Tata Sons Ltd, F/F Bellary to Bombay, bs 18/10, imprint airmail etiquette cover franked 3a3p canc Bellary cds, etiquette cancelled by red double cross Jusqu'a applied in Bombay, black framed 'Madras-Karachi/18 Oct 32 flight cachet used in Bombay only, signed by the pilot Neville Vintcent. First acceptance of Indian mail for Sudan, Ahmadabad to Atbara (Sudan), bs24/10, via Cairo 21/10, for carriage carried on F/F TATA Madras - Karachi feeder service connecting with IAW Karachi-London flight IW 185, (see Wingent), black boxed "Madras-Karachi 18 Oct 32" cachet, white on indigo etiquette rated scarce by Mair, attractive attractive TATA souvenir cover with red rays and Union Jack, addressed in hand of Stephen Smith, franked12 1/2anna. Small mail. Bellary to Bombay, bs 18/10, carried on F/F TATA Madras - Karachi feeder service, black boxed Madras-Karachi cachet front and verso, white on indigo etiquette rated scarce by Mair, registered (label) cover, franked 3as, 2as, 1a3p. The pilots were Nevill Vintcent and Homi Baroucha. 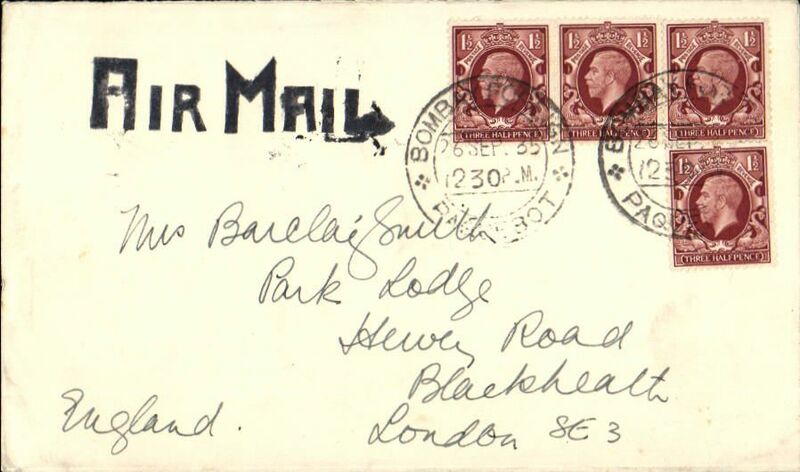 Bellary to Ahmedabad, bs 19/19, carried on F/F TATA Madras - Karachi feeder service, black boxed Madras-Karachi cachet front and verso, white on indigo etiquette rated scarce by Mair, special TATA cover with red rays and Union Jack, franked 3anna 3p, addressed in hand of Stephen Smith, and signed by him verso. The pilots were Nevill Vintcent and Homi Baroucha. 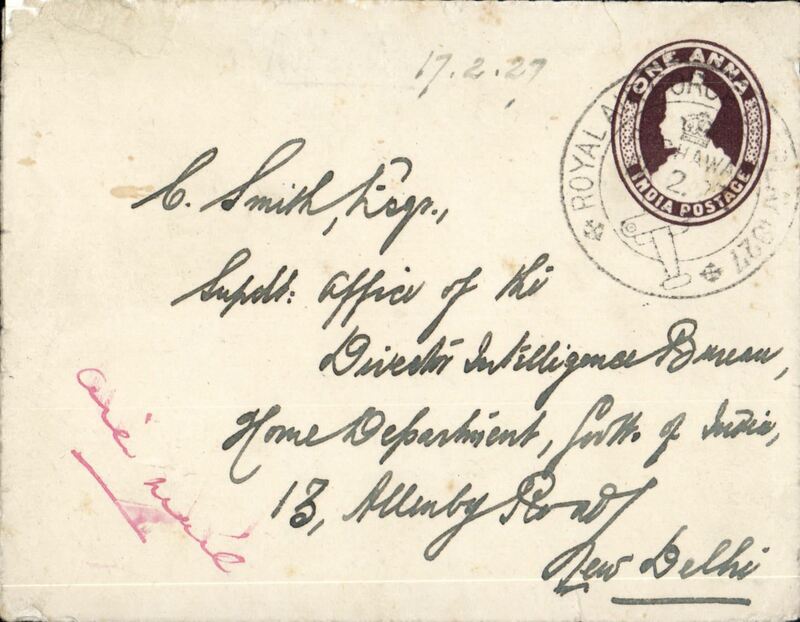 Bellary to Ahmedabad, bs 19/19, carried on F/F TATA Madras - Karachi feeder service, black boxed Madras-Karachi cachet front and verso, white on indigo etiquette rated scarce by Mair, special TATA cover with yellow rays and no Union Jack, franked 3anna 3p, addressed in hand of Stephen Smith, and signed by him verso. The pilots were Nevill Vintcent and Homi Baroucha. 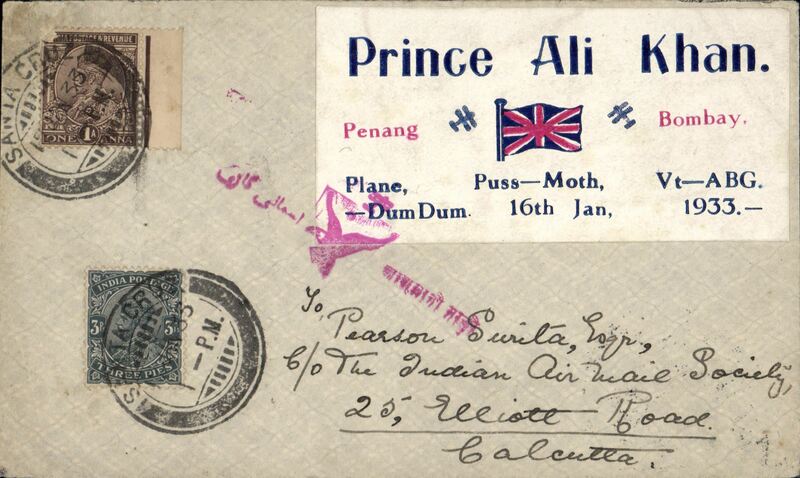 Penang-Bombay by Prince Ali Khan, cover flown on return flight from Bombay to Calcutta, special label with details of flight, tied red arabic airmail 'Asmani Ghari' cachet, franked 1a 3p, canc Santa Cruz, Bombay, bs Calcutta, Park Street on return, signed Stephen Smith (ref Brown J, Indian Air Mails, 1995, #33-01). 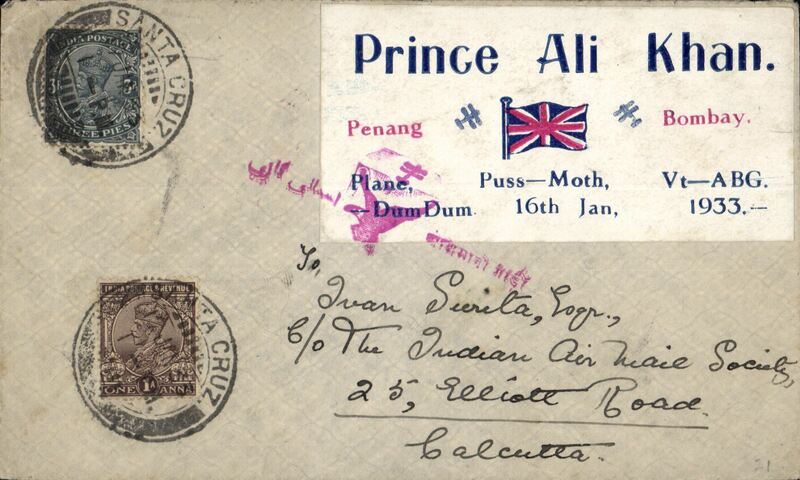 Penang-Bombay by Prince Ali Khan, cover flown on return flight from Bombay to Calcutta, special label with details of flight, tied red arabic airmail 'Asmani Ghari' cachet, franked 1a 3p, canc Santa Cruz, Bombay, bs Calcutta, Park Street on return, signed Stephen Smith. Gwailor to Leicester, England, underpaid imprint etiquette 8 anna PSC, canc Gwailor cds, black 'T/10c' in circle and '1d' Tax Due hs's, and red GB 1d 1d Postage Due on front tied Leicester 7/7 arrival cds. Rear flap missing, otherwise good. 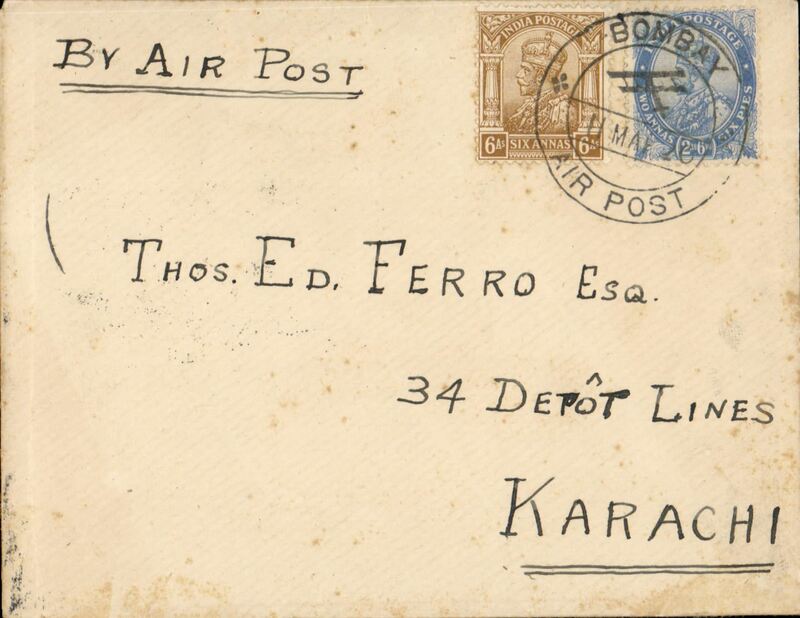 Tempoary route change of the Karachi-Madras service due to flooding of the Juhu aerodrome at Bombay, Poona to Karachi, bs 31/5, cover with blue cown over ?dragon and "Virtus Non Satis" embossed on flap, franked 3 1/4 anna, tete a beche airmail itiqutte tied by Poona postmark. No special postmarks or cachets wer used. 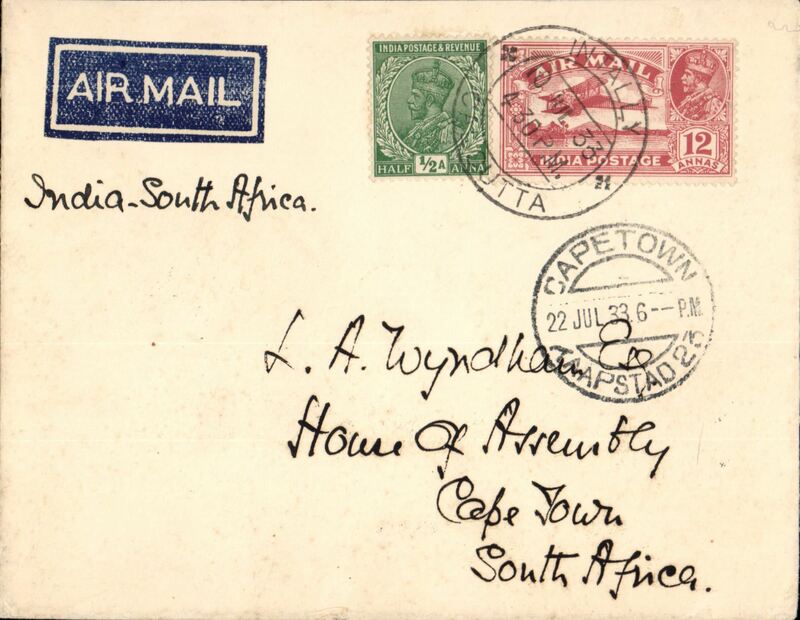 Uncommon inward airmail to India from South Africa to Calcutta bs 28/6, airmail etiquette cover franked 2x 6d SA stamps canc "Houses of Parliament/13 Jun 33/Parlementshug" cda, ms 'Via Cairo and Karachi', etiquette cancelled 'Karachi' as rest of journey had to be completed by surface mail. Nice exhibition item. 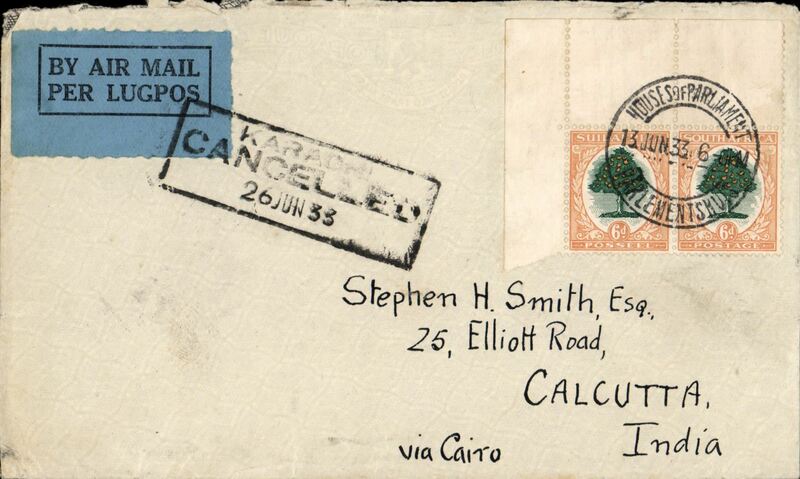 F/F India Transcontinental Airways, Asansol to Cawnpore, bs 11/7, airmail etiquette cover franked 3a 3p, black framed 'Calcutta-Karachi/11 Jul.33/First Airmail' cachet verso. 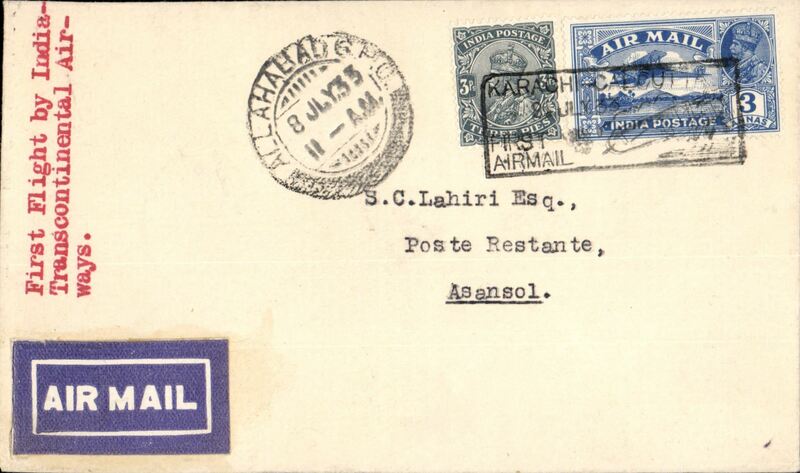 F/F India Transcontinental Airways, Asansol to Allahabad, bs 11/7, airmail etiquette cover franked 3a 3p, black framed 'Karachi-Calcutta/7 Jul.33/First Airmail' cachet front and verso. 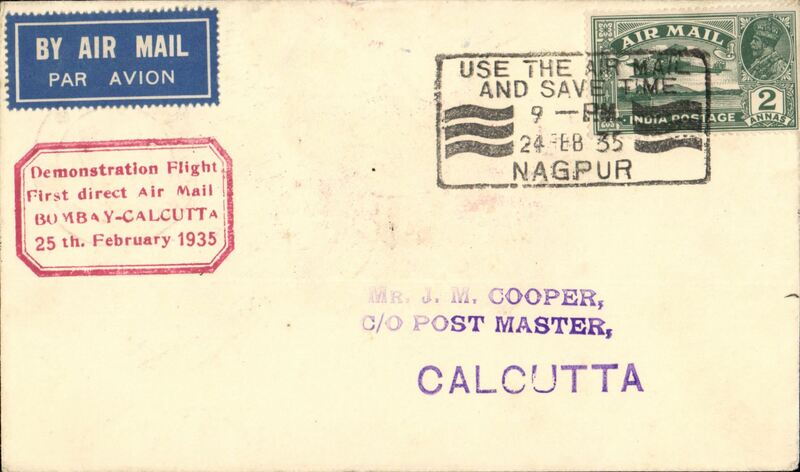 Calcutta to England, carried on F/F India Transcontinental Airways, Calcutta to Karachi, airmail etiquette cover franked 8a 6p, black framed 'Calcutta-Karachi/11 Jul.33/First Airmail' cachet. The cover bears a blue 'The Calcutta Scottish AF (1)' logo on the flap. The Calcutta Scottish was a regiment of volunteers of Scottish descent raised in 1914 as an infantry regiment of the British Indian Army. The regiment formed part of the army reserves of the Auxiliary Force, India (AFI). 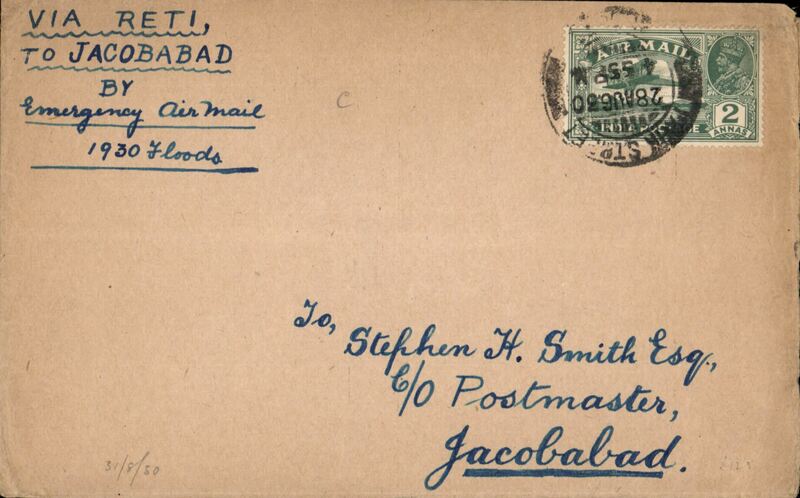 F/F India Transcontinental Airways, return flight, Calcutta to Allahabad, bs 11/7, red/white/blue souvenir cover franked 3a 3p, black framed 'Calcutta-Karachi/11 Jul.33/First Airmail' cachet verso. Only 4 flown, Newall 33.13Ae1. 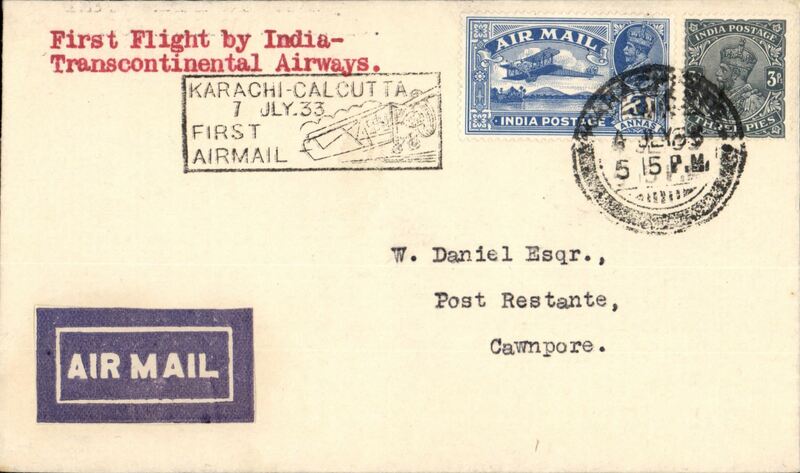 F/F India Transcontinental Airways, Karachi to Cawnpore, bs 8/7, airmail etiquette cover franked 3a 3p, black framed 'Karachi-Calcutta/7 Jul.33/First Airmail' cachet front and verso. 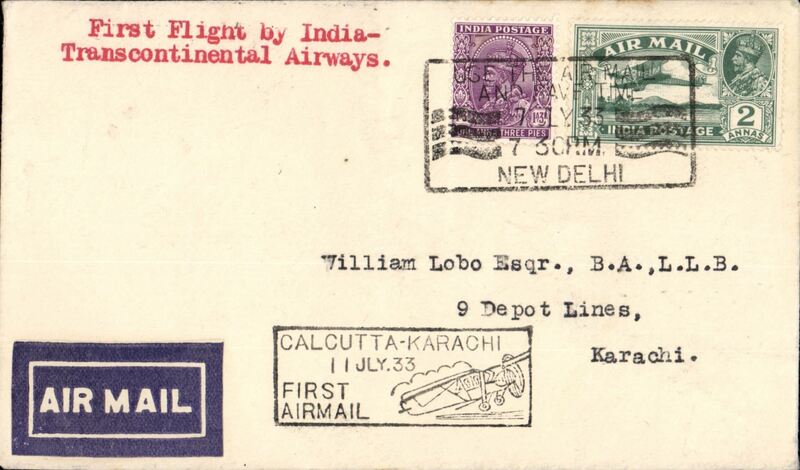 F/F India Transcontinental Airways, New Delhi to Cawnpore, bs 8/7, airmail etiquette cover franked 3a 3p, black framed 'Karachi-Calcutta/8 Jul.33/First Airmail' cachet front and verso. 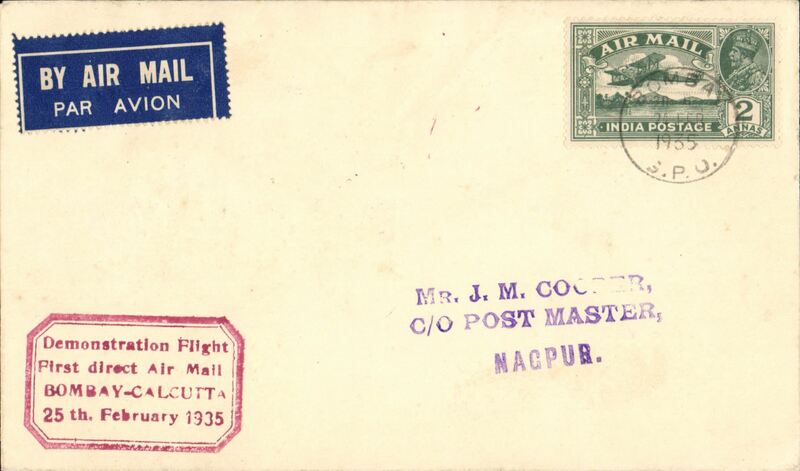 F/F India Transcontinental Airways, New Delhi to Johdpur bs 12/7, airmail etiquette cover franked 3a 3p, black framed 'Calcutta-Karachi/11 Jul.33/First Airmail' cachet front and verso. 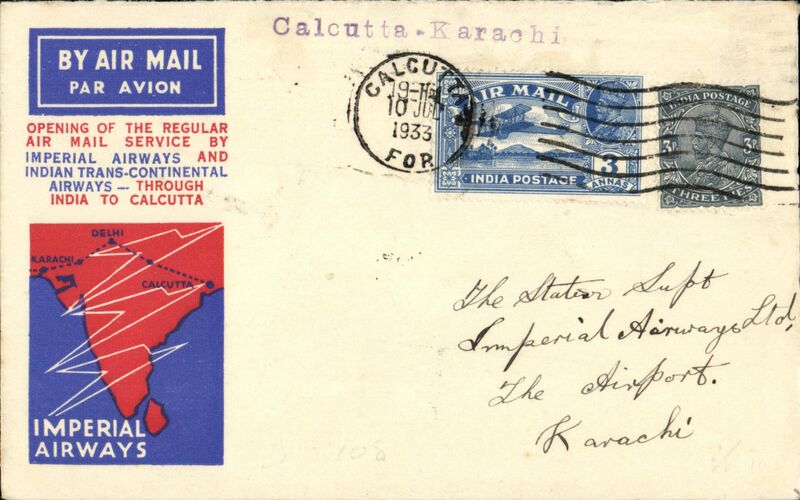 F/F India Transcontinental Airways, New Delhi to Karachi, bs 12/7, airmail etiquette cover franked 3a 3p, black framed 'Calcutta-Karachi/11 Jul.33/First Airmail' cachet. 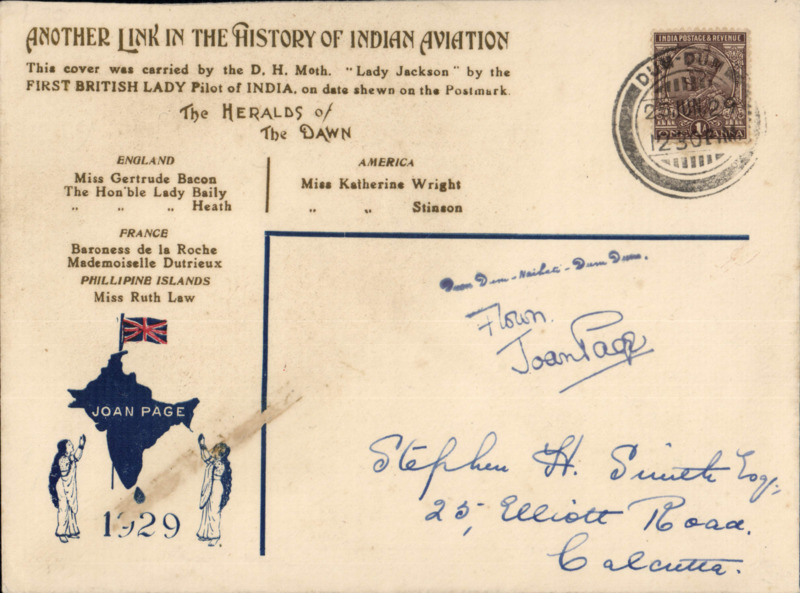 Jodhpur-Allahabad, bs 8/7, carried on first ITCA Trans Indian fllight from Karachi to Calcutta via Jodhpur, Delhi, Cawnpore, Allalabad and Asansol, imprint etiquette cover franked 3A 3p, canc black boxed 'Karachi-Calcutta/7 July/First Airmail' cachet, also 'Karachi-Calcutta/8 July/First Airmail' cachet verso. 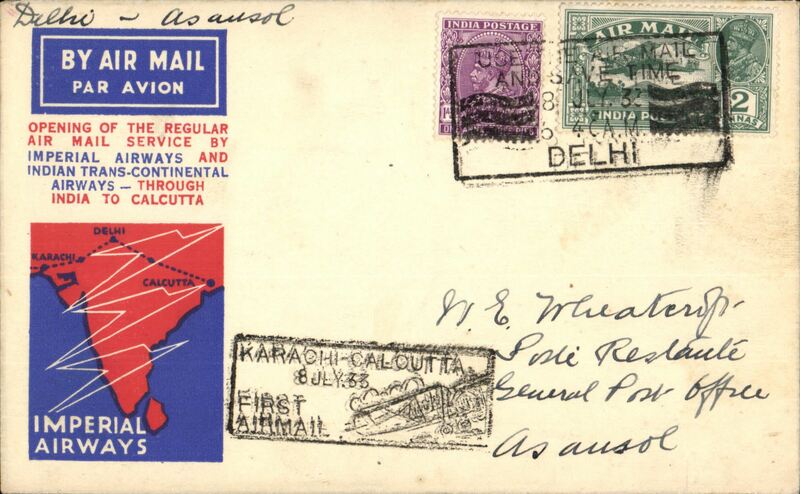 England-India extension from Karachi to Calcutta by India Trans-Continental Airways, Calcutta to Allahabad, bs 11/7, red/white/blue Speedbird souvenir cover, franked 3anna 3p canc black boxed "Calcutta to Karachi/7 Jul 33/First Flight"cachet. Francis Field authentication hs verso. 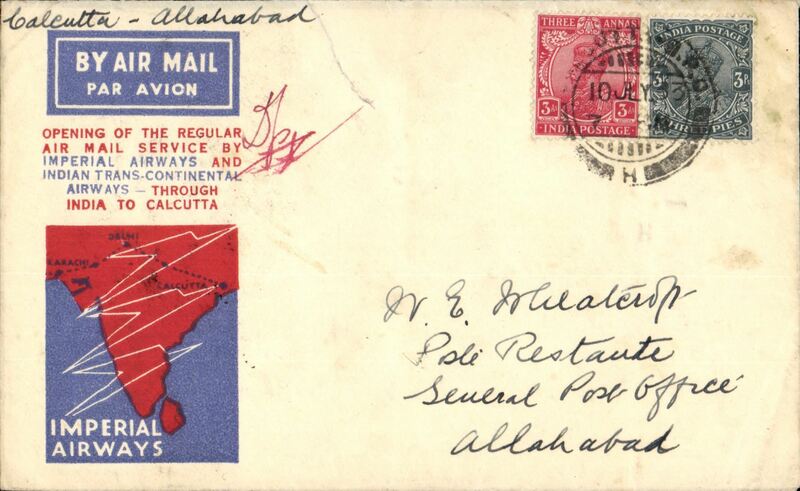 F/F Karachi to Calcutta, bs 9/7, carried on the England-India extension from Karachi by India Trans-Continental Airways via Jodhpur, Delhi, Cawnpore, Allahabad and Asansol, red/cream souvenir cover franked 3anna 3p, canc black boxed 'Karachi-Calcutta/7 July/First Airmail' cachet, also same cachet verso. 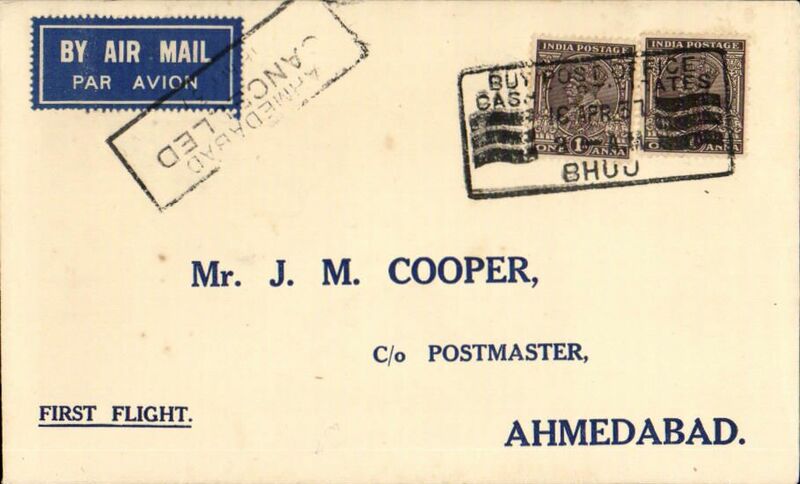 Karachi to Jodhpur, bs 8/7, carried on F/F Calcutta to Karachi, bs "Areodrome/Sanghi Bros/Jodhpur", official red/white/blue souvenir cover franked 3annas 3p, canc black boxed "Karachi to Calcutta/7 Jul 33/First Air Mail' cachet, Imperial Airways/Indian Trans-Continental Airways. Rare stage. A map of the route accompanies this item. 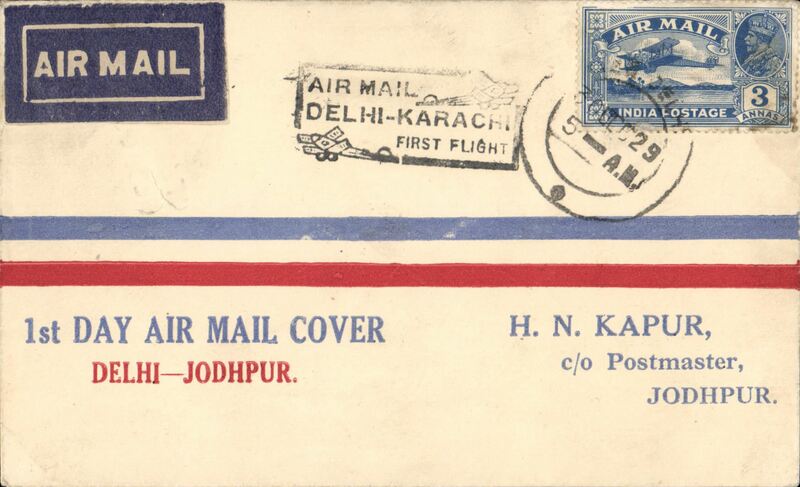 Imperial Airways/Indian Trans-Continental Airways Karachi to Allahabad, bs 11/7, carried on F/F Karachi to Calcutta, black boxed "Karachi-Calcutta First Flight" cachets front and verso, printed souvenir cover "Jodhpur (crossed out and Karachi inserted by hand) - Allahabad", franked 3a 3p. Uncommon. 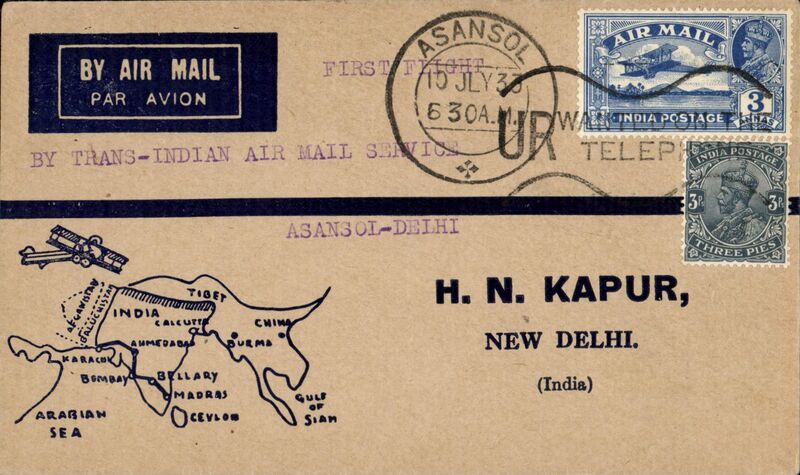 Imperial Airways/Indian Trans-Continental Airways F/F, Karachi to Asansol, bs 8/7, blue/buff souvenir cover with map of route, franked 3 anna and 3p, black boxed "Karachi-Calcutta" cachet. 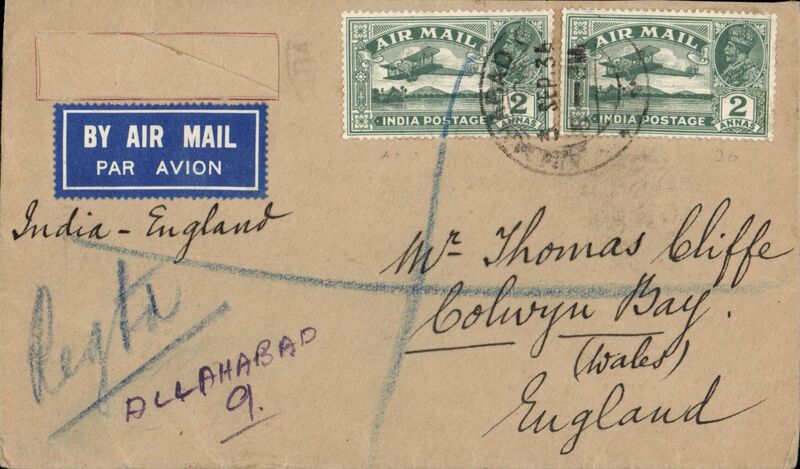 England-India extension from Karachi to Calcutta by India Trans-Continental Airways, New Delhi to Cawnpore, bs 8/7, carried from Karachi to Calcutta via Jodhpur, Delhi, Cawnpore, Allahabad and Asansol, plain cover franked 3 annas 6p, also black boxed 'Karachi-Calcutta/8 JUL 33/First Airmail' cachets front and verso. England-India extension from Karachi to Calcutta by India Trans-Continental Airways, Allahabad-Calcutta, bs 9/7, carried from Karachi to Calcutta via Jodhpur, Delhi, Cawnpore, Allalabad and Asansol, red/buff Imperial Stamp Co souvenir cover franked 3A 3p, canc Allahabad cds, also black boxed 'Karachi-Calcutta/First Airmail' cachet verso. 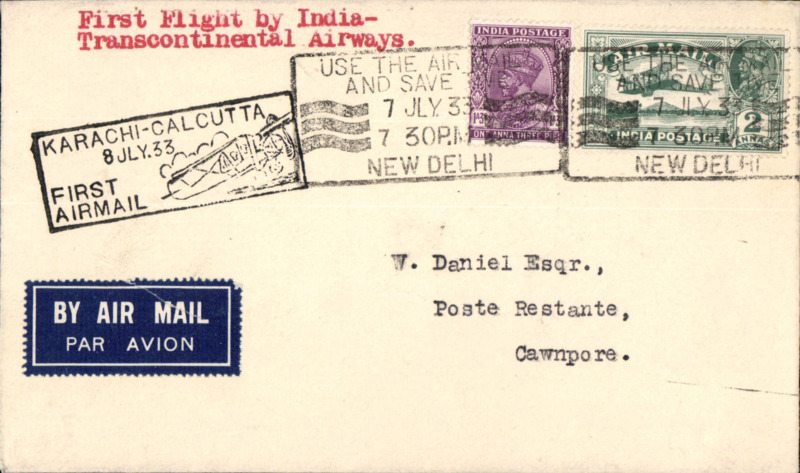 F/F India Transcontinental Airways, Cawnpore to Asansol, bs 8/7, airmail etiquette cover franked 3a 3p, black framed 'Karachi-Calcutta/7 Jul.33/First Airmail' cachet front and verso. 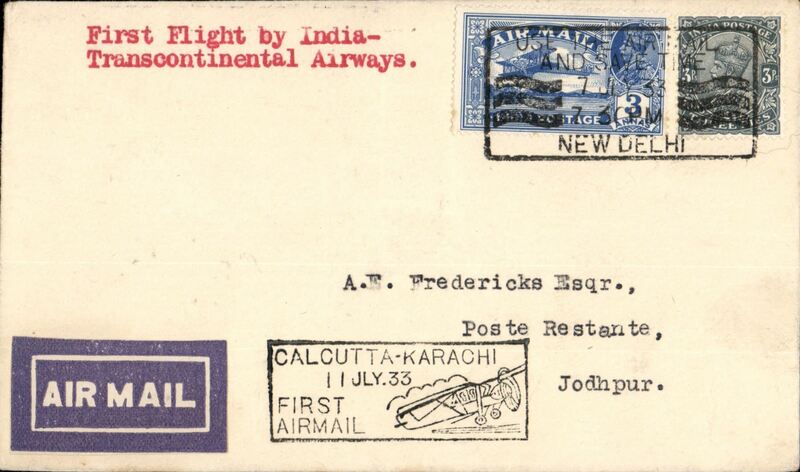 F/F India Transcontinental Airways, Allahabad to Asansol, bs 8/7, airmail etiquette cover franked 3a 3p, black framed 'Karachi-Calcutta/8 Jul.33/First Airmail' cachet front and verso. 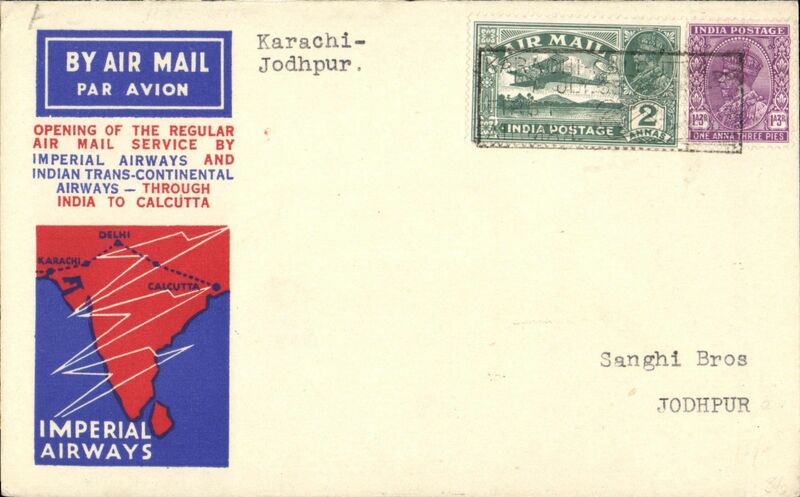 F/F India Transcontinental Airways, New Delhi to Asansol, bs 8/7, red/white/blue souvenir cover franked 3a 3p, black framed 'Karachi-Calcutta/8 Jul.33/First Airmail' cachet. India Trans-Continental Airways, Asansol to Calcutta, 11/7 arival ds on front, plain Edna Lorenz Lady Photographer PC, franked 1 1/2anna 3p canc Asanso; cds, black boxed "Karachi-Calcutta/8 Jul 33/First Flight"cachet, scarce tied TETE-BECHE etiquette IND-A-6carried on F/F Calcutta to Karachi. signed Stephen Smith verso. 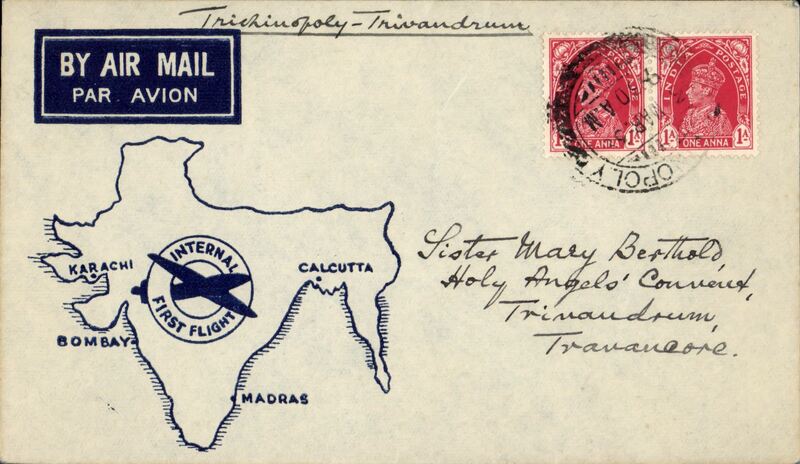 Calcutta-Asansol, bs Jul 12th, 7.30am, carried on first return of ITCA Trans Indian flight from Calcutta via Asansol, Allahabad, Cawnpore, Delhi and Jodhpur to Karachi, plain' cover, franked 3A 3p, canc Calcutta GPO Jly 10th, 7pm, black boxed "Calcutta-Karachi/11 Jly 33/First Airmail" cachet verso. There was no stop at Asansol on the return flight so mail was dropped off at Allahabad and carried back down South by surface, see Newall p162. Extension of the Indian Route to Calcutta, first acceptance of Indian mail for South Africa, on the return flight Calcutta to Cape Town, 22/7 arrival ds on front carried on first return of ITCA Trans Indian fllight from Calcutta via Allahabad, Delhi and Jodhpur to Karachi, connecting with IAW Karachi-London flight IW 185, then at Cairo, 14Jly transit cds, with IAW London-Cape Town flight AS 86 (see Wingent), plain cover addressed to LA Wyndham, House of Assembly, Cape Town, franked 12 1/2A canc black 'Calcutta/10 Jly 33 cds. 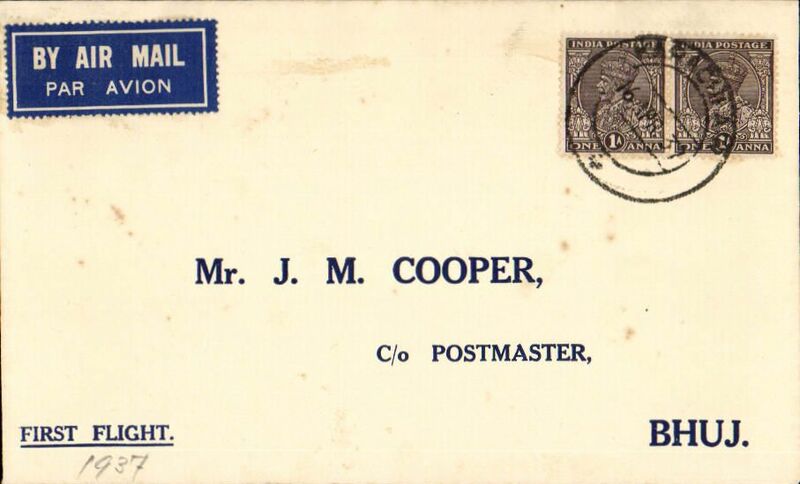 Very small mail, only 12 carried, see Newall p346. 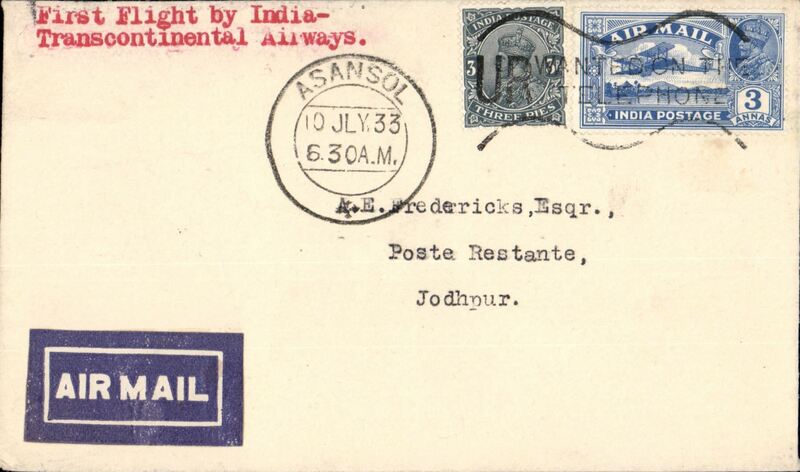 F/F India Transcontinental Airways, Asansol to Jodhpur, bs 12/7, airmail etiquette cover franked 3a 3p, black framed 'Karachi-Calcutta/7 Jul.33/First Airmail' cachet verso. 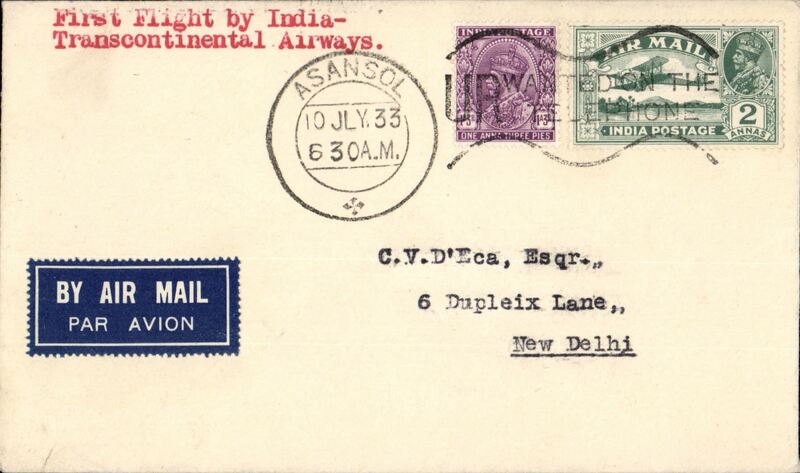 F/F India Transcontinental Airways, Asansol to New Delhi, bs 11/7, airmail etiquette cover franked 3a 3p, black framed 'Calcutta-Karachi/11 Jul.33/First Airmail' cachet front and verso. 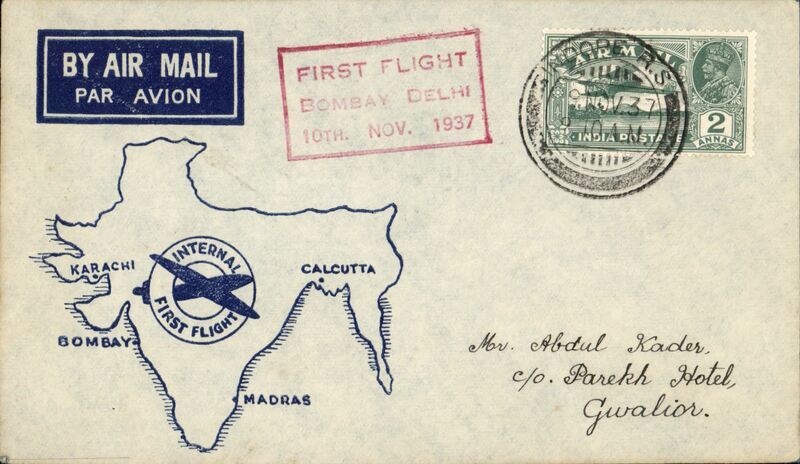 F/F Calcutta to London, no arrival ds, flown IW 223, the first westbound service after extension of route from Karachi to Calcutta (see Wingent), black boxed Calcutta-Karachi/11 Jly 33 cachet on front, official three colour souvenir map cover, India Trans-Continental Airways/Imperial Airways, small mail. India Trans-Continental Airways/Imperial Airways, F/F Calcutta to London, bs Troon, Scotland, bs 18/7, flown IW 223, the first westbound service after extension of route from Karachi to Calcutta (see Wingent), black boxed Calcutta-Karachi cachet (verso), no arrival ds, official three colour souvenir map cover. Small mail. 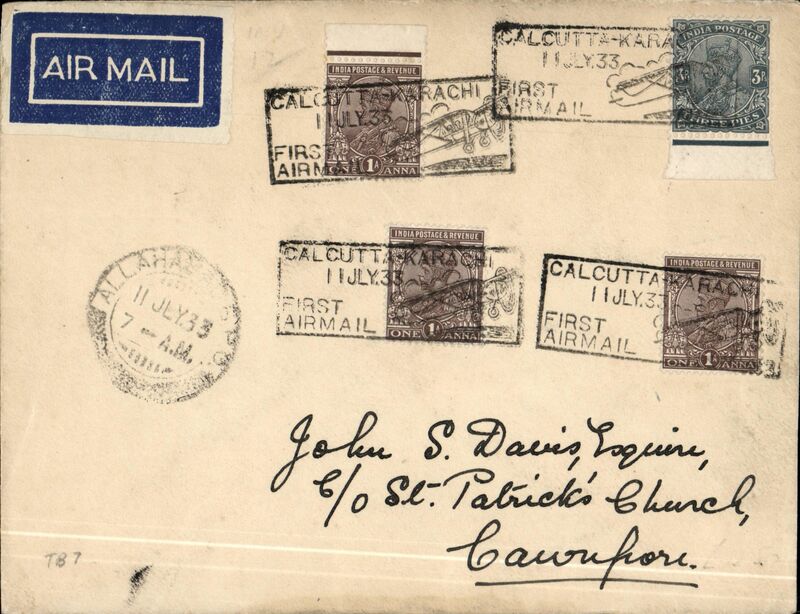 F/F Calcutta to Asansol, 12/7 arrival ds on front, franked 4 1/2a, black boxed "Calutta-Karachi" cachet, Lorenz corner card adressed to Stephen Smith, St Patrick's High School, Asansol, Imperial Airways/ Indian Trans-Continental Airways. Signed Stephen Smith verso, also Francis Field authentication hs. Imperial Airways/ITCA, Calcutta-London, Paisley (Scotland) 18 Jly 33 arrival ds on front, carried on first return of ITCA Trans Indian fllight from Calcutta via Asansol, Allahabad, Cawnpore, Delhi and Jodhpur to Karachi, black boxed "Calcutta-Karachi/11 Jly 33/First Airmail" cachet used as arrival ds verso, red/white/blue Speedbird souvenir cover franked 8anna 6p, canc Calcutta Foreign cds. "Rebut/Parti" hs, so returned by surface, boxed DLO calcutta 5/8 hs verso, via Bombay DLO 3/8 verso. Good routing. 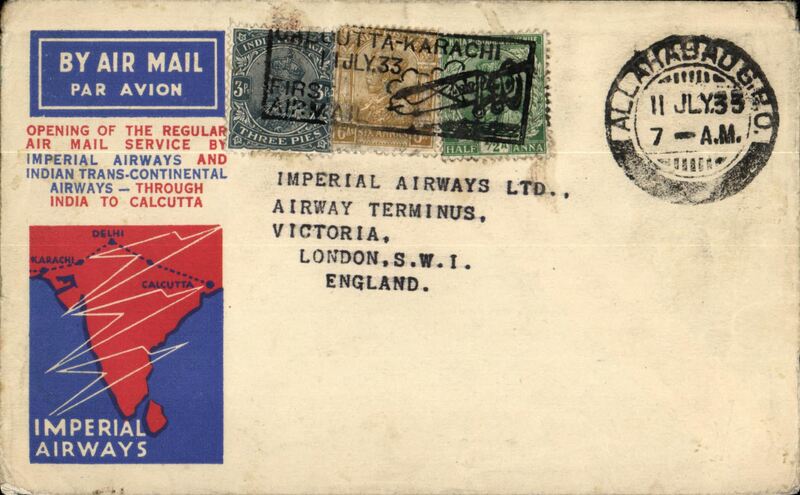 Imperial Airways/ Indian Trans-Continental Airways, F/F Calcutta to Karachi, b/s 12/7, black boxed "Calutta-Karachi" cachet, official red/white/blue cover franked 3 1/4a. Newall 33/13e5, 76 flown. 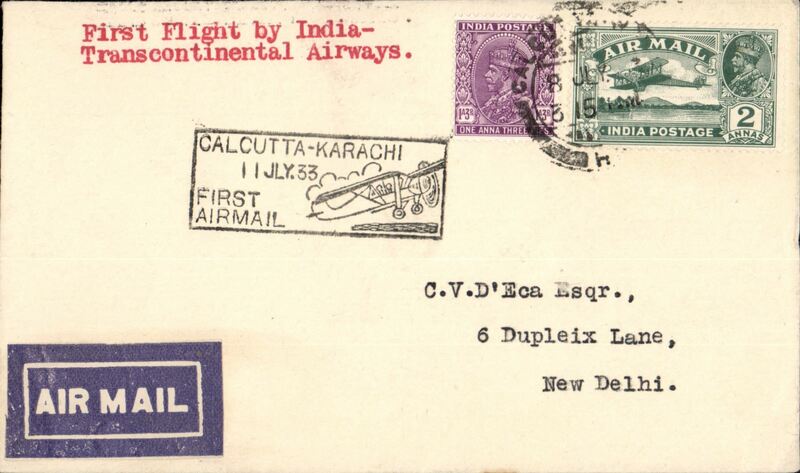 Imperial Airways/Indian Trans-Continental Airways, F/F Calcutta to Karachi, b/s 12/7, black boxed "Calcutta-Karachi/11 Jly 33/First Airmail" cachet, official red/white/blue cover franked 3a 3p. F/F Calcutta to London flown IW 223, the first westbound service after extension of route from Karachi to Calcutta (see Wingent), black boxed "Calcutta-Karachi/11 Jly 33/First Airmail" cachet (verso), no arrival ds, plain cover franked 9 1/2 annas, India Trans-Continental Airways/Imperial Airways. Small mail. 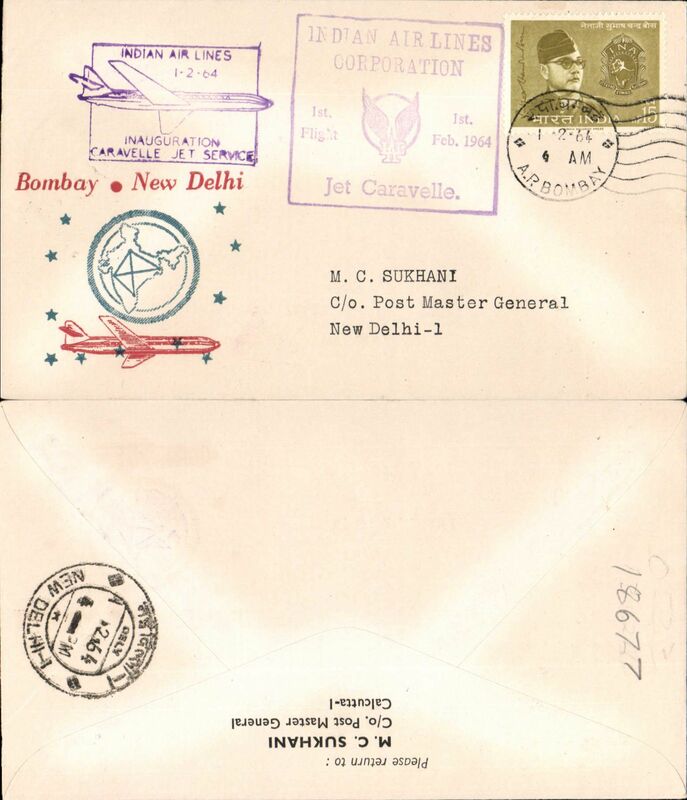 India Trans-Continental Airways, Asansol to Delhi, bs 11/7, black/dark blue souvenir cover with map of route on lower lh corner, franked 3 anna 3p canc Asansol cds, black boxed "Calcutta-Karachi/11 Jly 33/First Airmail" cachet verso. F/F Asansol to Khartoum, bs 22/7, via Cairo 14/7 and Shellal-Halfa TPO 19/7, flown on first return of Karachi-Calcutta extension, boxed "Calcutta-Karachi/11 Jly 33" hs verso. 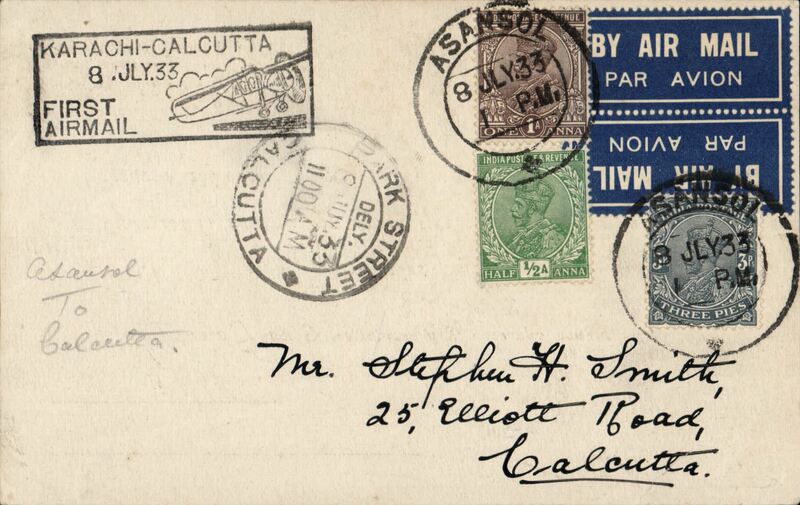 The aircraft did not stop at Asansol so the cover was flown from Calcutta. The cover then went by rail from Cairo where etiquette was cancelled with a blue cross. Imperial Airways. An interesting and very well documented cover. Rare Imperial Airways/ITCA, Calcutta to Delhi, bs Jul 11th, carried on first return of ITCA Trans Indian fllight from Calcutta via Asansol, Allahabad, and Cawnpore, official red/white/blue souvenir cover franked 3A 3p canc Calcutta cds, black boxed "Calcutta-Karachi/11 Jly 33/First Airmail" cachet verso. Only 4 flown, Newall 33.13e3, 120units. India Trans-Continental Airways/Imperial Airways, F/F Calcutta -Karachi-London, no arrival ds, flown IW 223, the first westbound service after extension of route from Karachi to Calcutta (see Wingent), official three colour souvenir map cover franked 6a 6p, cnc Calcutta machine pm, black boxed 'Calcutta-Karachi/11 Jly 33/First Airmail' transit cachet. 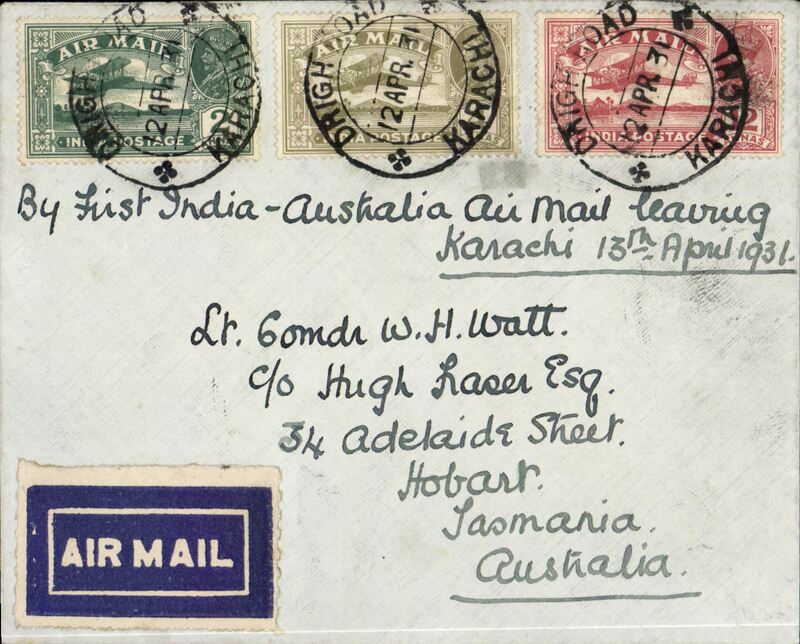 Small mail, Newall reports only four flown Calcutta-Karachi-London, #33.13Ae5. First acceptance of Indian mail for Belgian Congo, Calcutta to Elisabethville, bs 20/7, via Cairo 14/7 and Broken Hill 20/2, for carriage on the first return of ITCA Trans Indian flight from Calcutta via Asansol, Allahabad, Cawnpore, Delhi and Jodhpur to Karachi, connecting with IAW Karachi-London flight IW 185, then at Cairo with IAW London-Cape Town flight AS 86 (see Wingent), and at Broken Hill with the Aero Club de Katanga regular feeder service to Elisabethville, red/white/blue IAW/ITCA souvenir cover addressed to LA Wyndham, franked 13 1/2 annas, canc Calcutta cds, black boxed 'Calcutta-Karachi/11 Jly 33/First Airmail' cachet verso. Only a few covers flown. 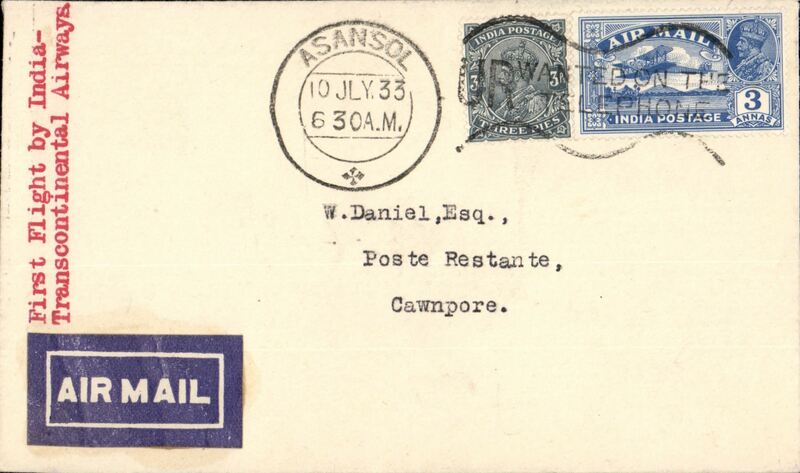 First acceptance of Indian mail for East Africa, Asansol to Nairobi, bs 18/7 arrival ds on front and verso, carried on first return of ITCA Trans Indian fllight from Calcutta via Asansol, Allahabad, Cawnpore, Delhi and Jodhpur to Karachi, connecting with IAW Karachi-London flight IW 185, then at Cairo 14Jly transit cds, with IAW London-Cape Town flight AS 86 (see Wingent), plain cover franked 10 1/2A , black boxed 'Calcutta-Karachi/11 Jly 33/First Airmail' cachet verso, Imperial Airways/ITCA. 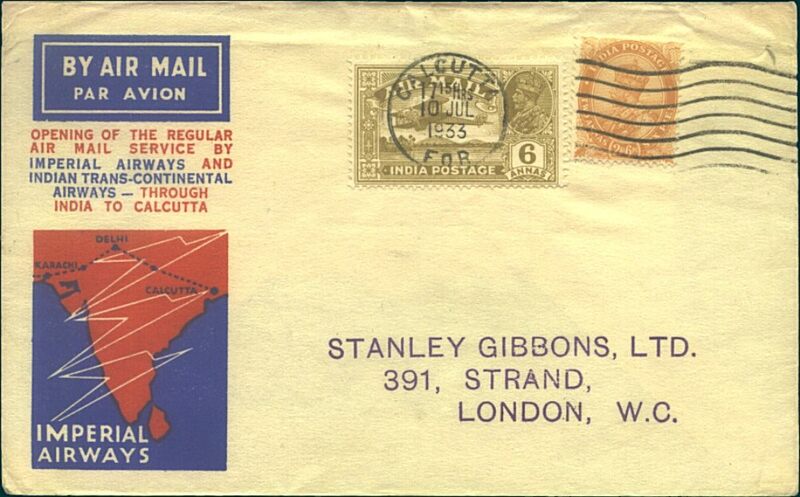 Very small mail, eg from Asansol only 15 dispatched to Alexandria and 4 to London, see Newall p346. RARE, Allahabad-Cawnpore, Jul 11th arrival ds on front, carried on first return of ITCA Trans Indian fllight from Calcutta via Asansol, Allahabad, Cawnpore, Delhi and Jodhpur to Karachi, Edna Lorenz card franked 3A 3p, black boxed "Calcutta-Karachi/11 Jly 33/First Airmail" cachet, Imperial Airways/ITCA, signed Stephen Smith verso. Only four carried, Newall 33.13Ae2, 120 units. Francis Field authentication hs verso. Calcutta to Asansol, bs 12/7, carried on the first flight by the Indian Trans-Continental Airways from Karachi to Calcutta via Jodhpur, Delhi, Cawnpore, Allahabad and Asansol, cover with Ritz Calcutta Hotel logo on flap, franked 3A3p, canc Calcutta cds and tied by black framed "Calcutta-Karachi/11 Jly 33/First Airmail" hs , signed Stephen Smith verso. ncommon leg, nice item. Jodhpur-Karachi, bs Jul 12th, carried on first return of ITCA Trans Indian fllight from Calcutta via Asansol, Allahabad, Cawnpore, Delhi and Jodhpur to Karachi, official red/white/blue souvenir cover franked 3A 3p, canc black boxed "Calcutta-Karachi/11 Jly 33/First Airmail" cachet, also Jhodpur cds, Imperial Airways/ITCA. 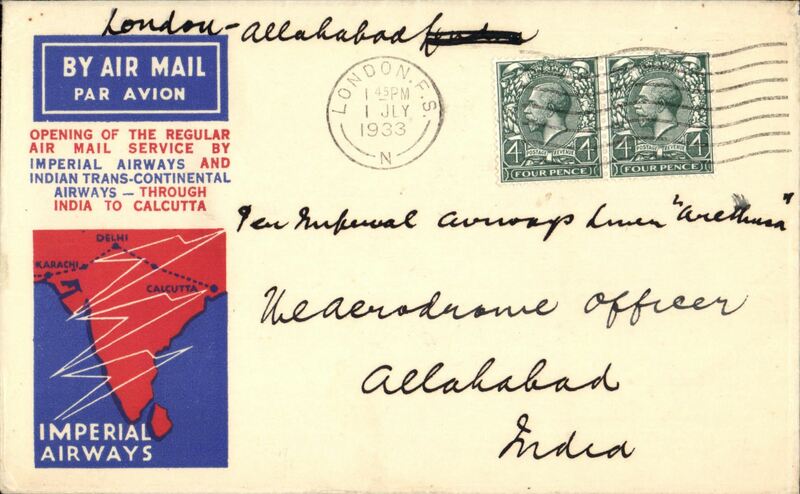 Allahabad-Cawnpore, bs Jul 11th, carried on first return of ITCA Trans Indian flight from Calcutta via Asansol, Allahabad, Cawnpore, Delhi and Jodhpur to Karachi, plain buff cover franked 3A 3p, canc black boxed "Calcutta-Karachi/11 Jly 33/First Airmail" cachet, also Allahabad GPO cds on front, dark blue/white airmail etiquette rated scarce by Mair, Imperial Airways/ITCA. A map of the route accompanies this item. Allahabad-Delhi, bs Jul 11th, carried on first return of ITCA Trans Indian fllight from Calcutta via Asansol, Allahabad, Cawnpore, Delhi and Jodhpur to Karachi, red/buff Imperial Stamp Co souvenir cover franked 3A 6p canc black boxed "Calcutta-Karachi/11 Jly 33/First Airmail" cachet, also Allahabad GPO cds, Imperial Airways/ITCA. 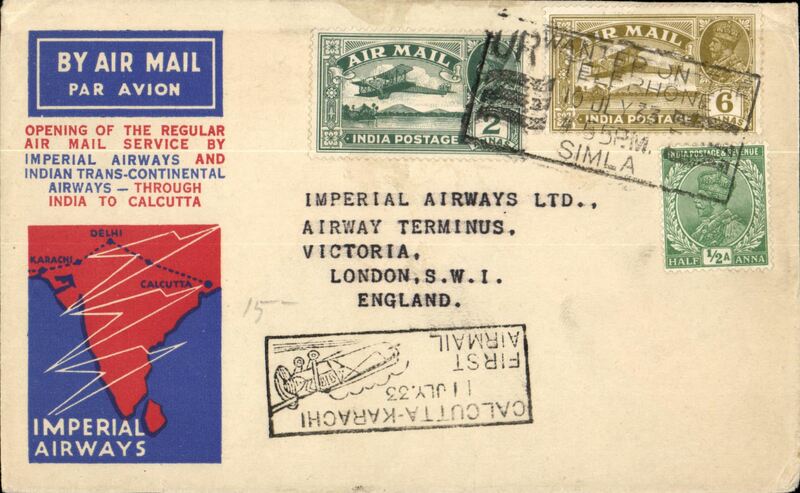 Imperial Airways/ITCA, Calcutta-Jhodpur, bs 11/7, carried on first return of ITCA Trans Indian fllight from Calcutta-Karachi via Asansol, Allahabad, Cawnpore, Delhi and Jodhpur, red/white/blue Speedbird souvenir cover franked 8 1/2anna canc black boxed "Calcutta-Karachi/11 Jly 33/First Airmail" cachet used as postmark. India Transcontinental AW, England-India extension, Calcutta-Karachi, 17/7 arrival ds, boxed F/F Calcutta-Karachi/11 Jly.33 cchet verso. Two small non invasve top lh corner nibbles. 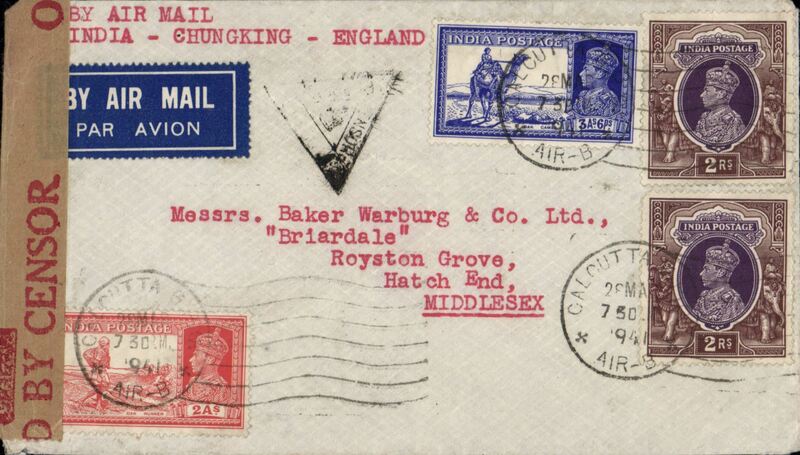 First flight, IAW/IATCA Allahabad to London, red/blue/wjite souvenir cover franked 3p, 1/2a/6a canc double ring Allahabad GPO cds, black rectangular 'Cacutta-Karachi/11 Jly 33/First Air Mail' hs. 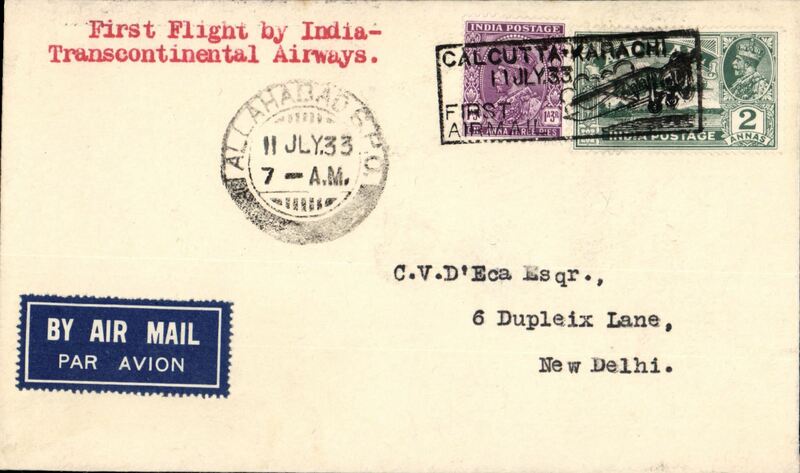 F/F India Transcontinental Airways, Allahabad to New Delhi, bs 11/7, airmail etiquette cover franked 3a3p, black framed 'Calcutta-Karachi/11 Jul.33/First Airmail' cachet. 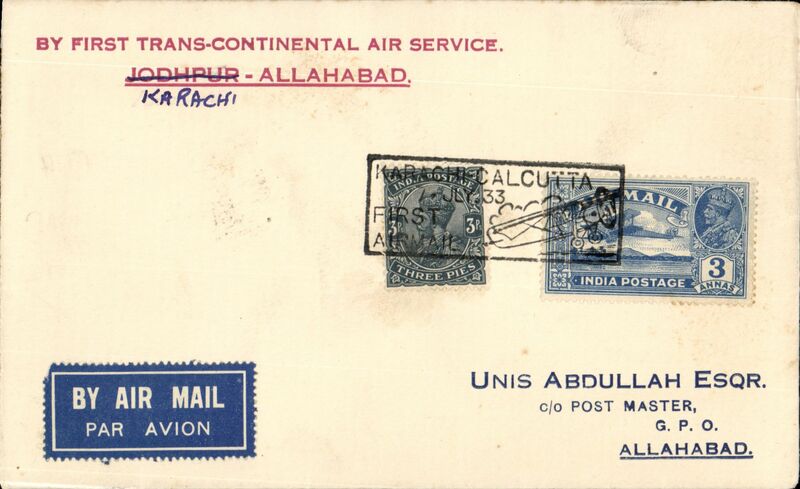 Indian Transcontinental Airways, Calcutta to Karachi, 9p PSC with additional 3a, cancelled with 'Calcutta-Karachi/11 Jly 33' used as postmark, blue/black P&T - Mail 25 airmail etiquette. 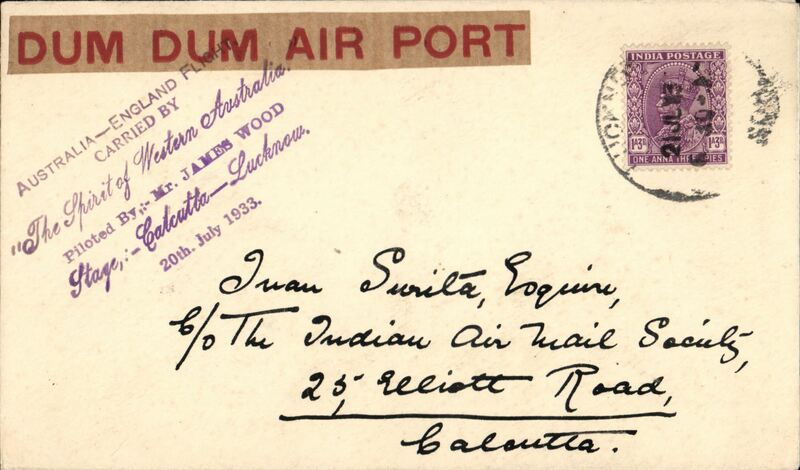 20 July 1933 (AAMC.317) Calcutta - Lucknow, POA 21 Jl 33, flown cover, carried by James Wood in "The Spirit of West Australia" whilst on his Perth to England flight; with violet 6-line cachet tieing Dum Dum Air Port label. The onward flight was delayed by the collapse of the undercarriage at Bandar Abbas. [16 flown]. 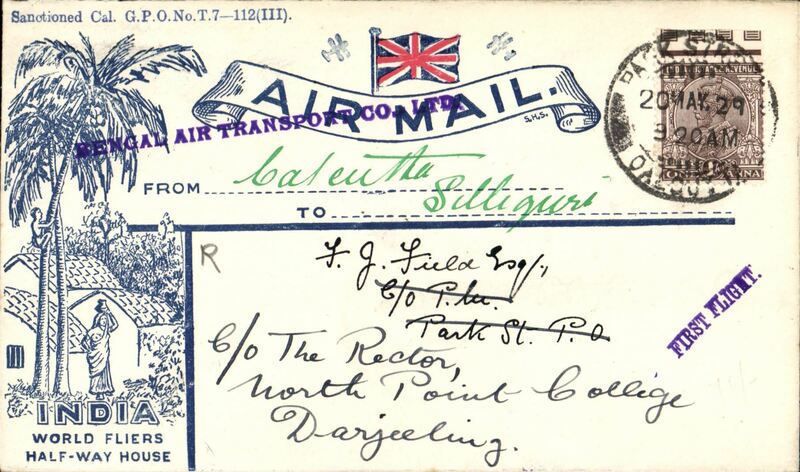 F/F Calcutta to Rangoon, bs 1/10, yellow/blue official cover,franked 3a 3p, violet three line 'dumbell' F/F cachet verso, Imperial Airways/ITCA. 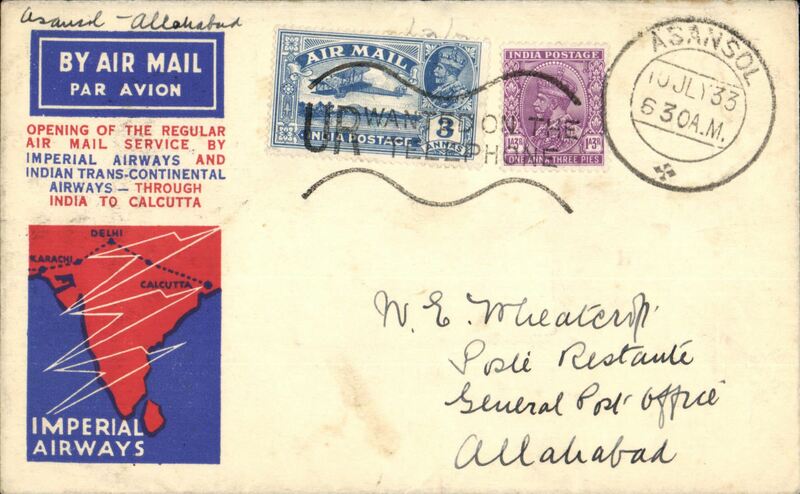 Imperial Airways/ITCA F/F Calcutta to Akyab, bs 1/10, extension of Air Route/To Akyab and Rangoon, India 9P PSC with additional 1a stamp, red three line "1st Flight 1/9/1933/Extension of Air Route/To Akyab and Rangoon" front and back. On the front the incorrect date has been corrected by hand to 1-10-33, but not on the back. 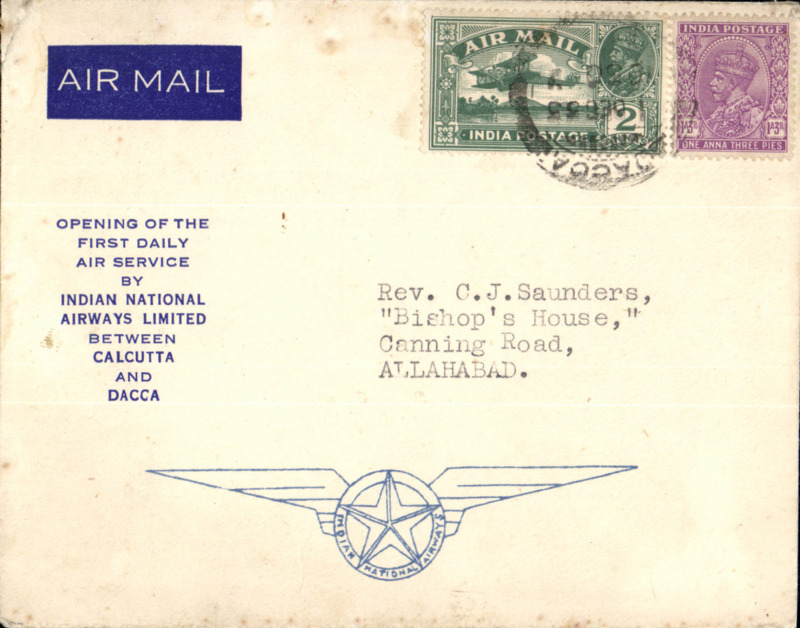 Indian National Airways Ltd, Dacca to Allahabad, bs 2/12, via Calcutta 1/12, carried on India National Airways first Calcutta-Dacca daily air service, official blue/cream souvenir covers bearing INA insignia 'The Star of India with wings', franked 3anna 3p. The Calcutta-Dacca service ceased operation on 16 June 1935 and the Calcutta-Rangoon on 9 August 1935. Few light top edge tone spots. 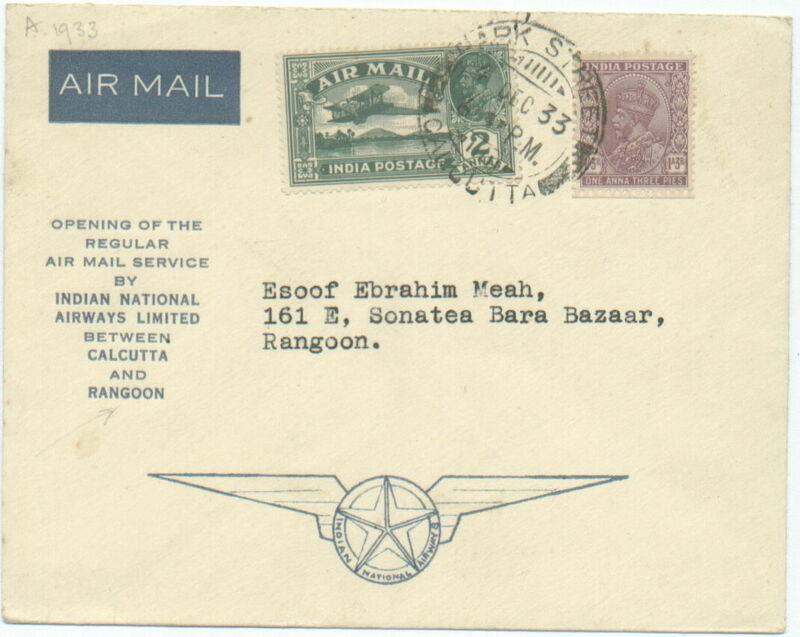 F/F Calcutta to Rangoon flown on India extension to Singapore, scarce printed souvenir etiquette cover with INAW logo "Opening of the Regular Air Service by Indian National Airways Ltd between Calcutta and Rangoon", b/s 6/12, 52 flown. India National Airways, F/F Calcutta to Sandaway, bs 30/12, via Rangoon 6/12 and Akyab 8/12, flown on India extension to Rangoon, uncommon red/white/blue India Air Service Britannia with Union jack shield cover, franked 3annas 3p, canc Calcutta cds, ms Inian National Airways/ 52 flown. Flown to Rangoon via Akyab, then carried 175 mile back north by surface to Sandaway. Interesting. 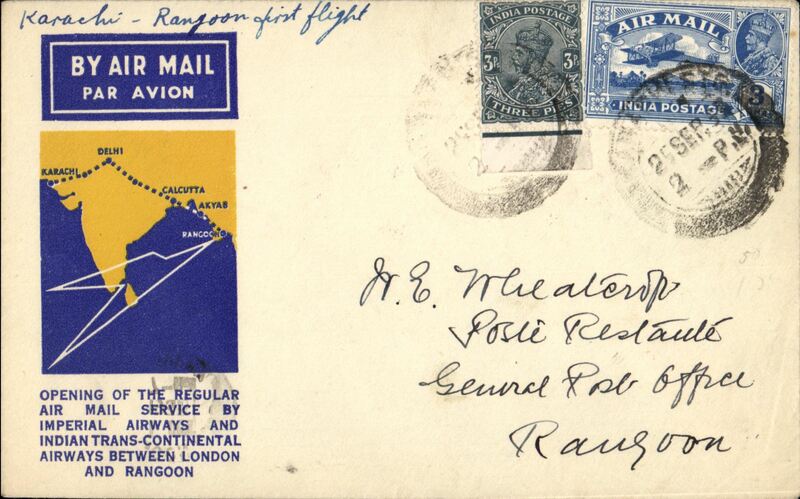 F/F Calcutta to Rangoon flown on India extension to Singapore, scarce blue/cream souvenir etiquette cover with printed INAW logo and "Opening of the Regular Air Servce by Indian National Airways Ltd between Calcutta and Rangoon", b/s 6/12. 52 flown. 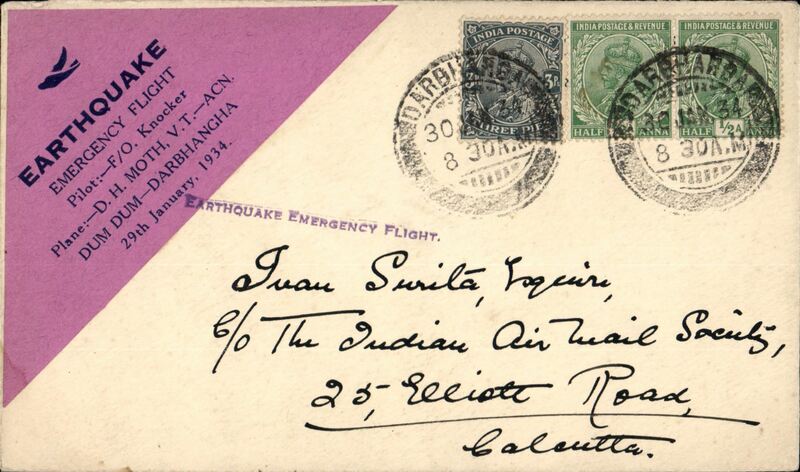 Bihar India Earthquake Emergency Flight by RAF, Dum Dum to Darbangha, plain cover franked 1a 3p canc Darbangha cds, black/Mauve label "Earthquake/Emergency Flight/Pilot F/O Knocker/Plane -DH Moth VT - ACN/ Dum Dum-Darbangha/29 January, 1934" tied by 'Earthquake Emergency Flight' hand stamp. Air Taxi Service, F/F Vizagapatam to Calcutta 11/2 leg, of inaugural Madras to Calcutta service, par avion etiquette, b/s, souvenir 1anna 3p PSE with additional 2anna stamp. 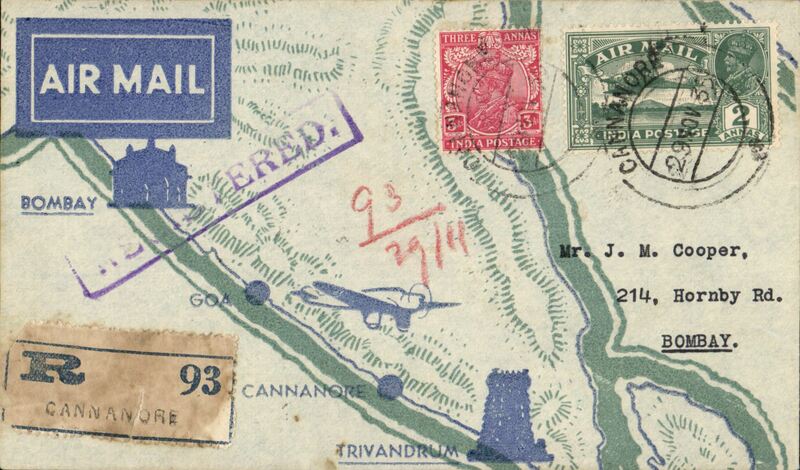 Madras Air Taxi Service, F/F Vizagapatam to Calcutta, b/s 11/2, printed souvenir cover. F/F Vizagapatam to Ganeveram, b/s, printed souvenir cover, Madras Air Taxi Service. 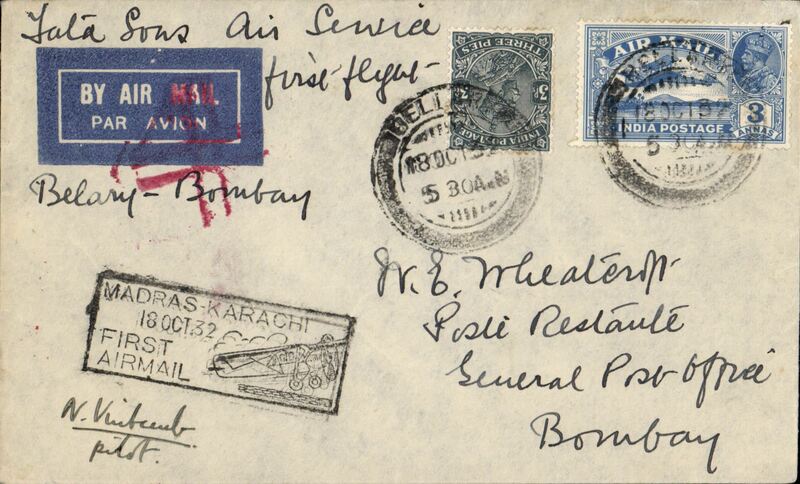 Scarce first inward acceptance, Brussels to Quetta, bs 7/12, via Lahore 6/12, carried from Karachi on the inaugural India National Airways Karachi-Sukkur-Lahore service, plain JS Davies airmail etiquette cover franked 5F, 1.50F airs, 20c, 5c ordinary, canc Brussels cds, black framed "Karachi-Lahore/6 Dec 34/First Airmail" cachet front and verso, green straight line "First Flight" hs, typed "By Air in India/First Flight from Karachi". 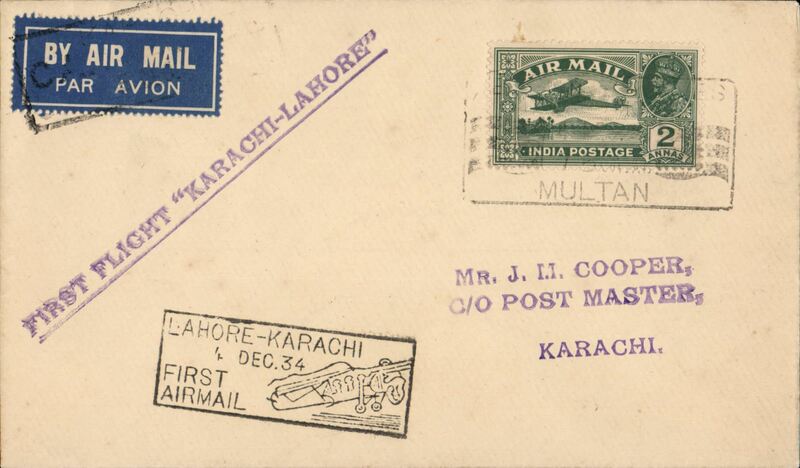 Lahore to Karachi leg of the first weekly service between Karachi and Lahore, b/s 5/12, "1st Flight/Lahore-Karachi" souvenir cover franked 2a canc black boxed "Lahore-Karachi/ 4 Dec.34/ First Airmail" cachet, Indian National Airways. A hand drawn map of route accompanies this item. 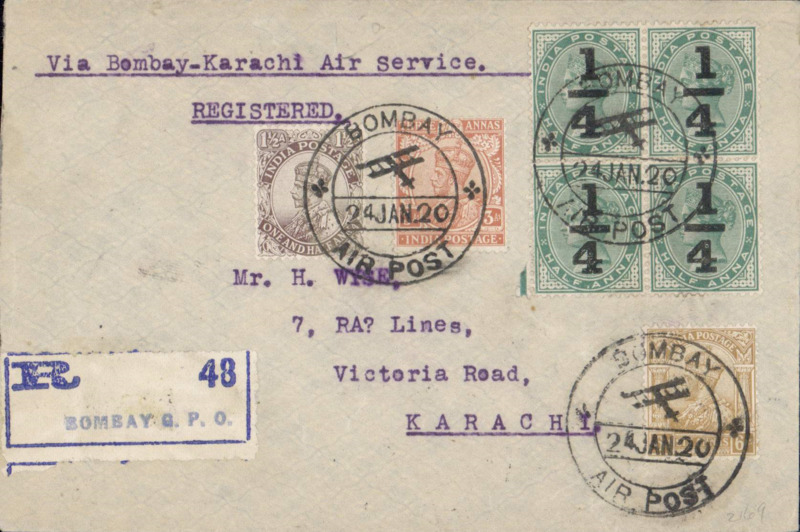 F/F Lahore to Karachi, bs 5/12, airmail etiquette cover franked 2 annas, black boxed "Lahore-Karachi/ 4 Dec.34/ First Airmail" cachet, etiquette cancelled framed "Karachi/Cancelled/5DEc 34" Jusqu'a (McQueen p 76), violet straight line "First Flight Karachi-Lahore", Indian National Airways. 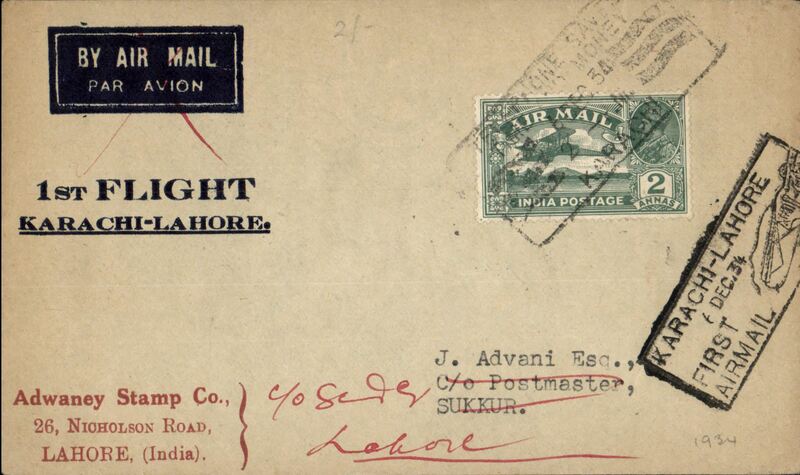 Lahore to Sukkur, bs 4/12, leg of Indian National Airways F/F new weekly service between Lahore and Karachi where it connected with the Imperial Airways flight to and from London (IW.296 and IE.297), printed souvenir cover, franked 2a, canc boxed 'Lahore-Karachi'/First Airmail' cachet. Intermediate halts were at Multan and Sukkur, the latter to connect with the mail train from Quetta (ref Brown J, Indian Air Mails, 1995, and Wingent P, 1999). 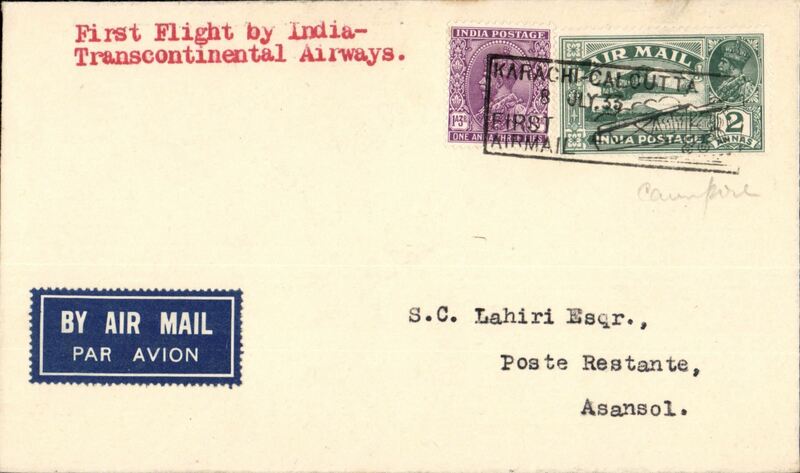 Indian National Airways, Lahore to Calcutta, bs 8/12, carried on the new first weekly service between Karachi and Lahore, plain etiquette cover franked 1anna 9p canc black boxed "Lahore-Karachi 4 Dec.34 First Airmail" cachet, signed Stephen Smith verso. 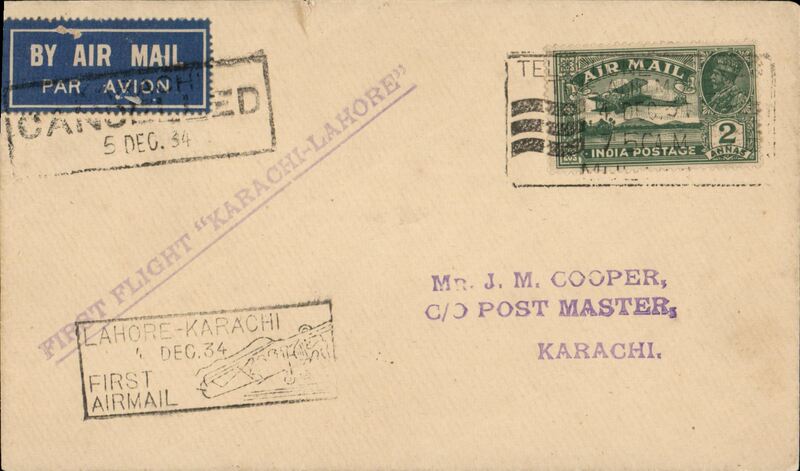 Cover flown Multan to Karachi leg of the first weekly service between Karachi and Lahore, b/s 5/12, violet "First Flight Karachi-Lahore" hs, black boxed "Lahore-Karachi 4 Dec.34 First Airmail" cachet, etiquette tied by black boxed "Karachi Cancelled" Jusqua (McQueen p 76), Indian National Airways. 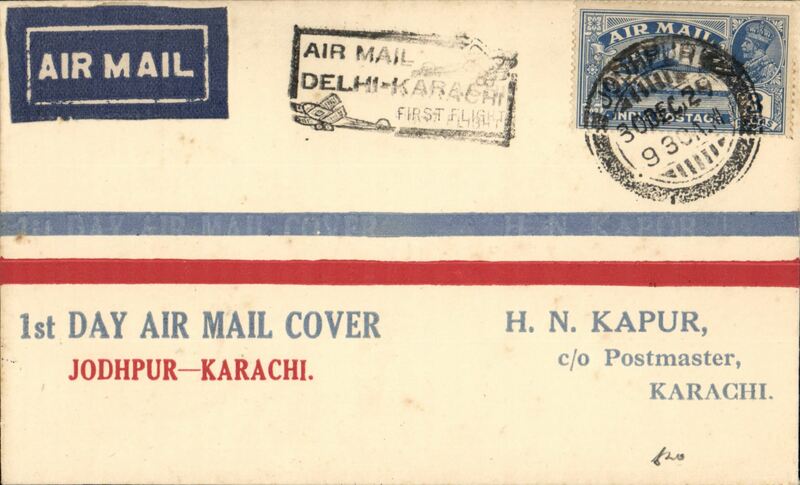 Karachi to Lahore, bs 7/12, leg of Indian National Airways F/F new weekly service between Lahore and Karachi where it connected with the Imperial Airways flights to and from London (IW.296 and IE.297), plain cover franked 2 annas canc boxed 'Karachi-Lahore/First Airmail' cachet. Intermediate halts were at Multan and Sukkur, the latter to connect with the mail train from Quetta (ref Brown J, Indian Air Mails, 1995, and Wingent P, 1999). 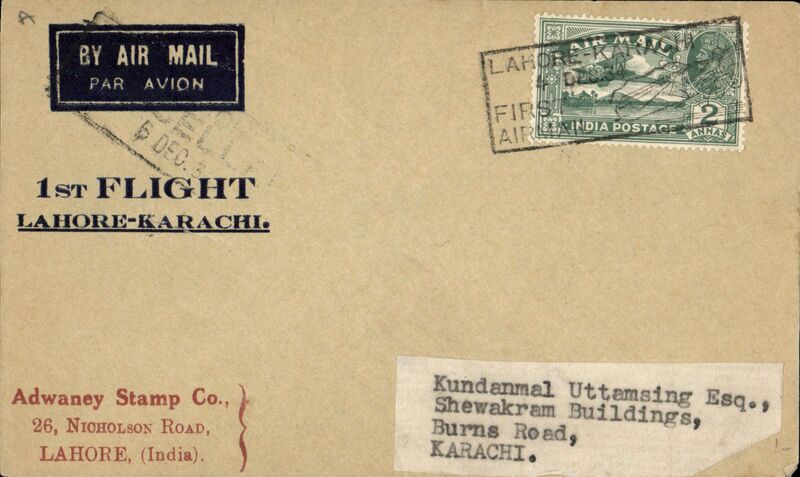 Karachi to Lahore, bs 9/12 via Sukkur 7/12, leg of Indian National Airways F/F new weekly service between Lahore and Karachi where it connected with the Imperial Airways flight to and from London (IW.296 and IE.297), souvenir cover, franked 2a, canc boxed 'Karachi' date stamp, "Karachi-Lahore/First Airmail' cachet. 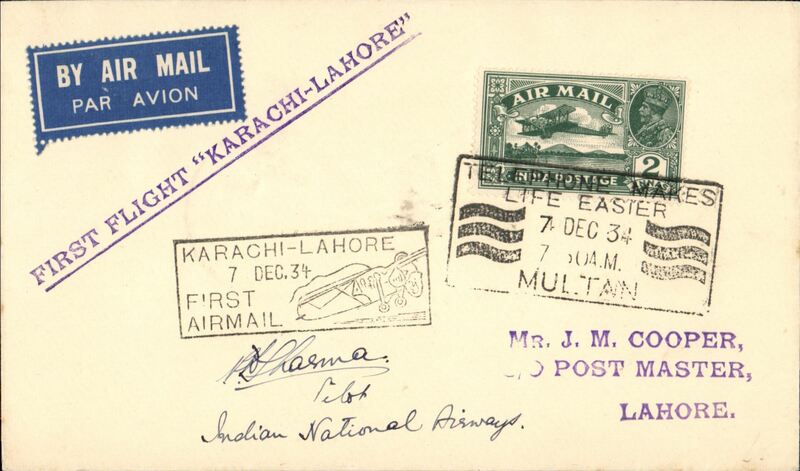 India National Airways, F/F Multan to Lahore, bs 7/12, black boxed "Karachi-Lahore/7 Dec 34/First Airmail" cachet, "First Flight Karachi-Lahore" hs, b/s, par avion etiquette cover franked 2 Anna, canc black framed '7 Dec 34/Multan' postmark, signed by the pilot P.D.Sharma. 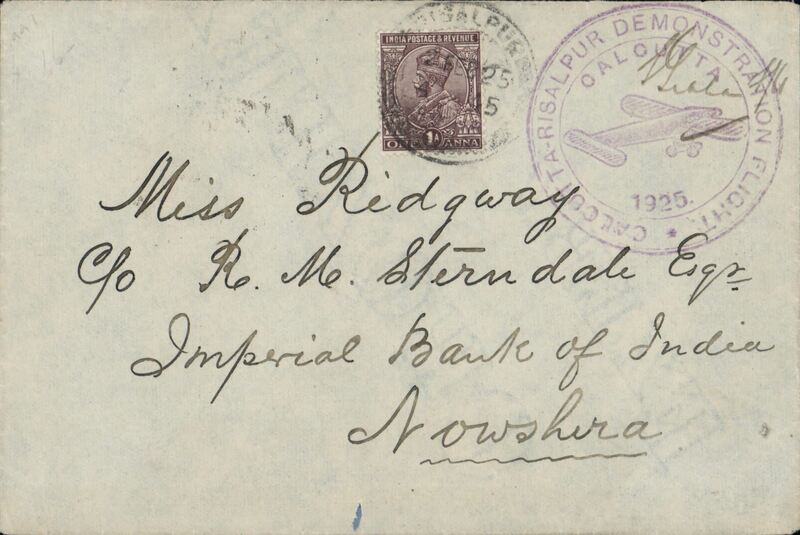 Cawnpore to Brisbane, bs 21/12, red/white/blue 'Kangaroo' souvenir cover, franked 11a, canc Cawnpore cds. 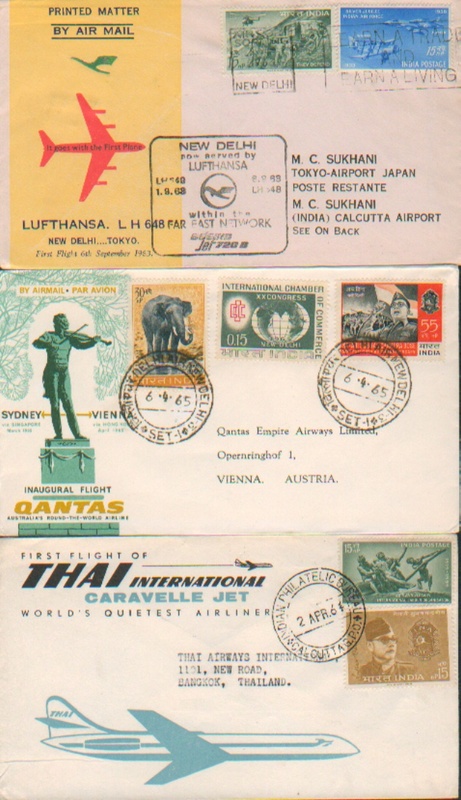 Imperial Airways and Qantas Empire Airways combined to operate the first regular through service from England to Australia, the first flight left London on 8 December and, travelling via India, Singapore, the Dutch East Indies and Darwin, and reached Brisbane on 21 December, (ref Brown J, Indian Air Mails, 1995). 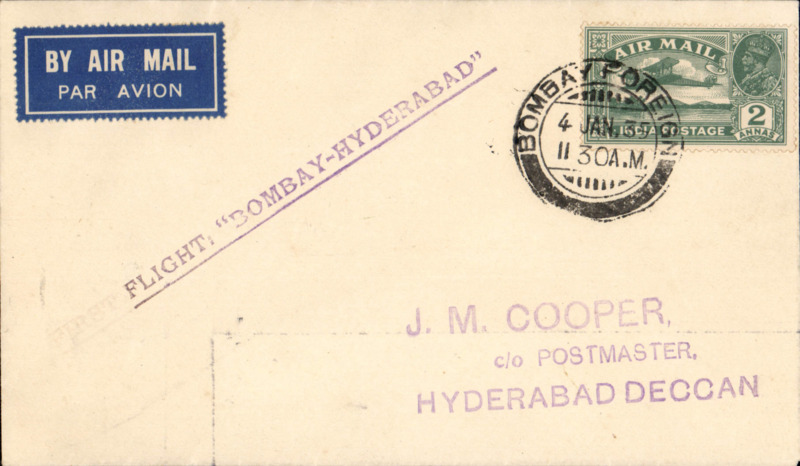 Itinerary change from Bellary to Hyderabad on Karachi-Madras service, Bombay to Hyderabad, bs 4/1, airmail etiquette cover franked 2annas, straight line F/F cachet. 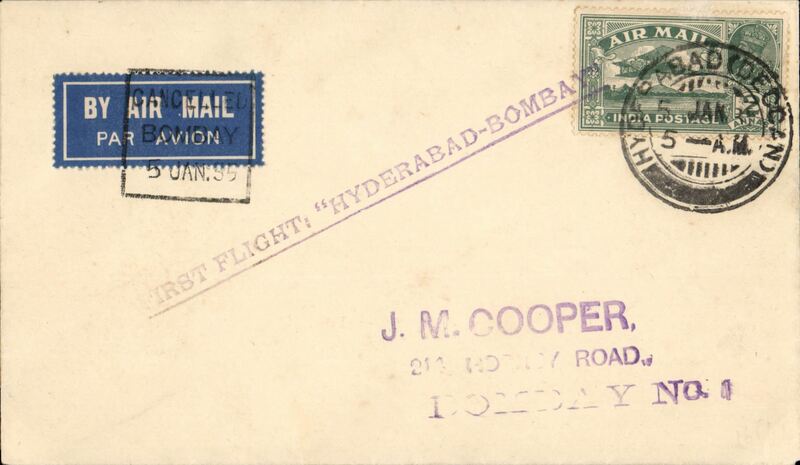 Itinerary change from Bellary to Hyderabad on Karachi-Madras service, Hyderabad to Bombay, bs 5/1, airmail etiquette cover franked 2annas, straight line F/F cachet. TATA F/F Hyderabad to Bombay, violet st line cachet "First Flight Hyderabad-Bombay", b/s 5/1, also etiquette tied by "Cancelled Bombay 5/1/35" Jusqua, plain cover franked 2a. 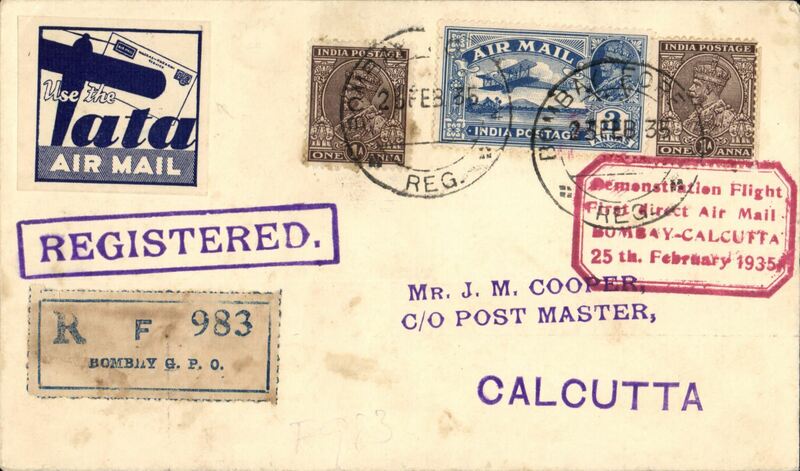 Bombay to Calcutta, bs 25/2, franked 2 annas 9p with purple boxed "Demonstration Flight/ First Direct Airmail Calcutta to Bombay" cachet, plain buff cover. 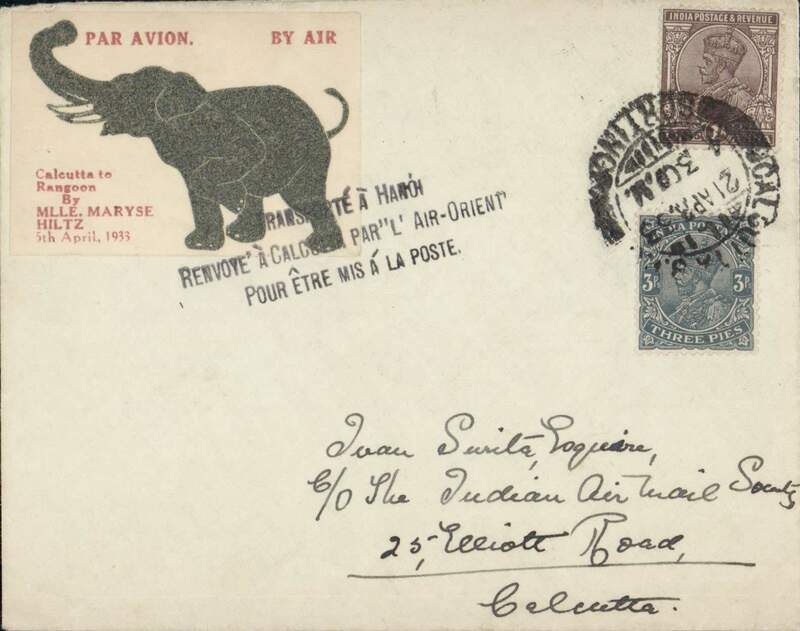 Bombay to Calcutta, bs 25/2, franked 2 annas with red boxed "Demonstration Flight/ First Direct Airmail Calcutta to Bombay" cachet, plain airmail etiquette cover franked 2 annas. 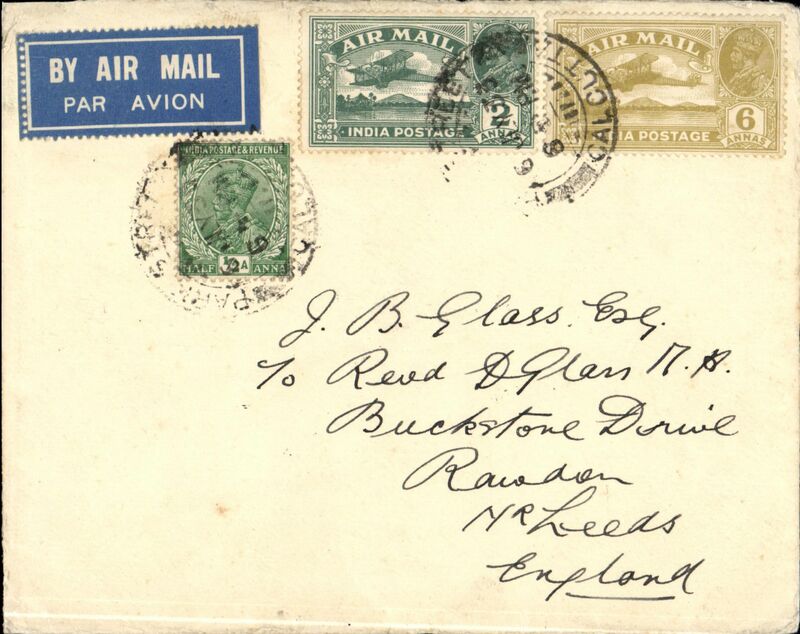 Bombay to Nagpur, bs 25/2, plain cover franked 2 annas with red boxed "Demonstration Flight/ First Direct Airmail/Bombay- Calcutta/25th February 1935" cachet. Uncommon destination. 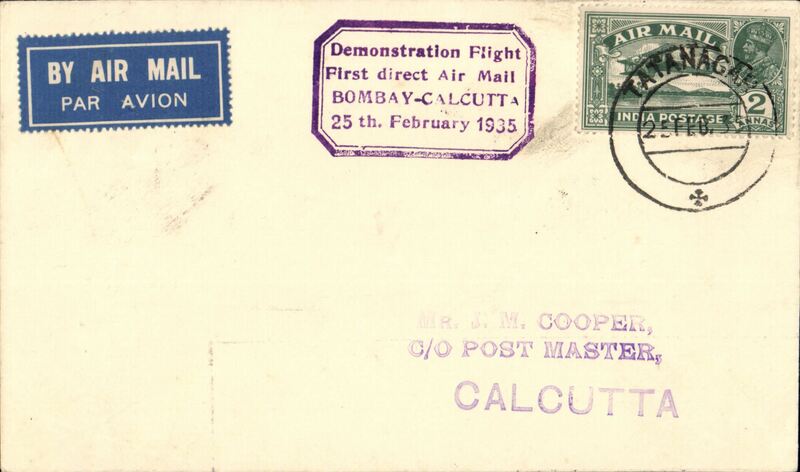 Bombay to Tatanagar, bs 25/2, plain cover franked 2 annas, tied rectangular ' Use the Air Mail/24-Feb-35/Nagpur' advert as canceller, red boxed "Demonstration Flight/ First Direct Airmail/Bombay-Calcutta/25thvFebruary 1935'. Uncommon destination. 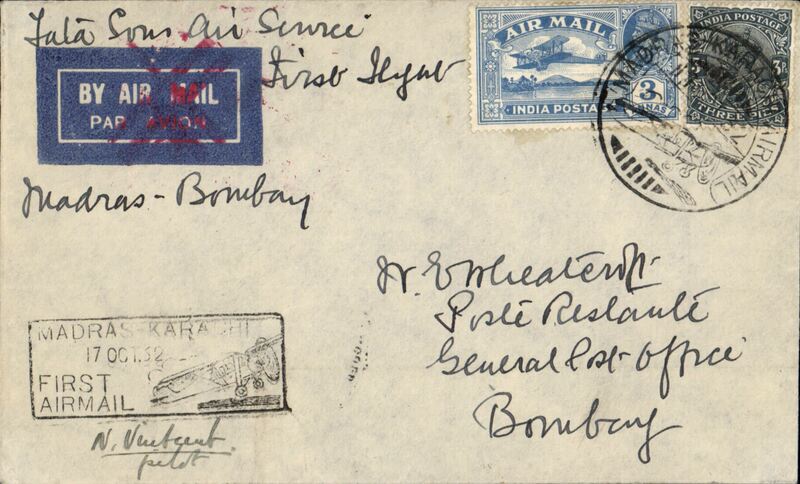 Bombay to Tatanagar, bs 25/2, plain cover franked 2 annas, canc Bombay cds, red boxed "Demonstration Flight/ First Direct Airmail/Bombay-Calcutta/25th February 1935'. Uncommon destination. 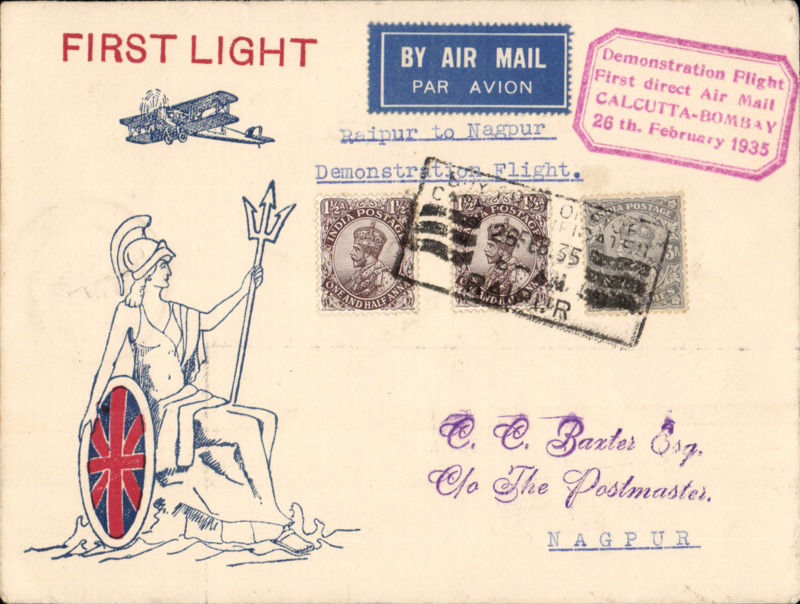 Bombay to Nagpur, bs 25/2, uncommon red/white/blue India Air Service Britannia with Union jack shield cover franked 2 annas tied by rectangular ' Use the Air Mail/24-Feb-35/Nagpur' advert as canceller, red boxed "Demonstration Flight/ First Direct Airmail/Bombay- Calcutta/25th February 1935" cachet. Uncommon destination. 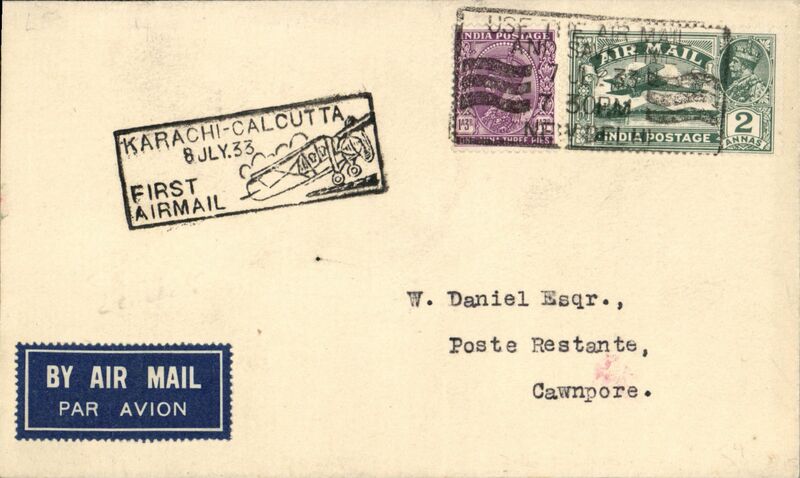 Tatangar to Calcutta, bs 25/2, plain cover franked 2 annas, canc Tatangar cds, purple boxed "Demonstration Flight/ First Direct Airmail/Bombay-Calcutta/25th February 1935'. Uncommon origin. 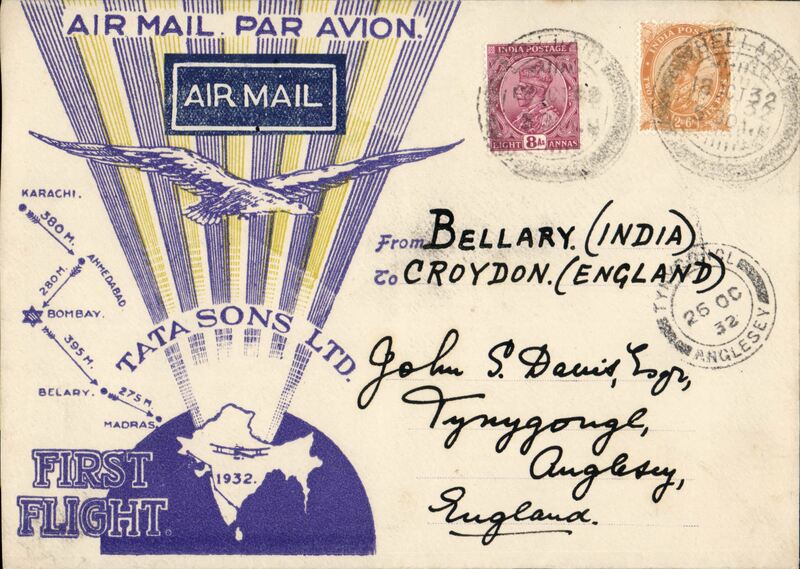 Bombay to Calcutta, bs 25/2, printed TATA Sons Ltd pale blue/dark blue souvenir 'Airspeed Envoy' cover, franked 2 annas, red framed "Demonstration Flight/ First Direct Airmail Calcutta to Bombay" cachet, Signed by the pilot Neville Vintcent. 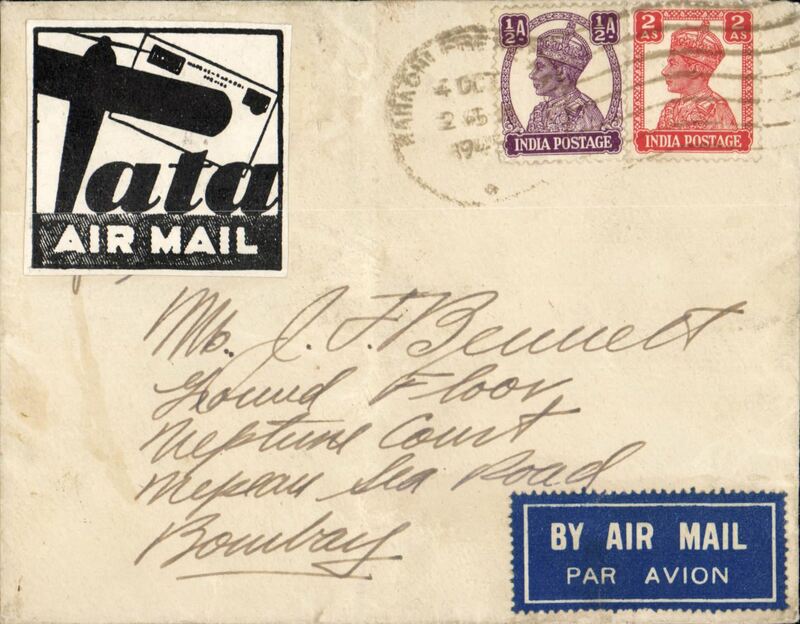 Special TATA label applied to a registered cover advertising the new Bombay-Calcutta airmail service, plain cover franked 5 anna, blue/white Tata label, registration label, red framed "Demonstration Flight/ First Direct Airmail Calcutta to Bombay" cachet, and fine purple framed 'Registered' hs. 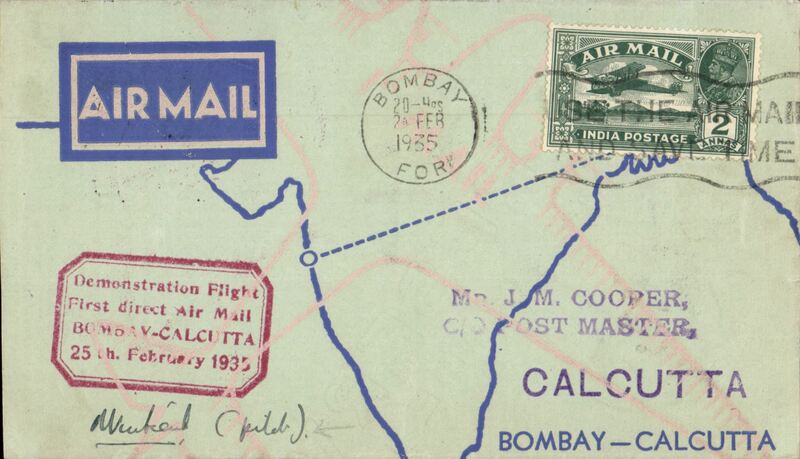 Calcutta to Bombay, bs 6/2, franked4 1/2 annas with red boxed "Demonstration Flight/ First Direct Airmail Calcutta to Bombay" cachet, printed dark blue/cream souvenir 'map' cover. 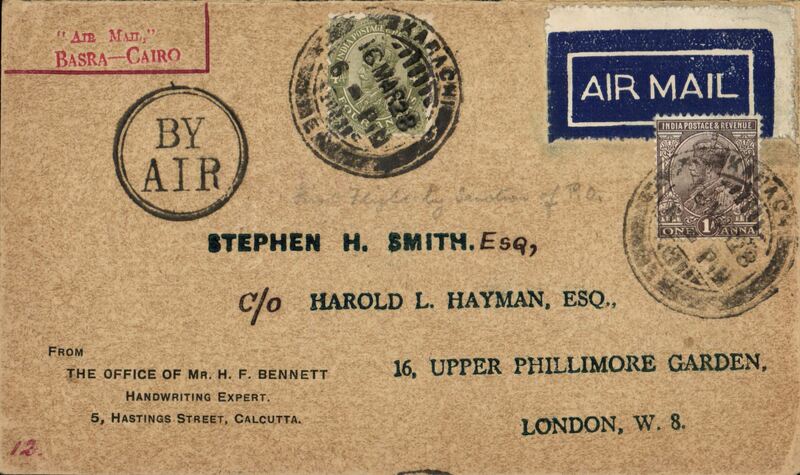 Bombay to Tatanagar, bs 25/2, plain cover franked 2 annas with red boxed "Demonstration Flight/ First Direct Airmail Calcutta to Bombay" cachet, typed "Bombay to Tatanagar". Uncommon destination. 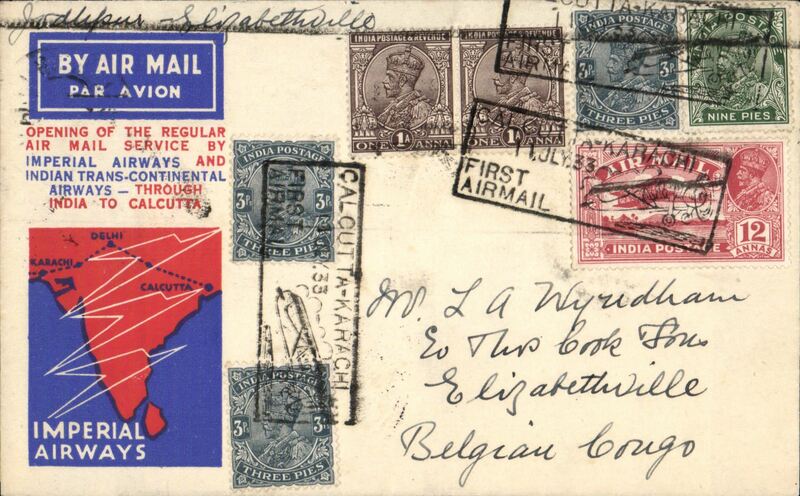 Bombay to Calcutta, bs 25/2, plain cover franked 2 annas with red boxed "Demonstration Flight/ First Direct Airmail Calcutta to Bombay" cachet, typed "Bombay - Calcutta Air Mail Demonstration". 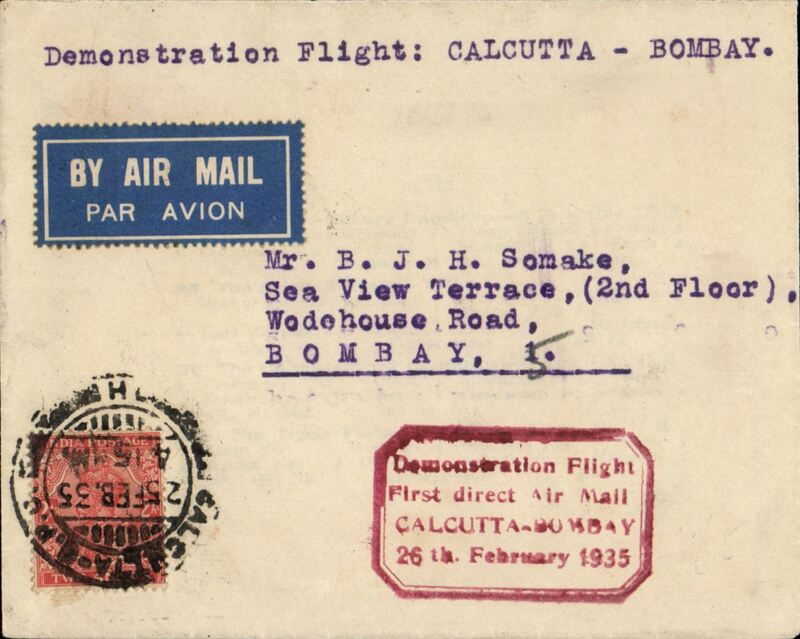 Calcutta to Bombay, bs 26/2, plain cover franked 2 annas with red boxed "Demonstration Flight/ First Direct Airmail Calcutta to Bombay" cachet, typed "Demonstration Flight: Calcutta - Bomaby". 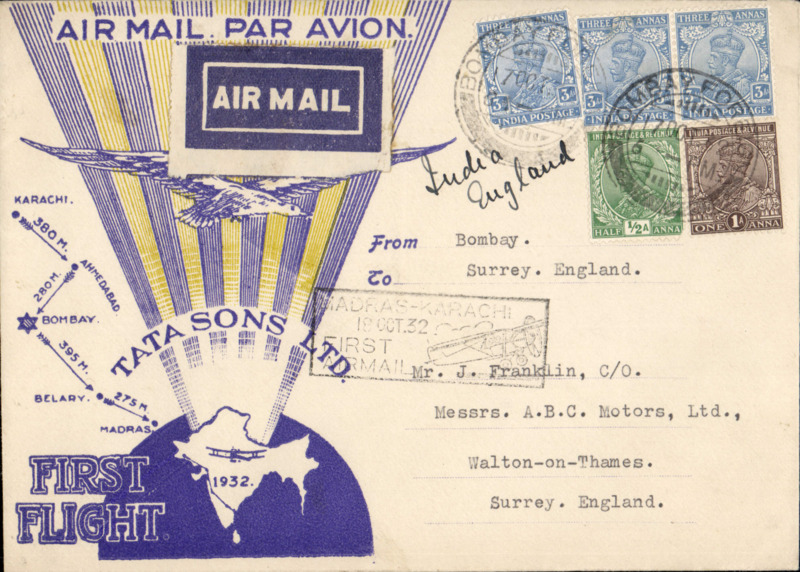 Bombay to Calcutta, bs 25/2, franked 2 annas with red boxed "Demonstration Flight/ First Direct Airmail Calcutta to Bombay" cachet, printed TATA Sons Ltd pale blue/dark blue souvenir 'map' cover. 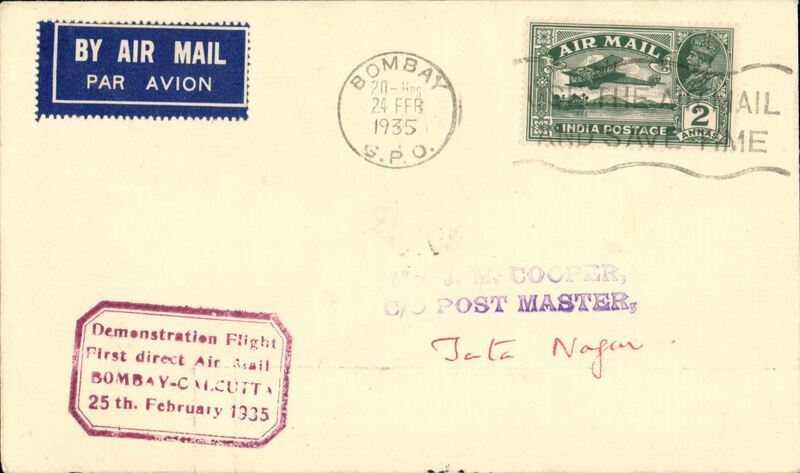 Nagpur to Bombay, bs 26/2, plain cover franked 3 annas, tied rectangular ' Use the Air Mail/24-Feb-35/Nagpur' advert as canceller, red boxed "Demonstration Flight/ First Direct Airmail/Calcutta-Bombay/26thFebruary 1935'. Uncommon destination. 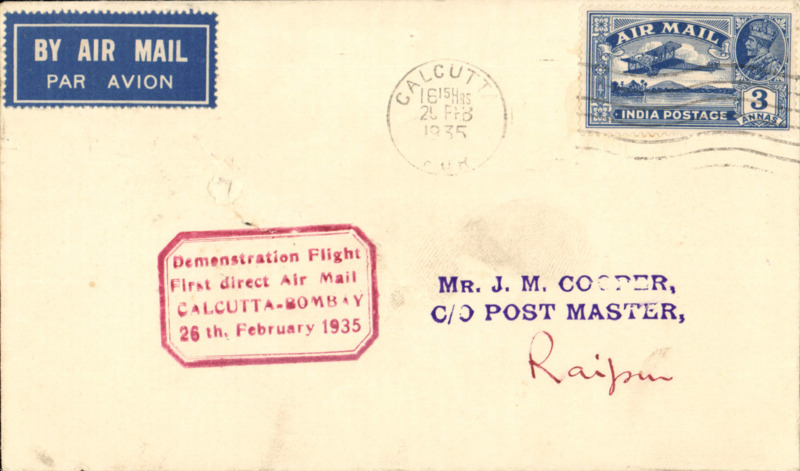 Calcutta to Raipur, bs 27/2, plain cover franked 3 annas, canc Calcutta cds, red boxed "Demonstration Flight/ First Direct Airmail/Calcutta-Bombay/26th February 1935'. Uncommon destination. 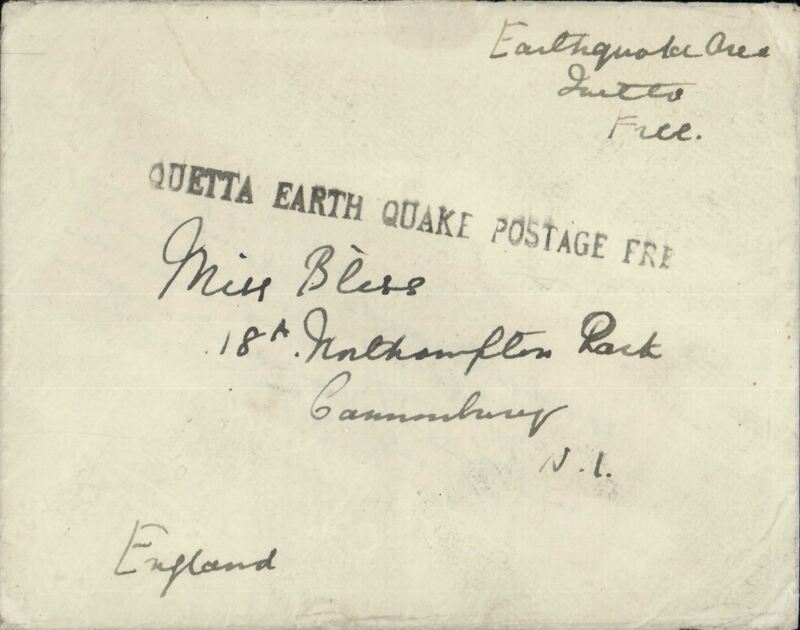 Quetta Earthquake Emergency Mail, plain unfranked cover from Quetta to Ziarat, bs 12/6, also postmarked verso Quetta 11 June, black st line "Quetta Earth Quake Postage Free" hs, and ms 'Earthquake Service. On the morning of 31 May 1935 a massive earthquake almost entirely destroyed the city of Quetta killing, some 60,000 people. It also brought the postal services temporarily to a halt. The RAF instituted a skeleton service as quickly as possible, with no charge being made. Cachets were applied by means of rubber stamps on each unregistered article by the Post Office and the public were also allowed to write “Earthquake Area Postage Free” on such articles, ref #35-50, Indian Air Mails, Brown J, 1995. Quetta Earthquake Emergency Mail, plain unfranked cover from Quetta to Karachi, bs 15/6, also postmarked verso Quetta 13 June, black st line "Quetta Earth Quake Postage Free" hs, and ms 'Quetta Earthquake". On the morning of 31 May 1935 a massive earthquake almost entirely destroyed the city of Quetta killing, some 60,000 people. It also brought the postal services temporarily to a halt. The RAF instituted a skeleton service as quickly as possible, with no charge being made. Cachets were applied by means of rubber stamps on each unregistered article by the Post Office and the public were also allowed to write “Earthquake Area Postage Free” on such articles, ref #35-50, Indian Air Mails, Brown J, 1995. Quetta Earthquake Emergency Mail, plain unfranked cover from Quetta addressed to England, bs Quetta 14 June, and on front black st line "Quetta Earth Quake Postage Free" hs and ms 'Earthquake Area/Quetta/Free". On the morning of 31 May 1935 a massive earthquake almost entirely destroyed the city of Quetta killing, some 60,000 people and bringing the postal services temporarily to a halt. The RAF instituted a skeleton service as quickly as possible, with no charge being made. Cachets were applied by means of rubber stamps on each unregistered article by the Post Office and the public were also allowed to write “Earthquake Area Postage Free” on such articles, ref #35-50, Indian Air Mails, Brown J, 1995. Uncommon paquebot airmail cover at sea, posted from British liner with GB stamps and Indian postmark, (Indian Ocean) to London, no arrival ds, P&O Compamy cover with logo on flap, franked GB 1 1/2d x4, canc 'Bombay Foreign/26 ep 35/Paquebot' double ring cds, large black square topped (possibly unlisted) "Air Mail" directional hs. A nice item for the specialist. TATA, F/F Bombay-Trivandrum, no arrival ds, printed souvenir cover, franked 2anna, red boxed "Demonstation Flight First Direct Airmail Bombay-Trivandrum" cachet. In co-operation with the Government of HH the Maharajah of TATA established an experimental weekly service between Bombay and Trivandrum via Goa and Cannanore. The consent of the Portuguese Government was necessary for the call to be made at Goa and the Government of India agreed to the use of a military landing ground at Cannanore.The service connected at Bombay with Tata’s Karachi-Madras service, only 50 flown. Ref 35-70 Brown J, Indian Air Mails, 1995. 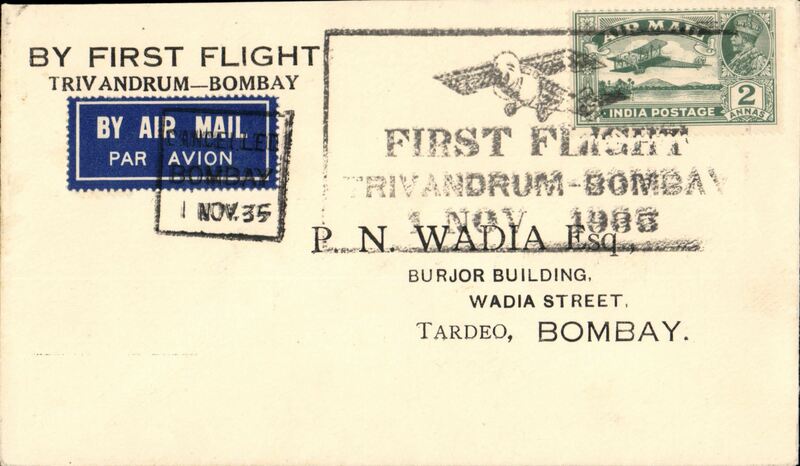 TATA, F/F Bombay to Trivandrum, bs three line "First Flight/Bombay-Trivandrum/29 Oct 1935" arrival hs, printed souvenir cover franked 2 annas canc Bombay cds, red framed "Demonstration Flight/First Direct Air Mail/Bombay-Trivandrum/29 October 1935". Only 50 flown, and one of the very few of these signed by the pilot B.K.N.Rao. TATA Bombay-Trivandrum, bs 29/10, attractive green/pale green.grey printed 'map of route' souvenir cover, franked 2x 2 1/2 anna canc Bombay cds, red framed 'Demonstration Flight/First Direct Air Mail/Bombay-Trivandrum/29 October 1935'. Ref 35-70, Brown J, Indian Air Mails, 1995. Scarce item, only 50 flown. 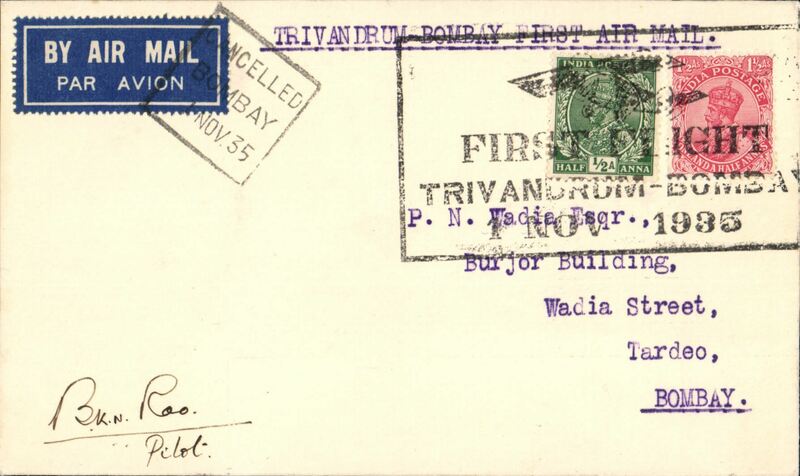 TATA Bombay-Trivandrum, bs 29/11, plain cover, franked 1 anna canc Bombay cds, red framed 'Demonstration Flight/First Direct Air Mail/Bombay-Trivandrum/29 October 1935'. Ref 35-70, Brown J, Indian Air Mails, 1995. Scarce item, only 50 flown. 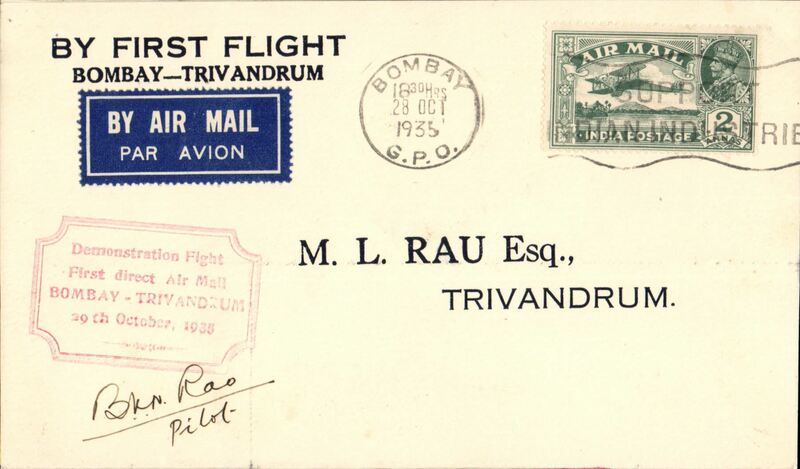 TATA, F/F Trivandrum to Bombay, bs 2/11, plain cover franked 2 annas canc special boxed postmark with monoplane 'First Flight/Trivandrum-Bombay/1 Nov 1935'. 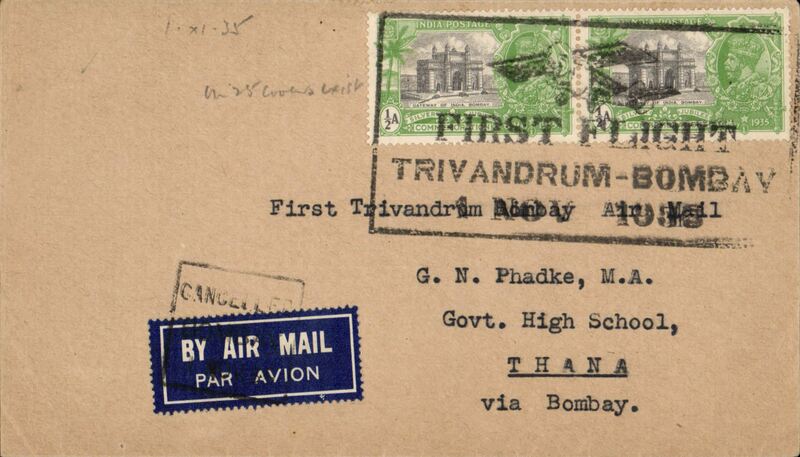 TATA, F/F Trivandrum to Bombay, bs Thana 2/11, plain cover franked 2 annas canc special boxed postmark with monoplane 'First Flight/Trivandrum-Bombay/1 Nov 1935'. 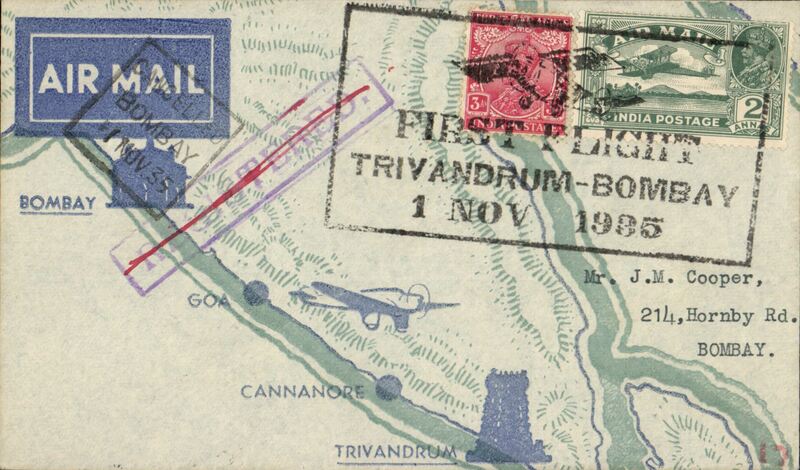 TATA Trivandrum to Bombay, bs 2/11, attractive green/pale green.grey printed 'map of route' souvenir cover, franked 2 anna 3p canc canc special boxed postmark with monoplane 'First Flight/Trivandrum-Bombay/1 Nov 1935'. Tata new service, Cannacore to Trivandrum, bs 28/11, registered (label) printed TATA Sons Ltd pale blue/dark blue souvenir 'route map' cover, franked 5 annas canc Cannacore cds'. Only 25 flown. Tata new service, Cannacore to Bombay, bs 30/11, registered (label) printed TATA Sons Ltd pale blue/dark blue souvenir 'route map' cover, franked 5 annas canc Cannacore cds'. Only 25 flown. Imperial Airways, Calcutta to Denmark, bs Copenhagen 10/2, Mazda's Wines and Provisions, Calcutta, printed cover with company logo on flap, franked 8 Anna 18p, dark blue/white airmail etiquette. Likely IAW service IW411 to Paris or Croydon. 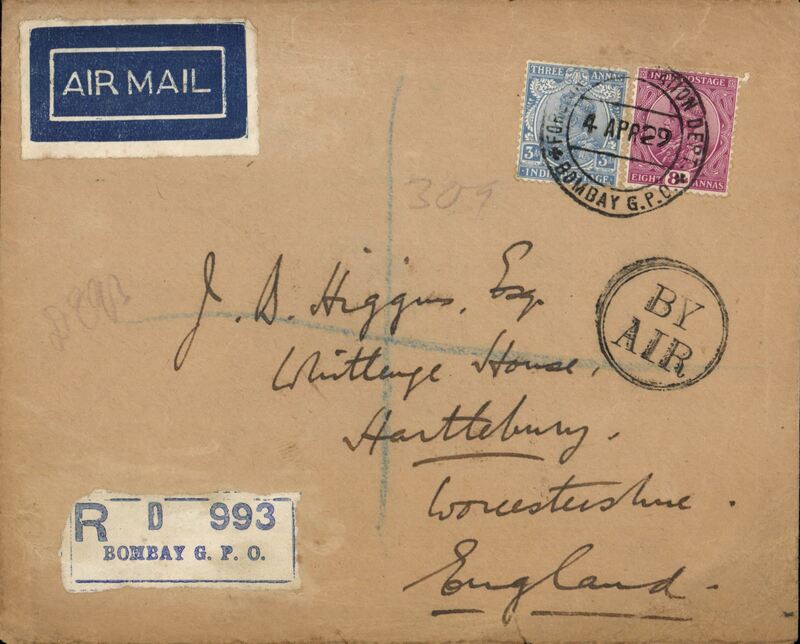 Imperial Airways, Calcutta to London, no arrival ds, plain cover franked 7anna 6p, uncommon violet straight line "India-England (Croydon) instructional hs, blue/white etiquette. .
Allahabad to England, bs 16/9, registered (Allahabad label) plain buff cover franked 10 1/2 annas, airmail etiquette, sender's ad dress on front neatly excised. 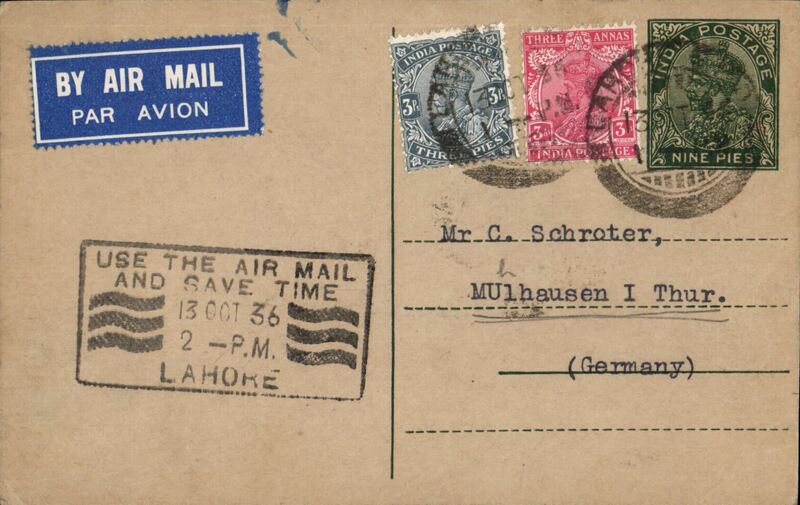 India to Germany, Lahore to Mulhausen, private 21 Okt 1936 arrival hs verso, 9P India PSC with additional 3P & 3 annas franked Lahore cds, fine strike large black framed 'Use The Air Mail/and Save Time/13 Oct 36/Lahore' hs. 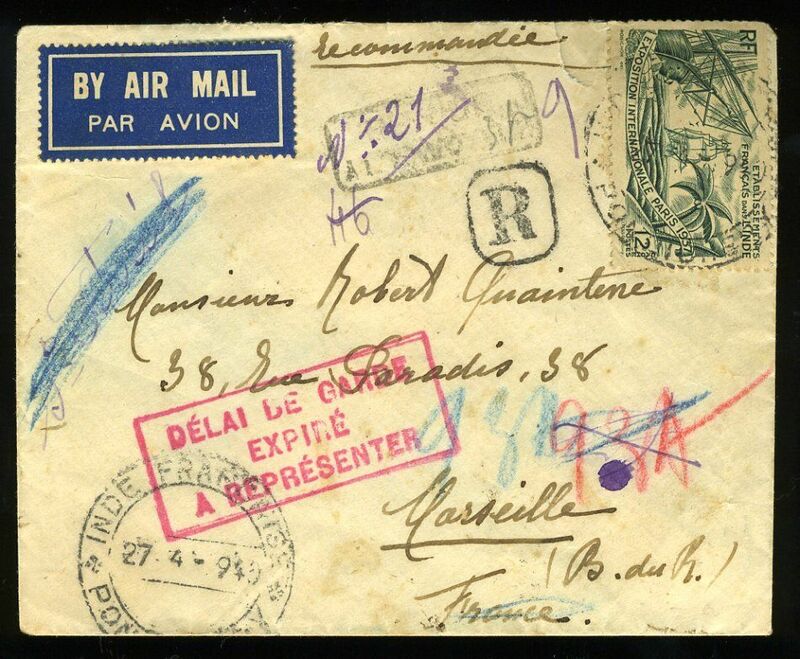 Airmail posted from a paquebot in the Indian Ocean, to London, no arrival ds, 4th/7th Royal Dragoon Guards envelope with embossed logo on flap, franked KE VIII 1 1/2 block of 4, canc 'Bombay Foreign/10 Nov 36/Paquebot', black framed 'Air Mail' hs. Nice item. 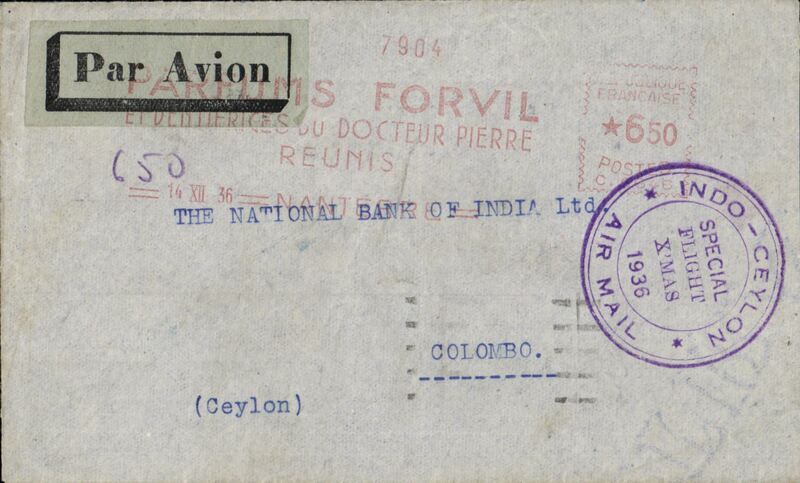 The only known French acceptance for carriage to Ceylon on the Special Christmas flight, Bombay to Colombo, bs 23/12, via Paris Avion 15/12, pale grey airmail etiquette cover, franked 6F50 postmarked red Paris 14.XII.36 machine cancellation, violet circular 'Special Flight Xmas' cachet,TATA. .
Special Christmas flight, Bombay to Colombo, bs 23/12, violet circular flight cachet, TATA blue/light blue souvenir company cover, signed by the pilot H.D. Bhanuchy. 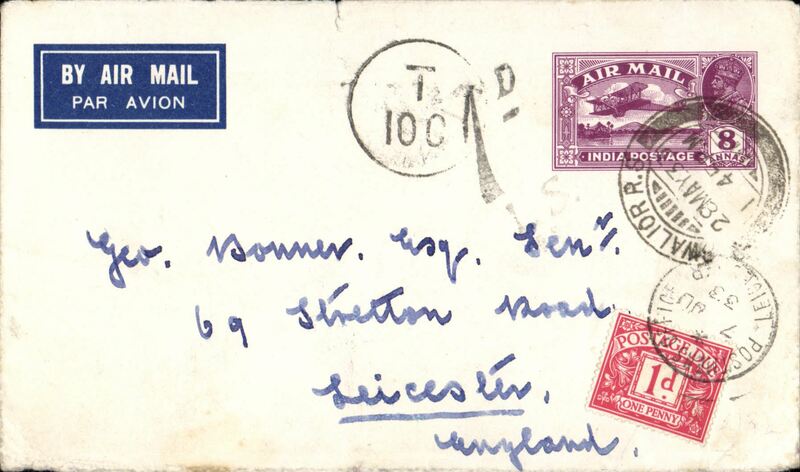 Extension to Ceylon of Karachi-Madras service, blue/black TATA imprint etiquette airmail cover franked 1 anna, canc special 'India-Ceylon/December 1936' used as canceller, signed by pilot B.K.N. Rao. Scarce signature. 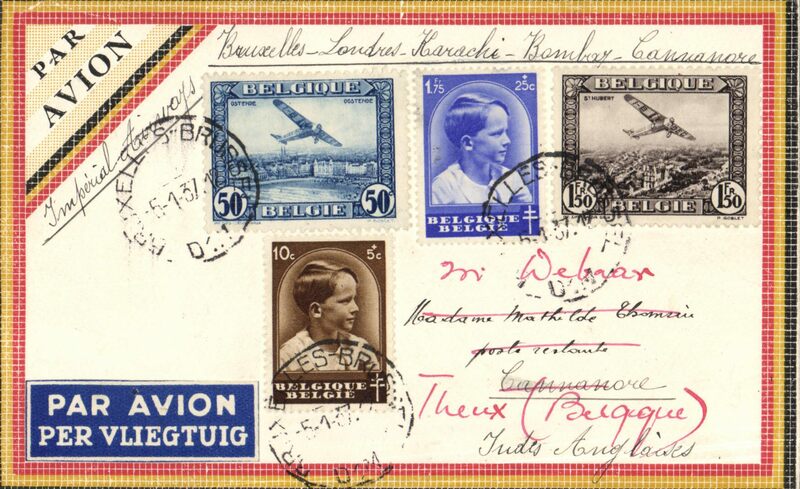 Inward to India from Belgium, first Belgium acceptance for the first Imperial Airways service to Cannanore, bs 13/1, a new stop on the England to Australia service, M Debaar black/yellow/red border airmail cover franked 3F85, canc Brussels 5/1/37. Cannanore is the administrative headquarters of the District of Kannur and 518km north of state capital Trivandrum. During British rule in India, Kannur was known by its old name Cannanore(Land of Lord Krishna) and was of great strategic military importance. This is the first Imperial Airways F/F to Cannanore we have seen, see Jennekins & Godinas, 1969, p75. A superb item in pristine condition. 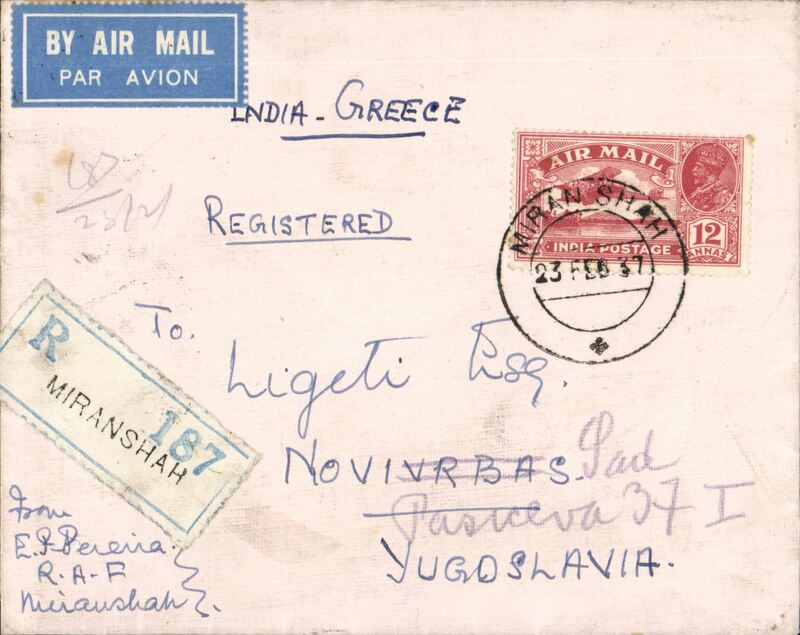 India to Yugoslavia, Miran Shah to Novivbras, bs 4/3, via Athens 2/3, registered (label) cover franked 12 annas, airmail etiquette. Sent from RAF base at Miranshah which was the smallest and most remote RAF station in India. It was situated in the North West Frontier Province about seven miles from the border of Afghanistan. Miramshah, or Miranshah, is a town and administrative headquarters of the North Waziristan Agency in the Federally Administered Tribal Areas of Pakistan, and is now a base for the Pakistani Taliban..
Army HQ Simla to London, no arrival ds, imprint etiquette OHMS registered (label) cover, 27x12 cm, franked 1R, 3anna x3, 1/2anna 'Service' stamps, violet ' Officer Supervisor, Q.M.G. Branch' hs with facsimile signature, two wax seals verso. TATA extension of Madras-Karachi line to Bhuj, F/F Bhuj to Madras, bs 18/4, b/s, printed "First Flight" etiquette cover franked 1anna x2. 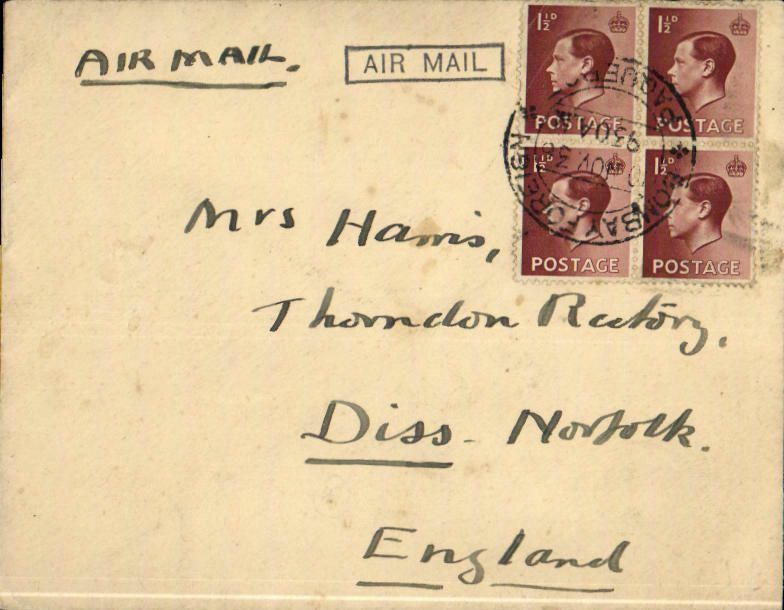 Only two day's notice of change were given and, consequently, very few covers were flown, see Brown, p57. 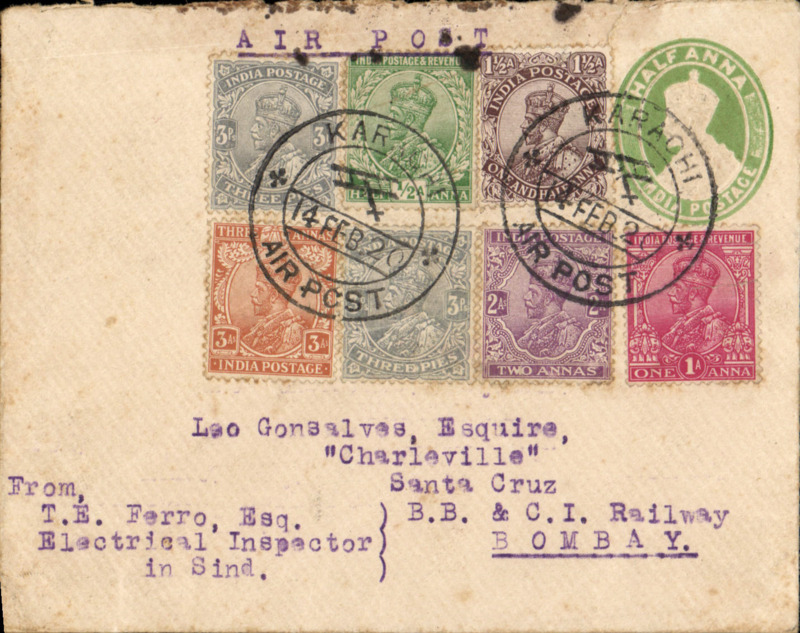 TATA extension of Madras-Karachi line to Bhuj, F/F Bhuj to Bombay, bs 16/4, printed "First Flight" cover franked 1anna x2, airmail etiquette cancelled by black framed 'Cancelled/Bombay/16 APR 37' hs. Only 24 hours notice of change were given and, consequently, very few covers were flown, see Brown, p57. 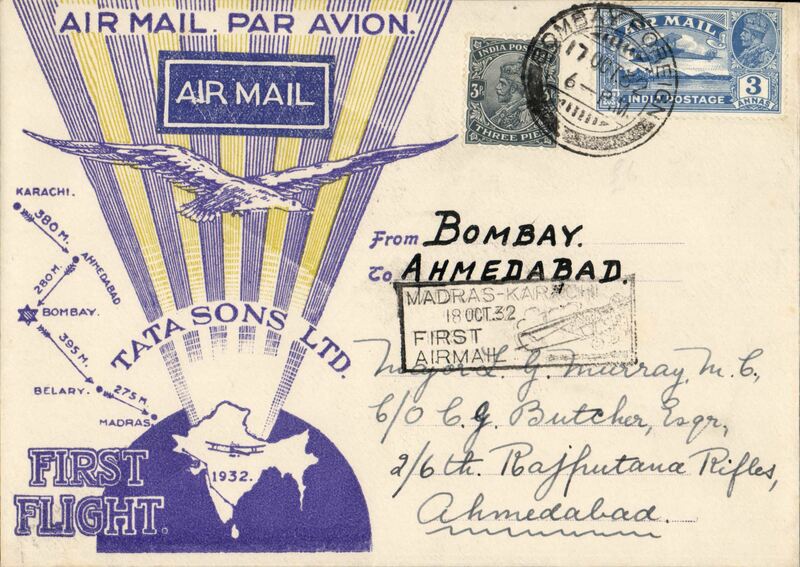 TATA extension of Madras-Karachi line to Bhuj, F/F Bhuj to Ahmedabad, bs 16/4, printed "First Flight" cover franked 1anna x2, airmail etiquette cancelled by black framed 'Cancelled/Ahmedabad/16 APR 37' hs. Only 24 hours notice of change were given and, consequently, very few covers were flown, see Brown, p57. TATA extension of Madras-Karachi line to Bhuj, F/F Karachi to Bhuj, bs 16/4, printed "First Flight" cover franked 1anna x2s, canc Karachi Air cds. Only two days notice of change were given and, consequently, very few covers were flown, see Brown, p57. TATA extension of Madras-Karachi line to Bhuj, F/F Bombay to Bhuj, bs 16/4, printed "First Flight" cover franked 2 annas, canc Bombay GPO cds. Only two days notice of change were given and, consequently, very few covers were flown, see Brown, p57. Also included is a B&W picture of Juhu Aerodrome, 12x7cm. TATA extension of Madras-Karachi line to Bhuj, F/F Hyderabad to Bhuj, bs 16/4, b/s, printed "First Flight" etiquette cover franked 1anna x2. 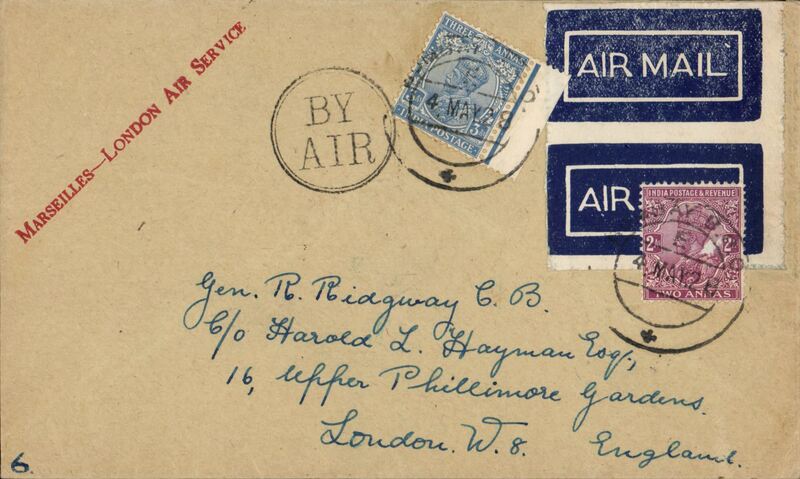 Only two day's notice of change were given and, consequently, very few covers were flown, see Brown, p57. Coronation Rocket flight, printed card postmarked Park Street, signed by Stephen Smith, red/purple rocket stamp tied by black 'By Coronation/Pilot Rocket No P IX' cachet, Elllington-Zwisler #28C1. 200 flown. 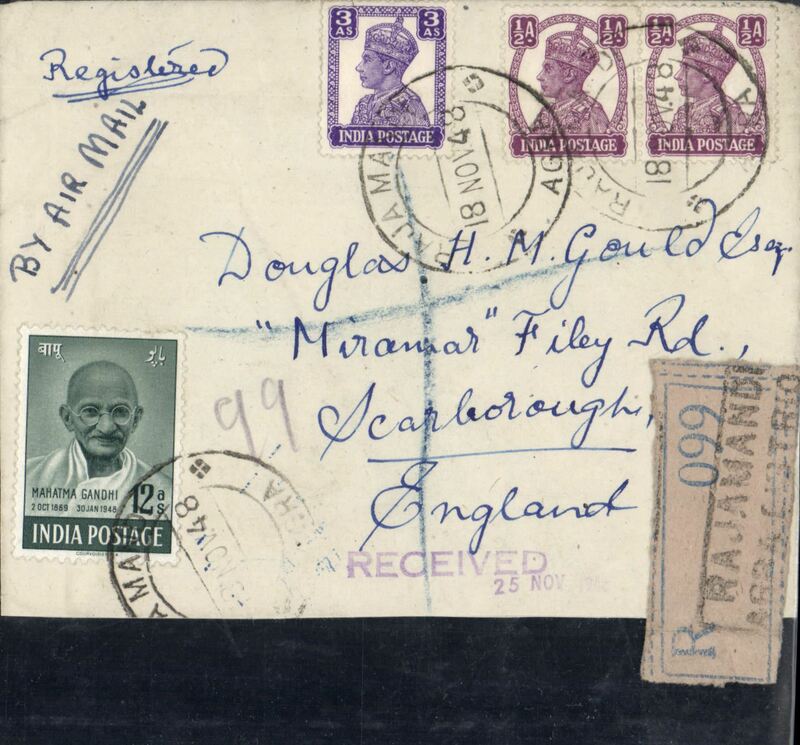 Airmail cover from Calcutta to London, no arrival ds, light grey envelope with blue crown over 'Tagore Castle' embossed on the flap, franked 7 1/2 annas, blue/white airmail etiquette.‘Tagore Castle’ in Pathuruaghata was modelled on an English castle. It had a 30 m high centre tower in the fashion of Windsor Castle in England and there was a clock imported from England, reminiscent of Big Ben. 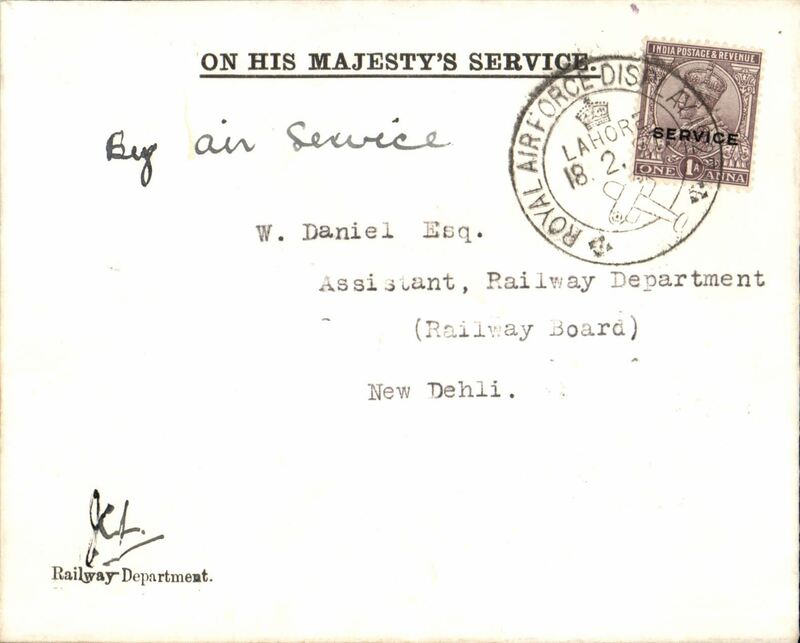 Army HQ Simla to London, no arrival ds, imprint etiquette OHMS cover, 20x10 cm, franked 7 1/2 anna 'Service' stamps, violet ' Officer Supervisor, Q.M.G. Branch' hs with facsimile signature. 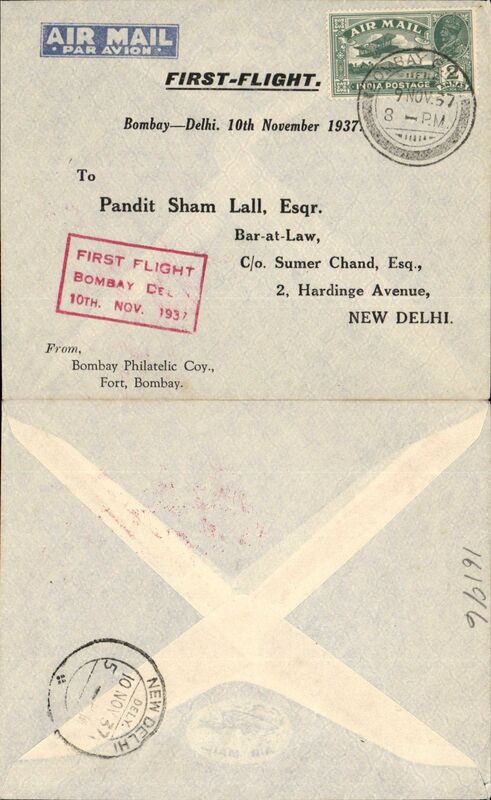 TATA F/F Delhi-Bombay, b/s 8/11, red boxed "First Flight/Bombay-Delhi/10th Nov 1937", printed TATA blue/light blue souvenir cover with company logo on flap. 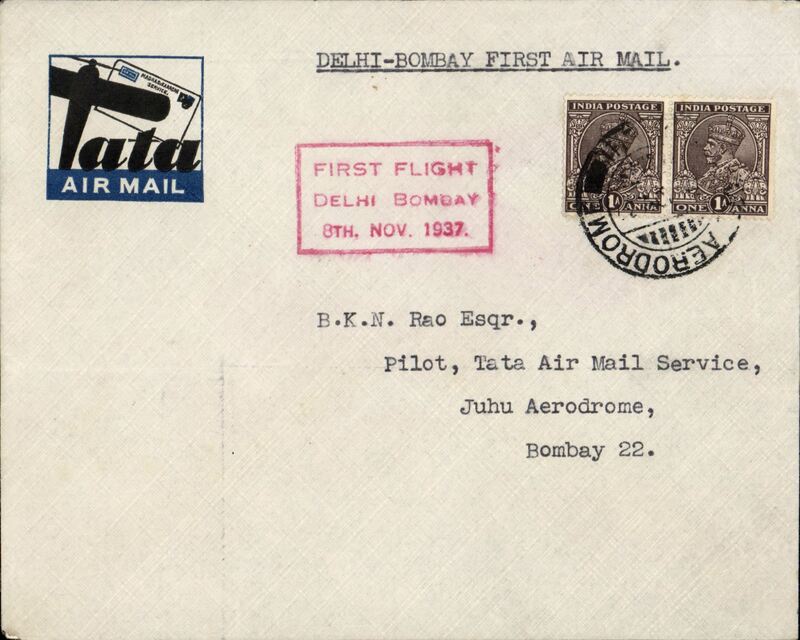 TATA imprint black/blue/white vignette envelope, Delhi to Bombay, bs, addressed to TATA pilot BKN Rao, Juhu Aerodrome, Bombay.Uncommon. 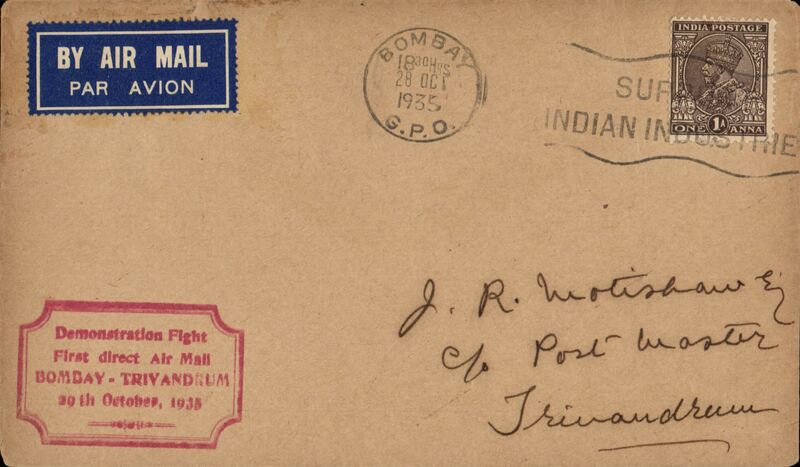 TATA F/F Bombay-Delhi, b/s 10/11, red boxed "First Flight/Bombay-Delhi/10th Nov 1937", attractive PPC showing P&O RMS 'Strathmore' carrying First and Tourist Class Passengers, and the India-Australia Mail Service. TATA F/F Bombay-Delhi, b/s 10/11, red boxed "First Flight/Bombay-Delhi/10th Nov 1937", printed souvenir 'First Flight/Bombay-Delhi' cover. 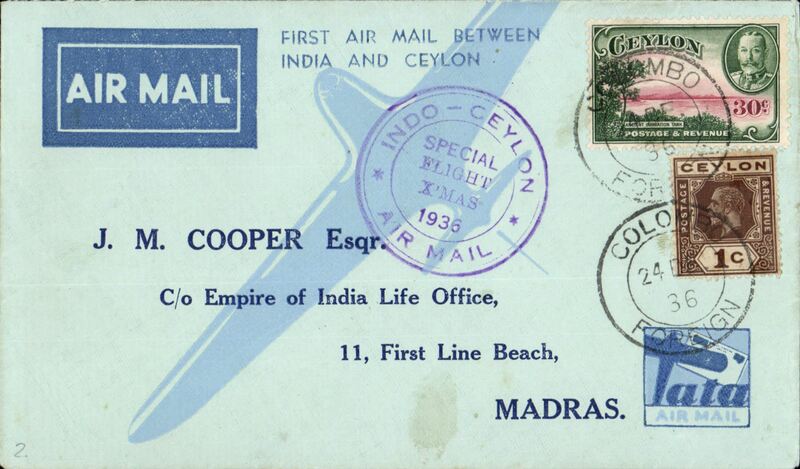 Empire Air Mail Scheme, F/F Madras to Trinchinopoly, bs 1/3, airmail etiquette cover franked 2 annas, TATA. 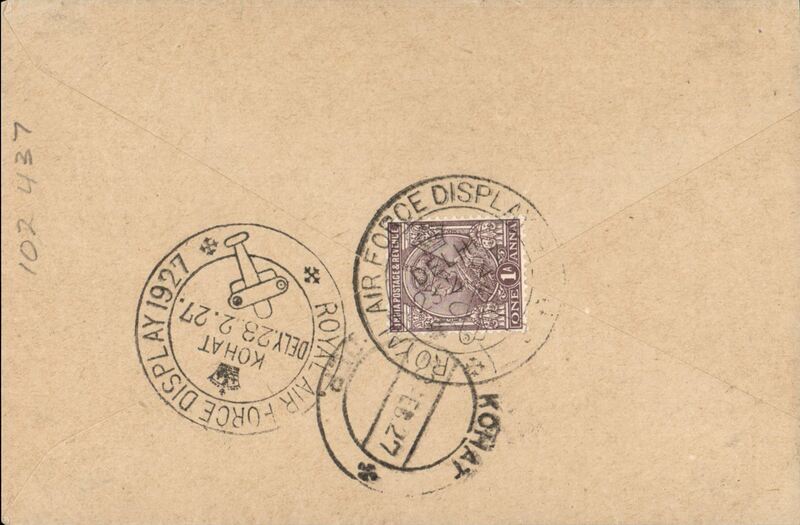 Return second stage Empire Air Mail Scheme, Bombay to England, commercial printed cover franked 2 1/2 annas. Carrid from Karachi by the flying boat 'Carpentaria'. 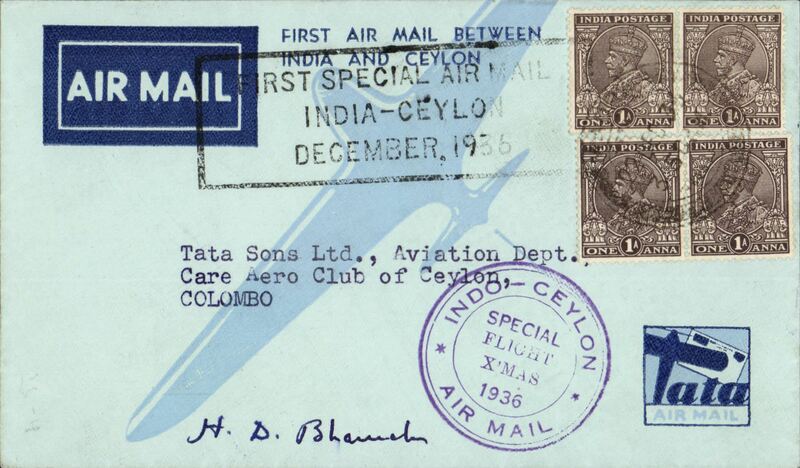 Madras to Colombo, no arrival ds, first regular airmail India-Ceylon, attractive violet cachet,TATA/IAW. 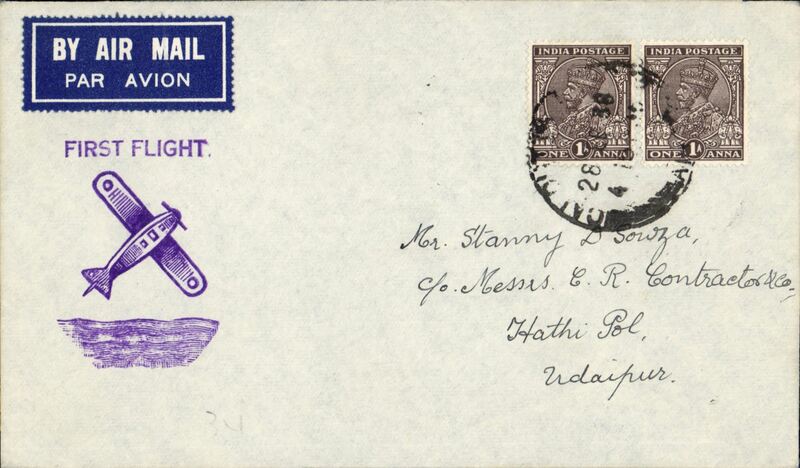 Flying Boat " Coogee" Survey Flight from England to Singapore via the new route from Karachi to Calcutta, Calcutta to Udaipur, bs 4/3, via Kankrolli 3/3, airmail etiquette cover franked 2 annas, purple 'airplane' cachet ." Trial flight of Imperial Airways flying boat from Southampton to Singapore prior to the inauguration of the regular and 'All Up' services. Very fine. Image. 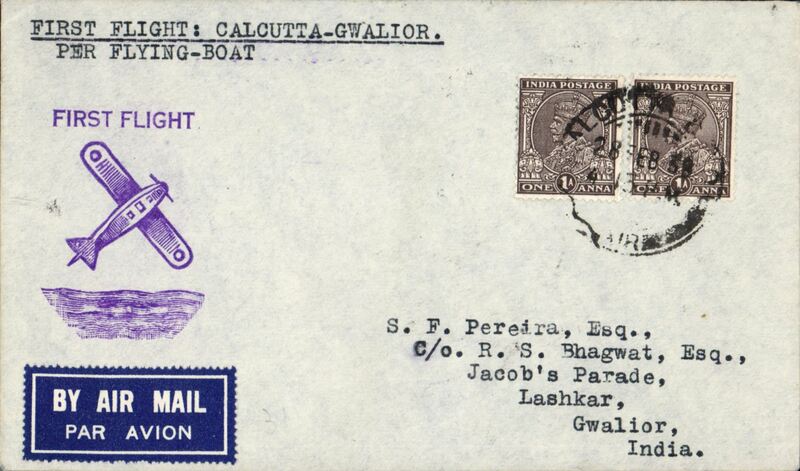 Flying Boat " Coogee" Survey Flight from England to Singapore via the new route from Karachi to Calcutta, Calcutta to Gwalior, bs 4/3, via Lashkar 3/3, airmail etiquette cover franked 2 annas, purple 'airplane' cachet ." Trial flight of Imperial Airways flying boat from Southampton to Singapore prior to the inauguration of the regular and 'All Up' services. Very fine. Image. 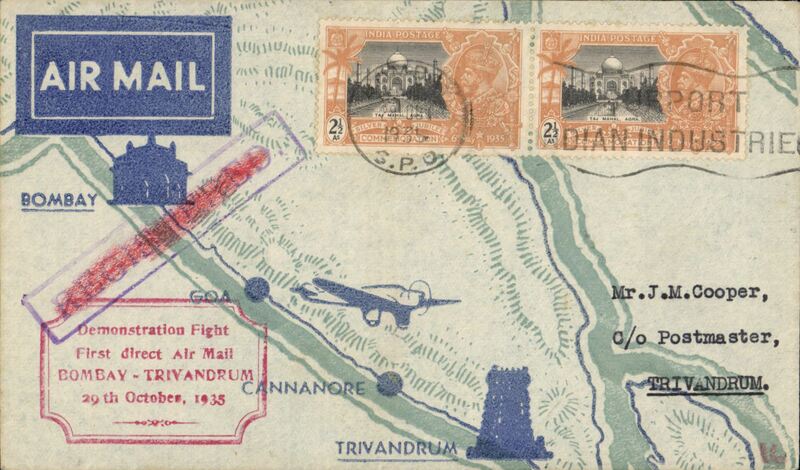 Empire Air Mail Scheme, F/F extension Madras-Trichinopoly to Trivandrum, bs 3/3, blue/white souvenir cover franked 2 annas, TATA. Brussels to Raj Samand, bs 'Kankroli Air/8 Mar 38', registered (label) imprint etiquette cover franked 1930 5F air, typed 'Imperial Airways'. Likely an attempted first acceptance of Belgian mail for the new flying boat service to India but, having missed the 2nd March departure from London, was carried on IE632 which left Southampton on 3/3, arriving Karachi 8/3 (and Calcutta 9/3). Alternatively, flown by Sabena to Berlin, DLH to Athens, from where IE632 plane 'Clio' would have left on the morning of 5/3. A really nice looking cover prepared by Vanderborght for a specific purpose. Very interesting. 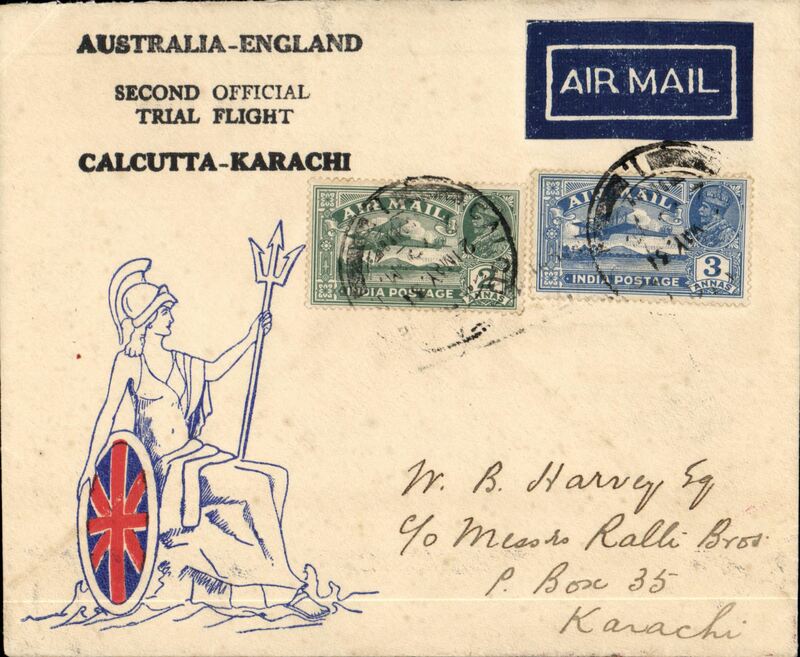 Third stage Empire Air Mail Scheme, Karachi to New Zealand, bs 17/8, plain cover franked 2 annas 6p, canc 'Use the Air Mail/And Save Time/Karachi' dated advertising hs. Flown to Australia, thence by sea to NZ with message 'Please Return by First All-Up Australia-England', but missed this flight. So received an uncommon red hexagonal 'NZ/Auckland/22 Aug 1938/Unclaimed' hs. Also attached to the front is a buff/red Calcutta Dead Letter Office slip with the senders name and address in ms.An unusual item nicely presented on a album leaf. Air Services of India Ltd, F/F Bombay-Rajkot, bs 21/11, blue/pale blue souvenir cover with company logo on flap, franked 2anna, canc red rectangular ' Kathiawar to Bombay' flight cachet. The insignia of the new service was a triangle containing the initials A.S.I. with wings and a seagull’s head. The flight took 4½ hours compared with 32 hours by train. 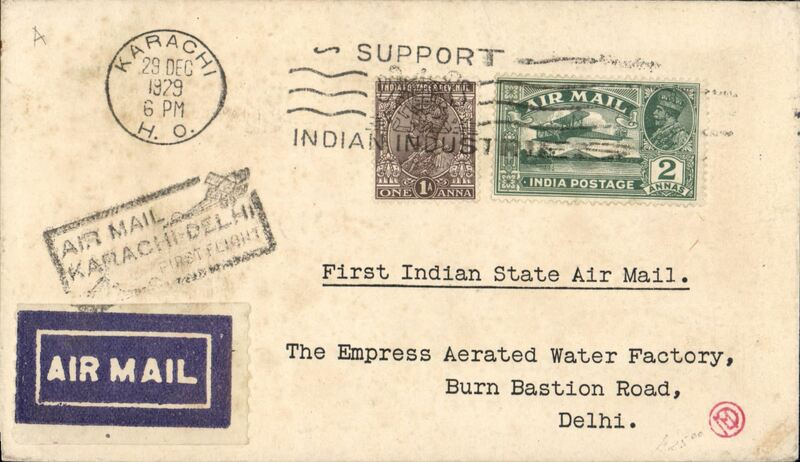 Sadly, the service was very little used, (ref 38-75 Brown J, Indian Air Mails, 1995). Air Services of India, F/F Bombay to Jamnagar, bs 21/11, red boxed cachet, souvenir cover with company logo on flap. Also 4pp, 8x12cm, official timetable and tariff on card. 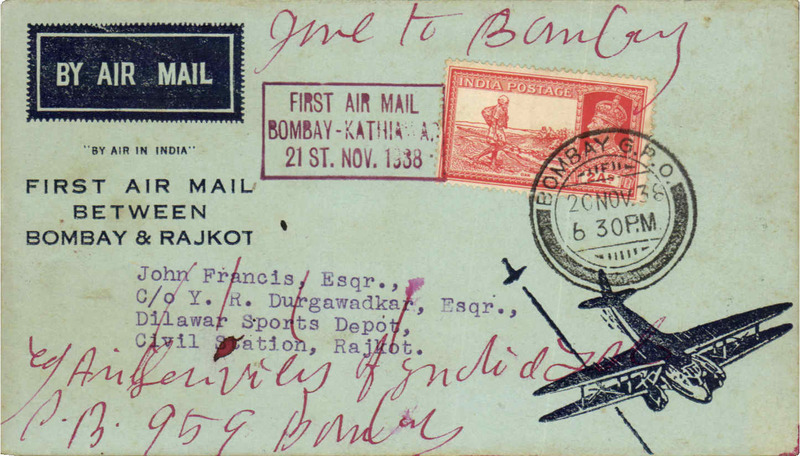 F/F by Air Services of India, Rajkot to Ghatkoper (Bombay), bs 22/11, souvenir cover franked 2 annas, canc black framed 'First Air Mail/Kathiawar-Bombay/21st Nov 1938' cacher. Air Services of India Ltd, scarce F/F Porbandar to Bombay, bs 22/11, blue/pale blue souvenir cover with company logo on flap, franked 2anna, canc black rect ' Kathiawar to Bombay' flight cachet. The insignia of the new service was a triangle containing the initials A.S.I. with wings and a seagull’s head. ). Their brochure advertised Bombay (Juhu) to Kathiawar (Bhavnagar) in 90 minutes. 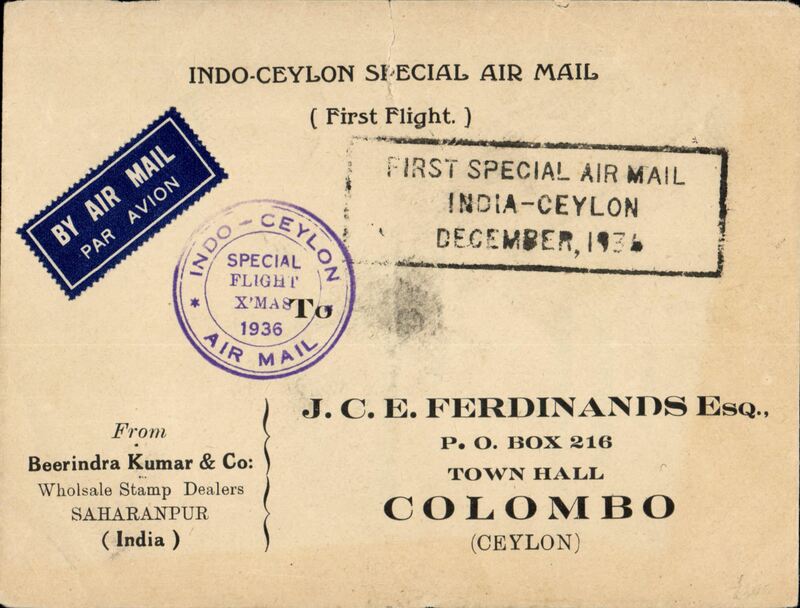 Sadly, the service was very little used, (ref 38-75 Brown J, Indian Air Mails, 1995). 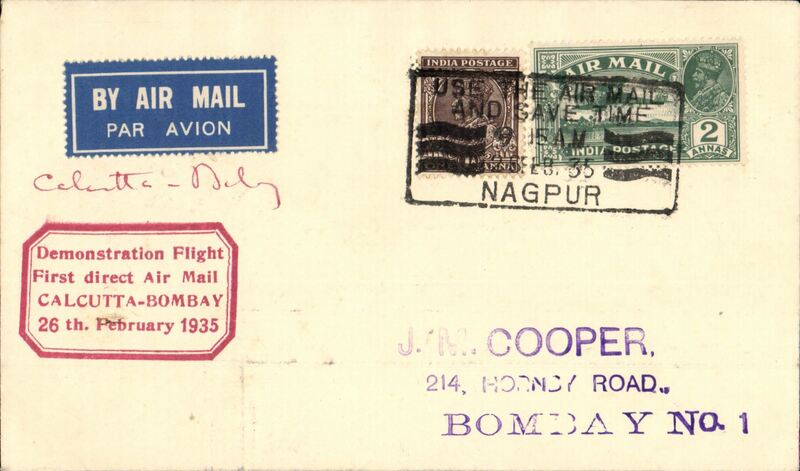 BOAC, Bombay to Inhambane, bs 317, imprint etiquette airmail commercial corner cover franked 11a 6p, carried flying boat Cariolanus from Karachi-Alexandria, and FB Caledonia from Alexandria-Mozambique. See Wingent. Image. 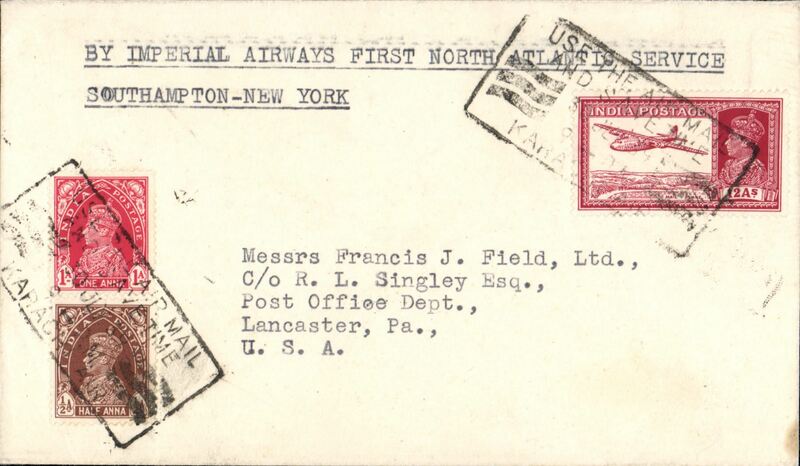 Rare India acceptance for the Imperial Airways first trans Atlantic flight (Northern route), Southampton to New York, bs 6/8, plain cover addressed to Francis J. 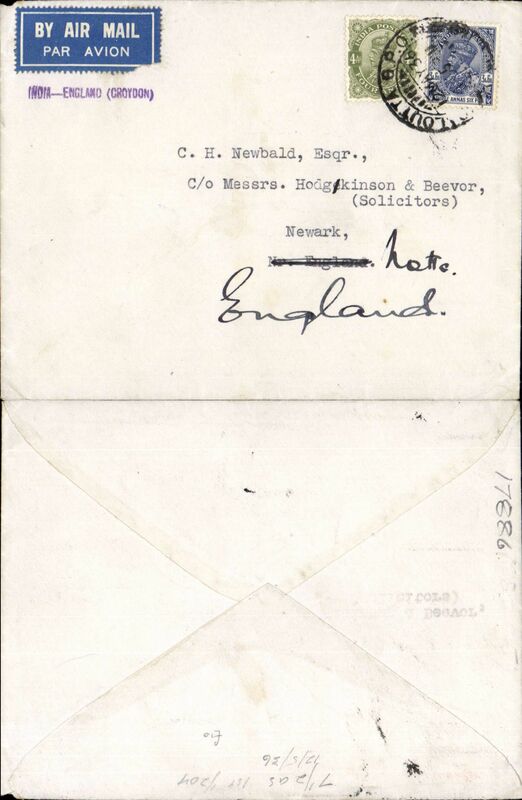 Field, franked 13 1/2 annas, canc black framed 'Use the Air Mail and Save Time/Karachi' dated cancellation, typed "By Imperial Airways First North Atlantic Service/Southampton-New York". Only 5 flown. A super item in fine condition. 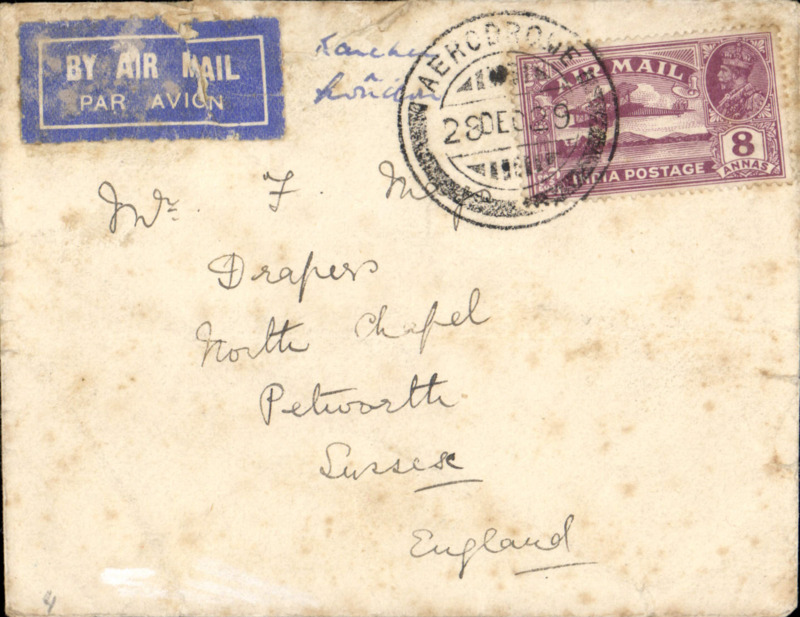 Rare India acceptance for the Imperial Airways first trans Atlantic flight (Northern route), Southampton to Montreal, bs 6/8, plain cover franked 13 1/2 annas, canc black framed 'Use the Air Mail and Save Time/Karachi' dated cancellation, typed "By Imperial Airways First North Atlantic Service/Southampton-Montreal". Francis Field authentication hs verso. Only 5 flown. A super item in very fine condition. Early WWII imprint etiquette censored air cover from J Halley & Co, Calcutta to Hamilton, Canada, no arrival ds, franked 14a canc Calcutta cds, violet Passed Censor Calcutta"8" in triangle military censor mark, by air via Imperial AW/BOAC through Persian Gulf, Cairo and Marseilles to London, then by sea to N. America. 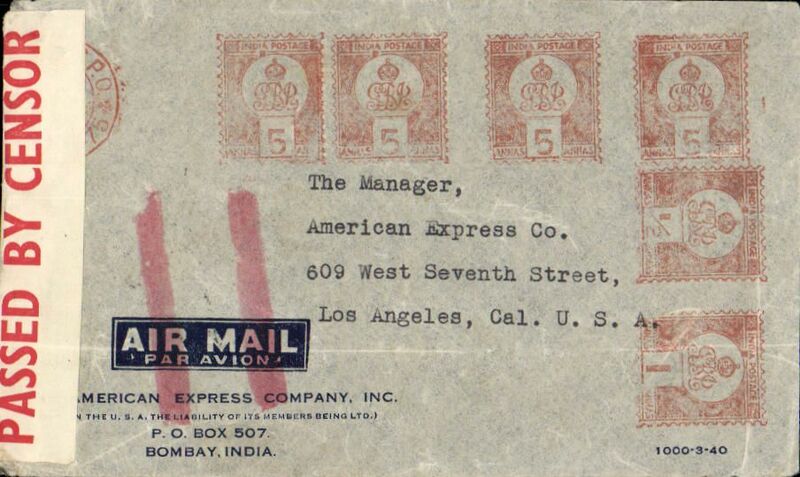 Bombay to Los Angeles, magenta AMEX Co Los Angeles/ Jul 5 1949 receiver verso, airmail corner cover from AMEX Bombay franked 1Re 5 1/2 metre postmark, sealed India red/white PBS 20C censor tape tied by black triangle C11 censor mark. This cover is correctly franked for carriage all the way by air from India to New York. However the red double bar Jusqu'a cancelling further transmission by air was applied in London. Likely explanations are insufficient postage to cover OAT from NY to LA, or no room for airmail freight on FAM18 planes at the time. Interesting. 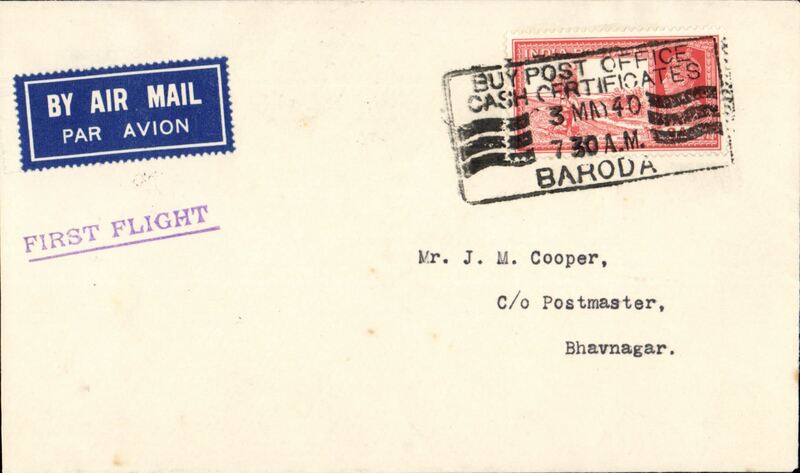 Air Services of India F/F extension of services from Baroda to Bhavnagar, airmail etiquette cover franked 2 annas, purple first flight cachet. Air Services of India, F/F Kolhapur to Bombay, b/s, violet boxed fllight cachet, printed souvenir cover. Air Services of India, F/F Bombay-Kolhapur, bs 4/5, violet boxed fllight cachet, printed souvenir with company logo on flap. The insignia of the new service was a triangle containing the initials A.S.I. with wings and a seagull’s head. 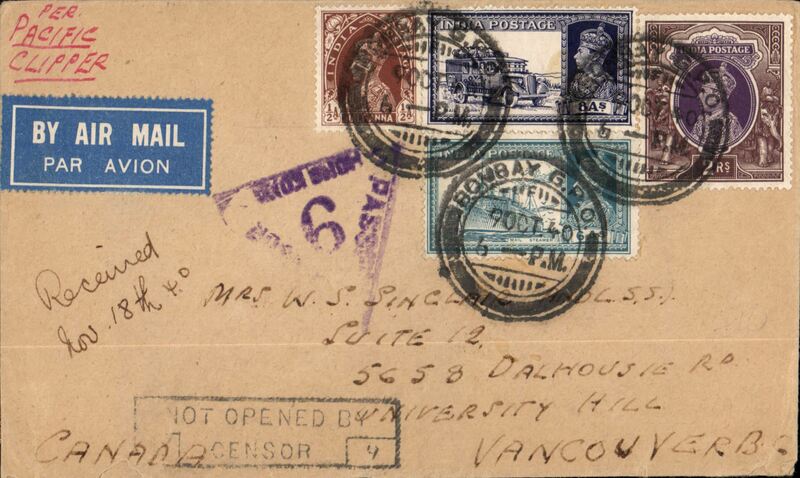 WWII Hong Kong censored Trans-Pacific commercial air cover, Bombay to Vancouver, ms 'received Nov 18th 1940, via Hong Kong, 24/11 transit cds, franked 2R 14 1/2 a canc Bombay cds, ms "Per Pacific Clipper", boxed black "Not Opened By/Censor" hs (in India), violet trangular 'Passed By Censor/9/Hong Kong'. Likely carried on the last BOAC via Hong Kong service (via Rangoon from Oct. 15th, see Boyle p794), then FAM 14 to US. Few closed tears along upper edge of back flap which hardly detract. 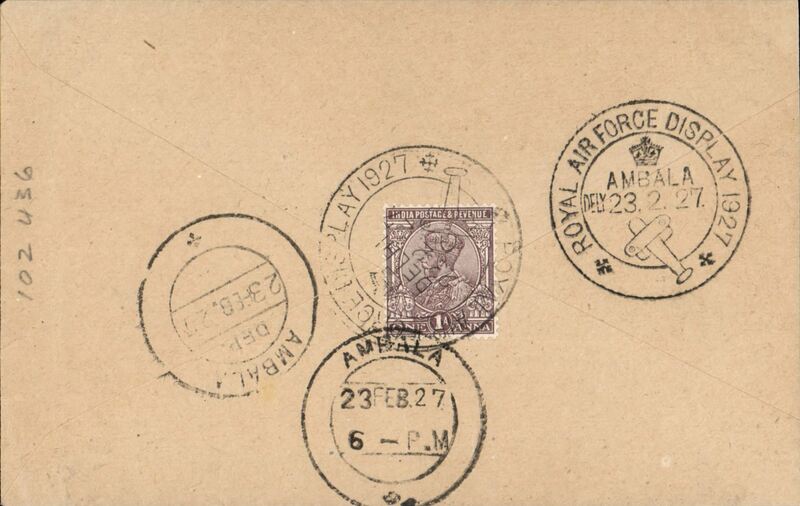 A nice item, see image..
India uncensored WWII registered airmail cover, 22x11cm, Bombay to Johannesburg via the Horseshoe Route, franked 2R + 27 annas, fine strike black boxed 'Not Opened By Censor' hs. Image. 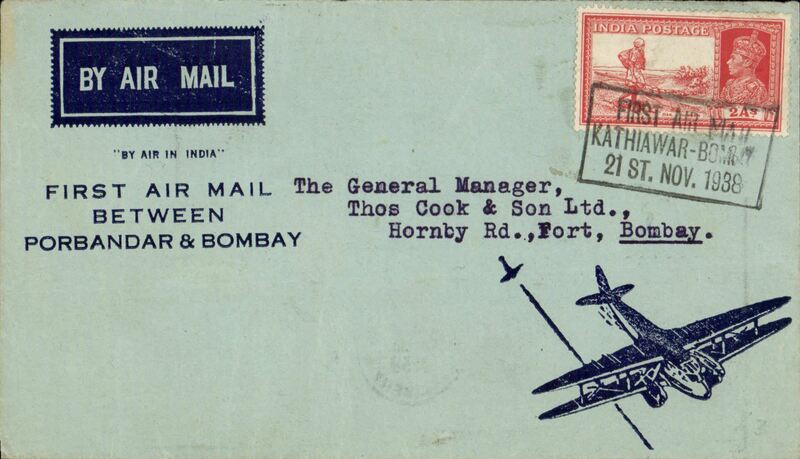 Cover flown Kalyan-Bombay by pigeon, franked 1anna 3p, canc Kalyan/First Pigeon Missive/6 Apr 1941'. A flight of 250 pigeons each carrying 8 messages flew approx 30 miles. Each message ws from the Governor of Bombay to Vice Admiral Herbert Fitz-Herbert, Flaf Officer Commanding Royal Indian Navy. 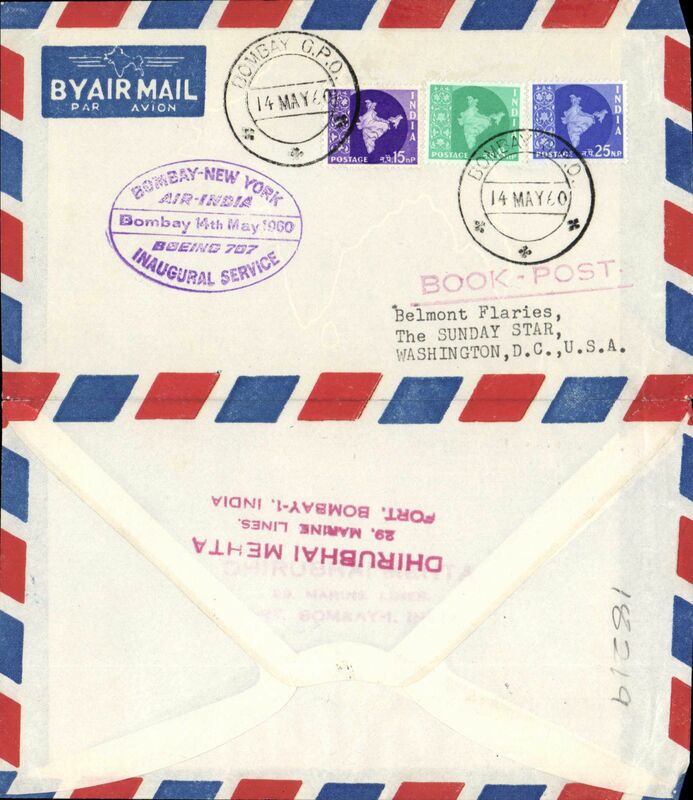 World War II censored airmail cover, flown all the way from India to London, 31/7 arrival ds on front, sent by an officer serving in the in the 10th Ghurkha Rifles based at Dehra Dun, cream cover with blue Ghurkha Rifles logo on flap, franked 3R 5 annas, canc Dehra Dun cds, ms "Via Auckland", India OBC brown/red crown sealing tape tied by crown in triangle censor mark. Correctly rated for carriage all the way by air, to Singapore and Sydney by BOAC, to Auckland by TEAL, to San Francisco by Pan Am FAM 19, then US internal airline across the US, then FAM 14 to Lisbon and BOAC/KLM to London. A super item, full of history. 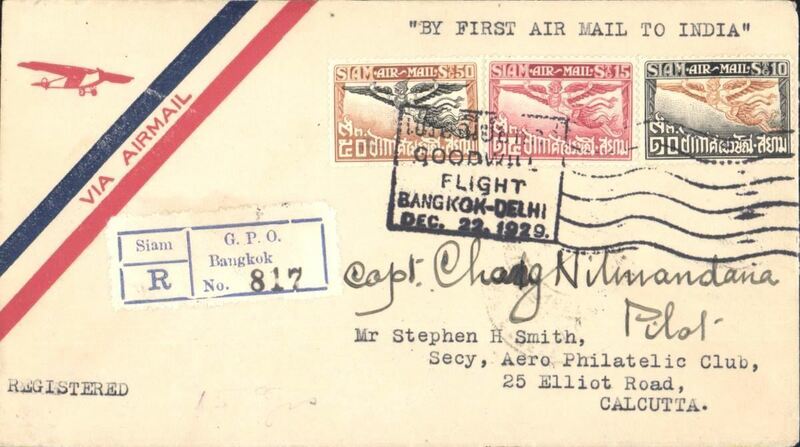 World War II censored airmail flown all the way from India to London, commercial airmail etiquette cover with company's name printed on flap, franked 4R 5 1/2a3R 5 annas, canc Calcutta cds, typed 'India-Chungking-England', sealed India OBC brown/red crown censor tape, India black crown in triangle censor mark. Correctly rated for carriage all the way by BOAC from Calcutta to Rangoon , by the China National Aviation Corporation (CNAC) to Chungking and Hong Kong, by Pan Am FAM14 to San Francisco, by US internal airline to New York, by Pan Am FAM19 to Lisbon, then by BOAC/KLM to London (see Boyle p795). A super WWI item carried on a route which only existed for five months from Dec 1940 to April 1941. 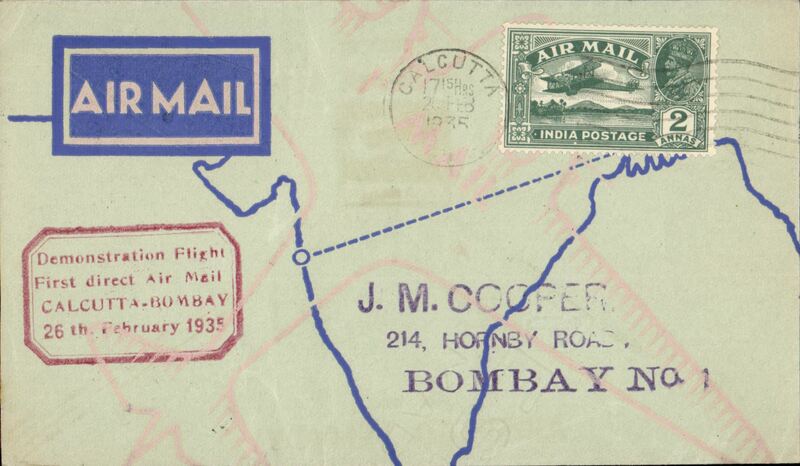 WWII high franked censored airmail from Bombay to Johannesburg, carried from Bombay to Karachi by Indian National Airways and from Karachi to Johannesburg by BOAC over the emergency Horseshoe Flying Boat Route established after Italy entered the War in June 1940. 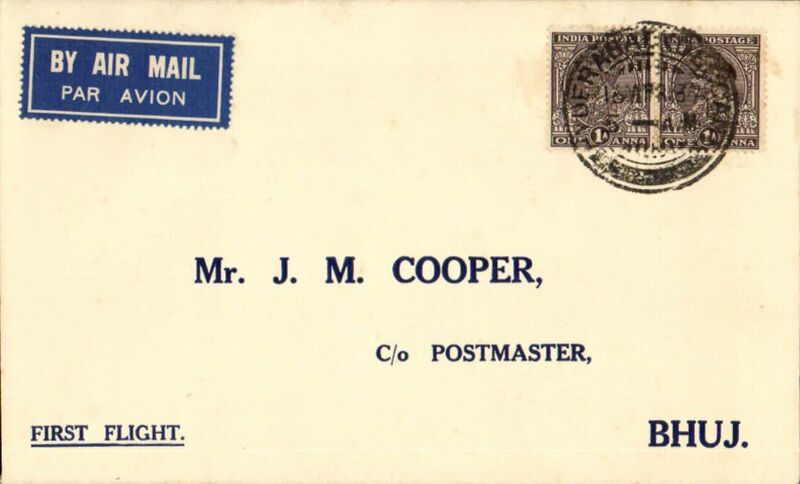 Airmail etiquette commercial corner cover, 27x12cm, franked 10R 8annas (KGVI 2R x5 + 8a), sealed red/white India OBC sensor tape tied by India black triangular censor marks. Correctly franked 168 annas for inclusive x12 weight franking. . 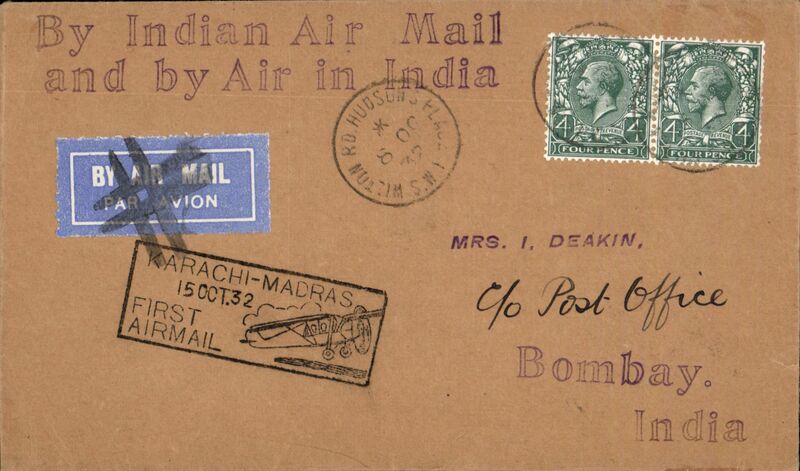 Scarce WWII high franked censored airmail from Bombay to Johannesburg, carried from Bombay to Karachi by Indian National Airways and from Karachi to Johannesburg by BOAC over the emergency Horseshoe Flying Boat Route established after Italy entered the War in June 1940. Airmail etiquette commercial corner cover, 24x11cm, franked 4R 6annas (KGVI 1R x4 + 6a), sealed red/white India OBC censor tape tied by India black triangular censor marks, red 'Written in English' hs. Correctly franked 70 annas for inclusive x5 weight franking. 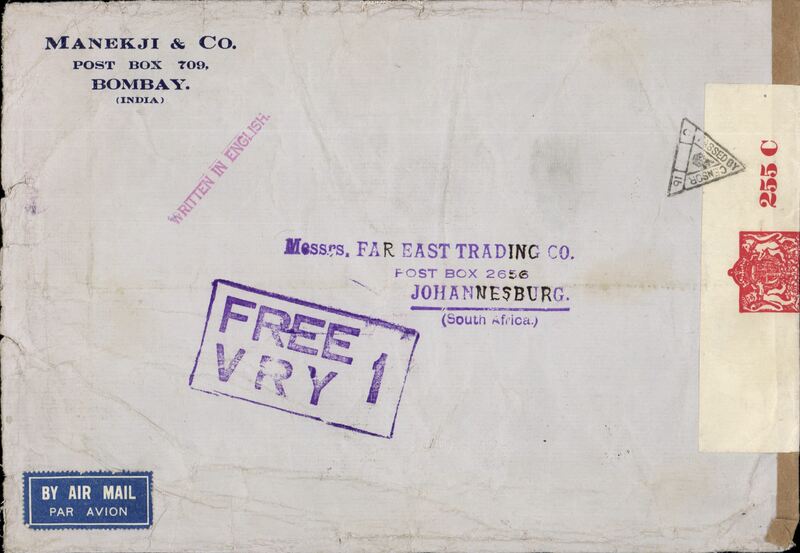 India censored WWII registered airmail cover, 22x11cm, Bombay to Johannesburg via the Horseshoe Route, high 1R + 2R x3 sealed India censor tape tied by Bombay censor mark, large violet 'Free /VRY/1' and red straight line 'Written in English' hs's. Image. 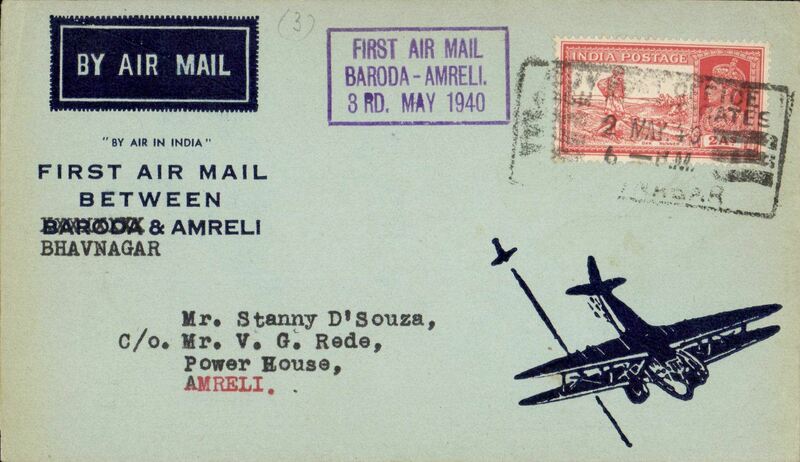 Rare WWII high franked censored airmail from Bombay to Johannesburg, carried from Bombay to Karachi by Indian National Airways and from Karachi to Johannesburg by BOAC over the emergency Horseshoe Flying Boat Route established after Italy entered the War in June 1940. 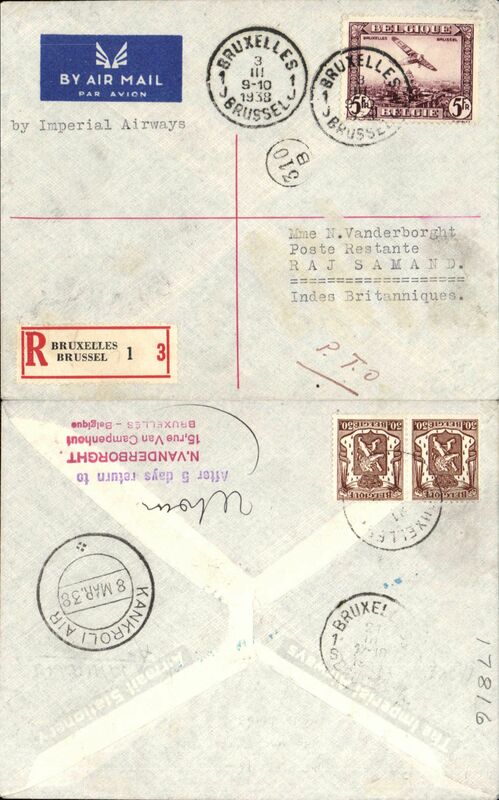 Airmail etiquette commercial corner cover, 24x11cm, franked 7R (KGVI 2Rx3 and 1R), black India triangular censor mark,large boxed violet 'Free/VRY 2' and red 'Written in English' hs's. Correctly franked 112 annas for inclusive x7 weight franking. World War II dual censored commercial air cover, Ahmednagar Camp to New Jersey, no arrival ds, pale green/green envelope with crown over 'FVS' logo on flap, franked 2R 11 1/2a, ms endorsement "Via-India-Lagos-USA", sealed black/white PC90 Indian censor tape tied by black hexagonal DHB (Bombay) censor mark, also purple st. line DHB/22 (Bombay) and Military censor marks, ms Air Mail cancelled by fine strike purple framed four bar Jusqua applied on arrival in New York, see McQueen p89. Correct rate for Pan Am South Transatlantic route for carriage by BOAC to Lagos via Persian Gulf, Cairo and Khartoum, then Pan Am FAM22 to Miami, and OAT to New York, or BOAC to Lisbon,see Boyle p791-5. Ahmednagar Camp was a POW internment camp during WWII. 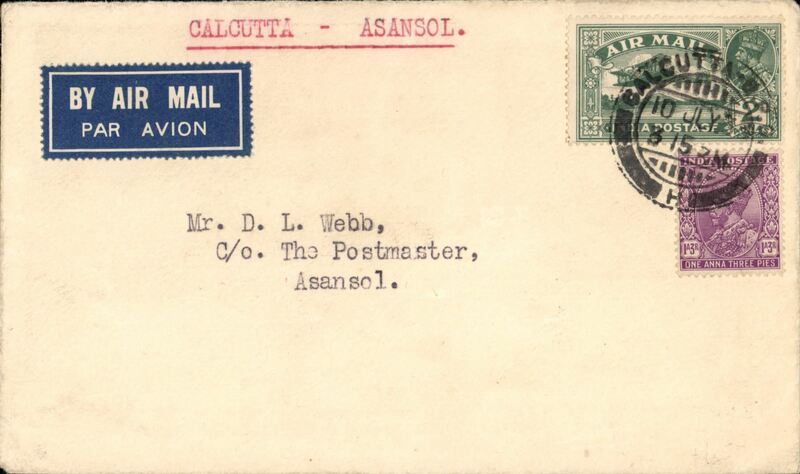 World War II censored cover flown from Calcutta to USA, 6c airmail PSE cancelled by unique identifier ds "US Army Postal Service/ APO 465", also"Passed by US Army Examiner" hs. 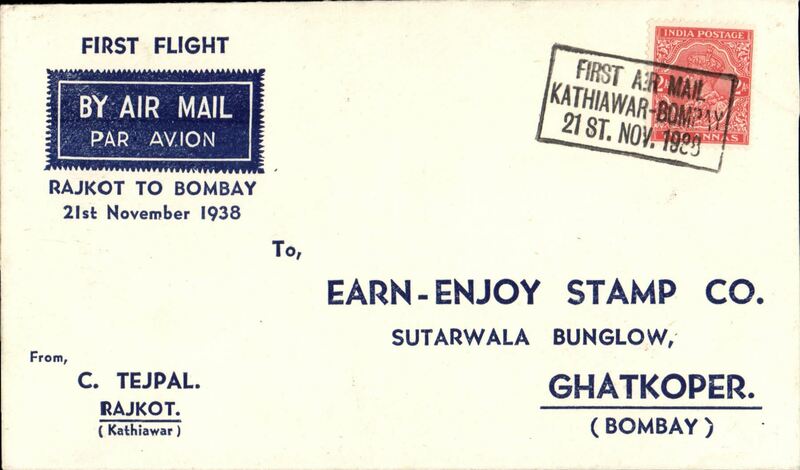 Special TATA air mail label attached to airmail from Karachi to Bombay, bs 6/10, airmail etiquette cover franked 2 1/2 annas. Cover has interesting blue embossed 'C/S' logo on flap. See scan. 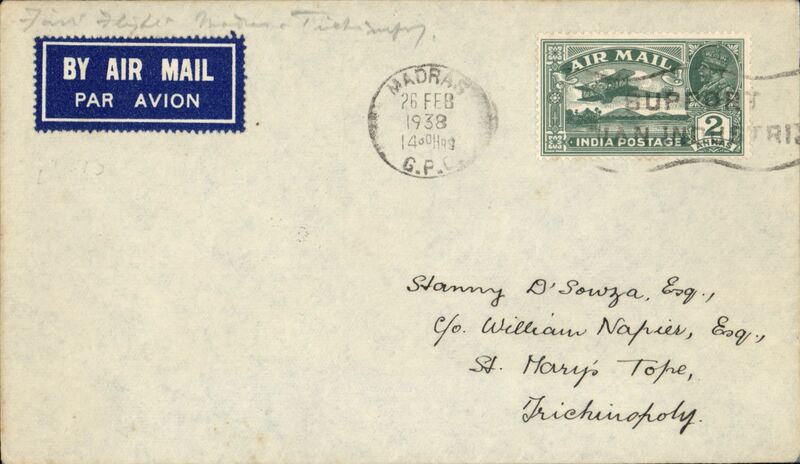 WWII air cover India-Lagos-USA, Madura to Boston, airmail etiquette cover franked 2R11anna rate, ?1945, BOAC to Lagos, than Pan Am FAM 22 to Miami, ms 'Air Mail/India-Lagos-USA'. ?1945. TATA, return first regular commercial flight Bombay-Calcutta via Nagpur, Calcutta to Bombay bs 3/4. red/cream souvenir cover , 24x11cm, franked 3 1/2 annas. Early post WWII airmail, Bhagalpur to Philadelphia, bs 3/9, via New York 3/9, registered (hs) 1 1/2 PSC with additional 2R, 2anna stamps verso. Interesting, see scan. 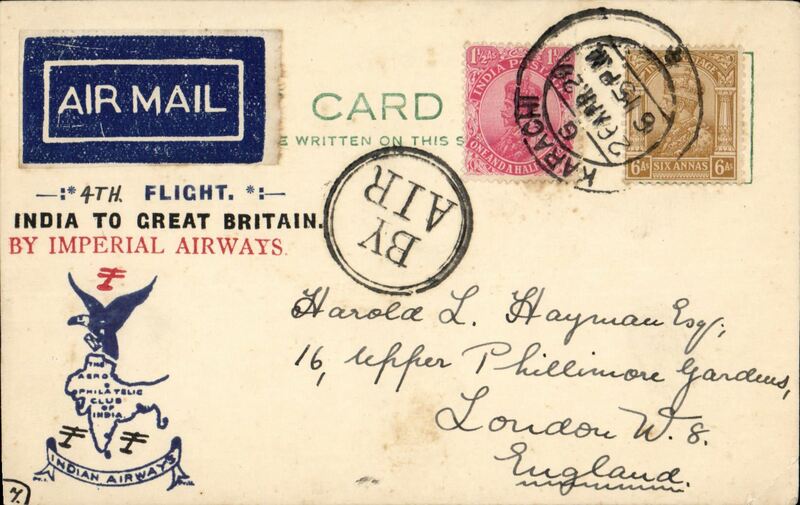 Pan Am, FM 18 F/F Karachi to London, airmail cover franked 14a, large cachet, no bs. 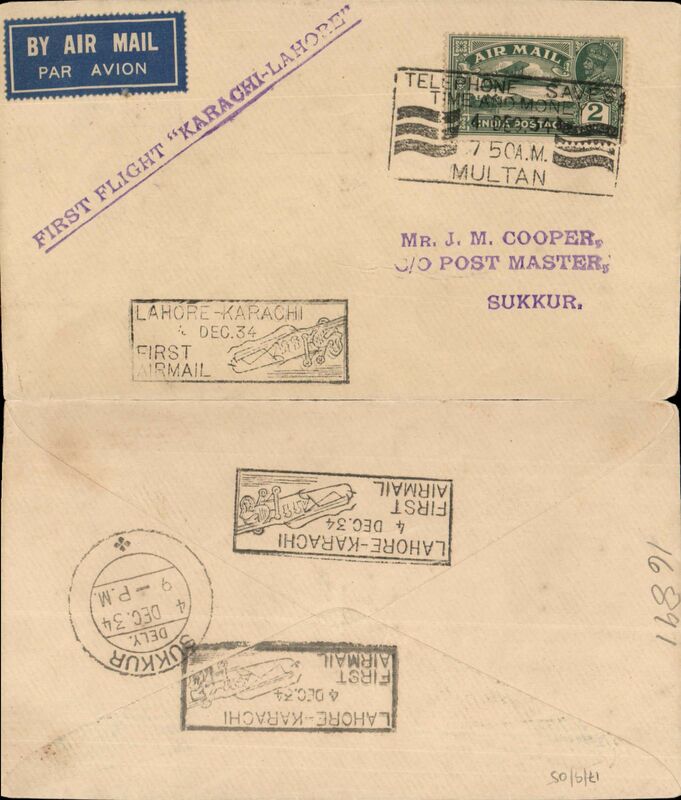 Pan Am, FM 18 F/F Karachi to Ankara, airmail cover franked 1R & 3 1/2a, large cachet, bs. 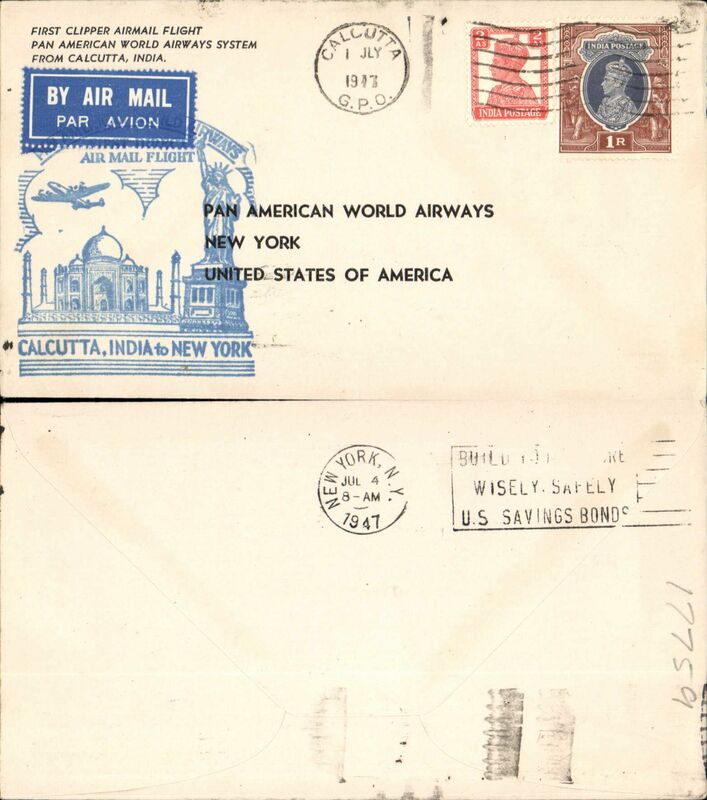 Pan Am, FAM 18 first extension to Calcutta, and first around the world service by a single airline, Calcutta to New York, souvenir cover franked 12a, cachet, no b/s. Pan Am, FAM 18 first extension to Calcutta, and first around the world service by a single airline, Calcutta to Istanbul, souvenir cover franked 10a, cachet, b/s. 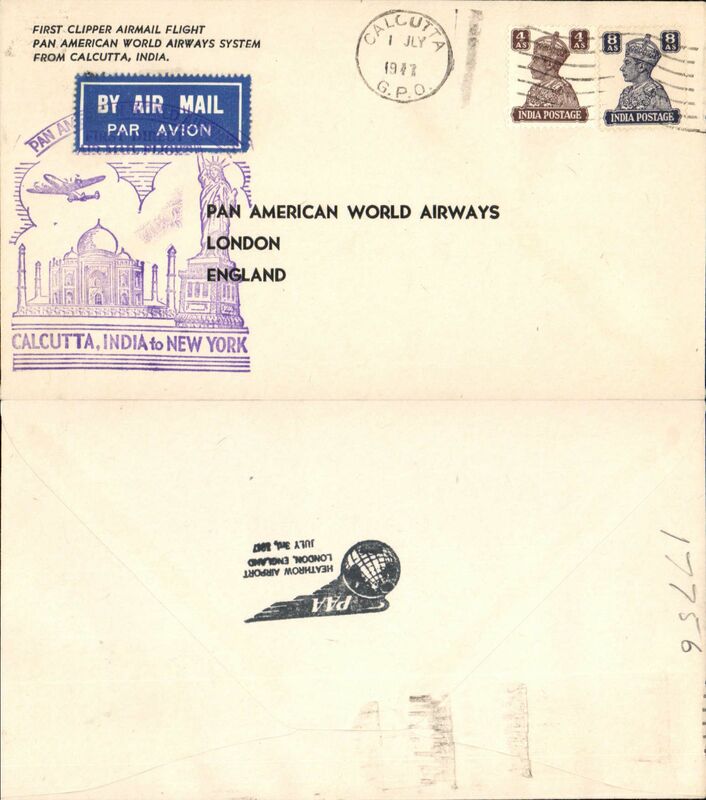 Pan Am, FAM 18 first extension to Calcutta, and first around the world service by a single airline, Calcutta to New York, souvenir cover franked 1R 2a, cachet, no b/s. Pan Am, FAM 18 first extension to Calcutta, and first around the world service by a single airline, Calcutta to Manila, souvenir cover franked 12a, cachet, b/s. 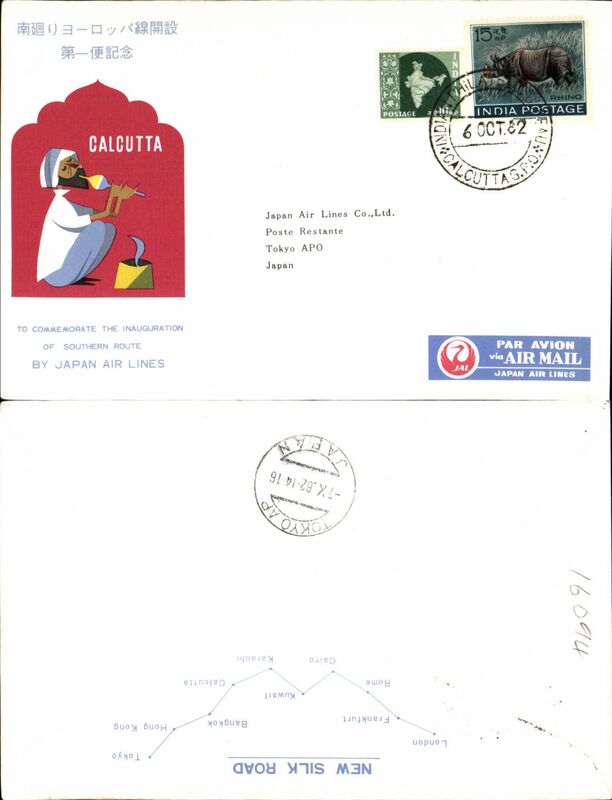 Pan Am, FAM 18 first extension to Calcutta, and first around the world service by a single airline, Calcutta to San Francisco, souvenir cover franked 1R 2a, cachet, no b/s. Pan Am, FAM 18 first extension to Calcutta, and first around the world service by a single airline, Calcutta to Honolulu, souvenir cover franked 1R 2a, cachet, no b/s. BOAC, Bombay to Zurich, bs 26/12, 12anna registered PSE (1947) with additional 10 1/2annas, canc Bombay cds, black/white Bombay reg label, blue/white airmail etiquette. Uncommon. 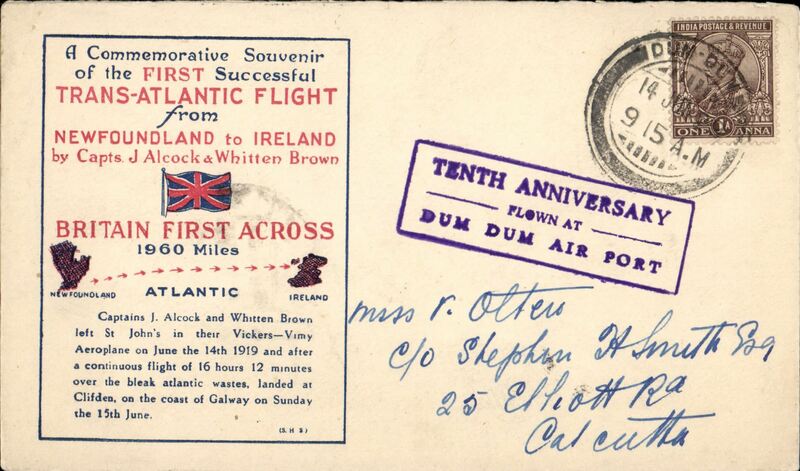 F/F FAM 14, Calcutta to Guam, cachet, souvenir cover, 24x10cm, Pan Am. 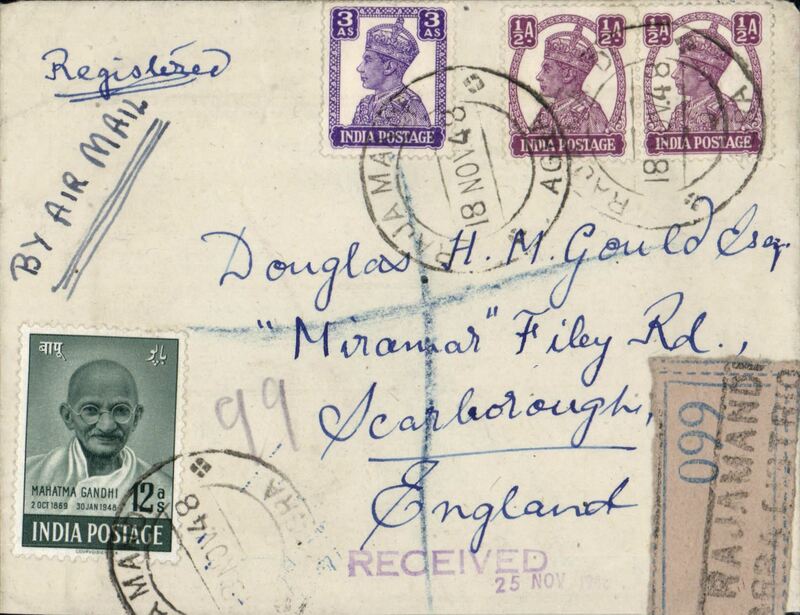 1948 Gandhi 12 annas stamp on airmail cover, Madras to England, framed violet 'Air Mail' hs. 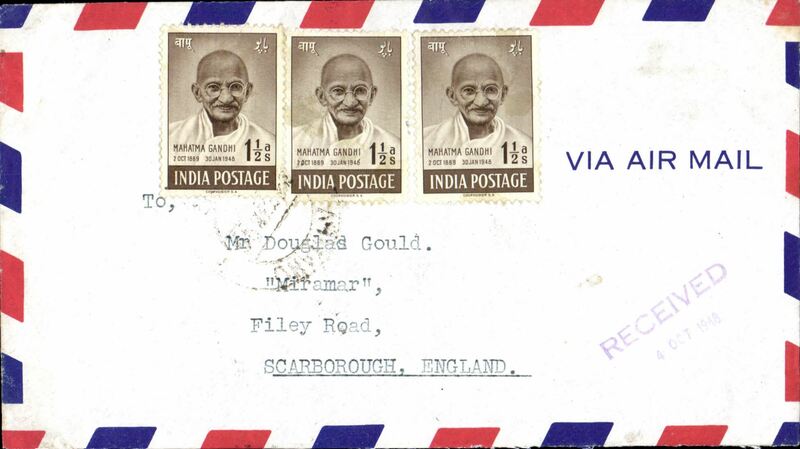 1948 Gandhi 1 1/2 annas stamps (x6) andKGVI 1a, 2a x2 on airmail cover, Madras to England, 4/10 receiver on front. 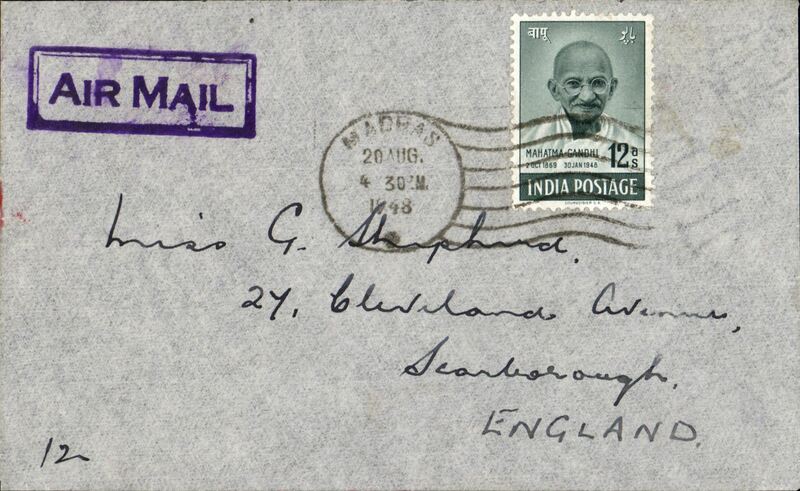 1948 Gandhi 12 annas stamp and KGVI 1a, 3a, 1/2a x2 on airmail cover, Rajamand to England, 25/11 receiver on front. 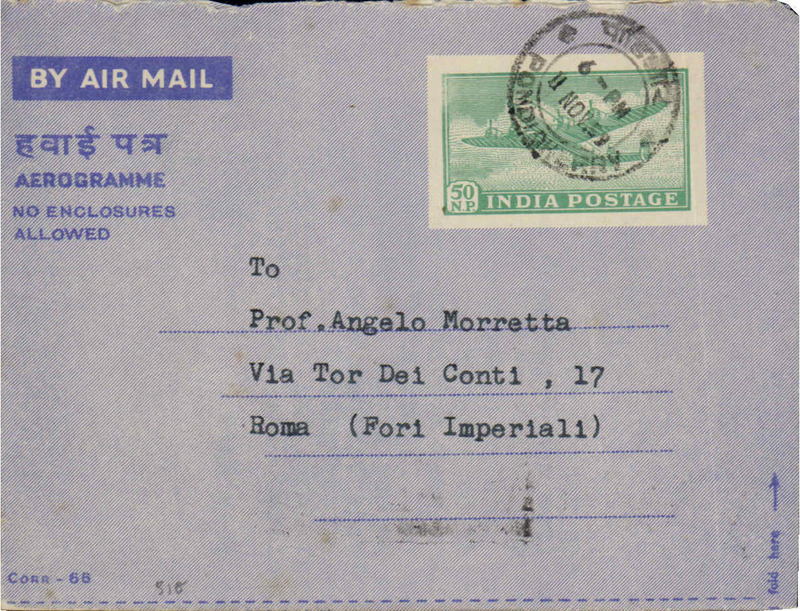 Agra to England registered (label) air cover rated 16 annas including Ghandi 12anna. 9Ps PSC, Bombay to Goa, bs Mapuca. 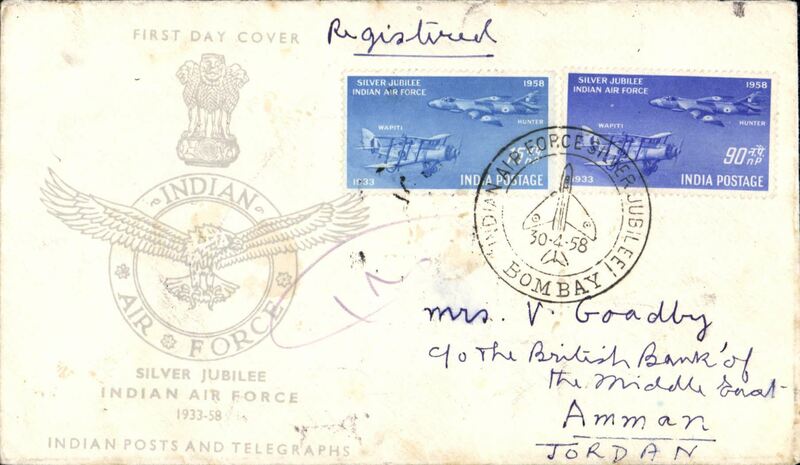 Bombay to Jordan, bs Amman 6/5, via Betrouth 4/5, special flight to commemorate the Silver Jubilee of the Indian Air Force, souvenir cover franked FDI 15np and 90np SJ stamps. A tad grubby. Image. Pondichery to Rome, b/s, blue/grey aerogramme with imprint 50Np, canc Pondochery cds. Air India F/F Bombay to New York, b/s, flight cachet, air cover. Flown cover commemorating 50th anniv First Aerial Post from Allahbad to Naini, special cachets, official printed long cover showing photograph of Henri Pequet and Humber bi-plane. 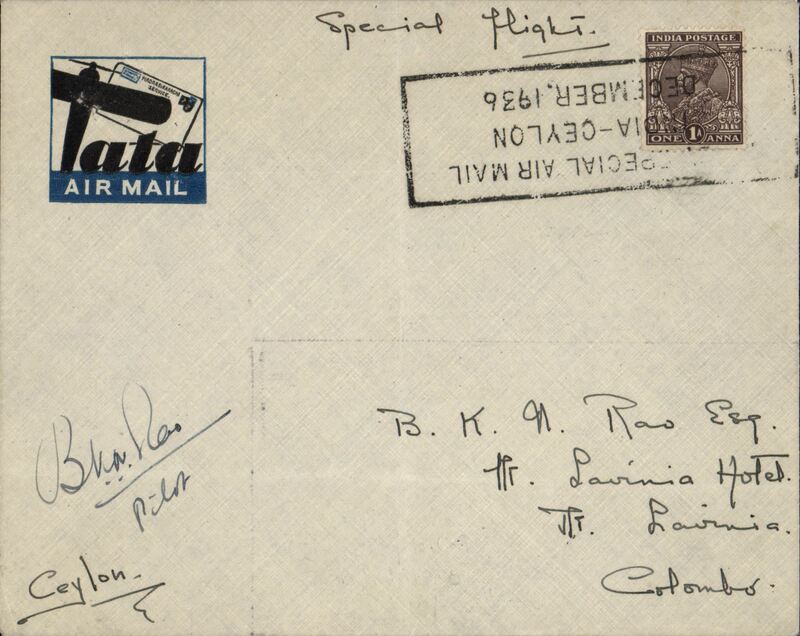 Flown cover commemorating 50th anniversary First Aerial Post from Allahbad to Naini, special cachets, official printed long cover showing photograph of Henri Pequet and Humber bi-plane. Image. 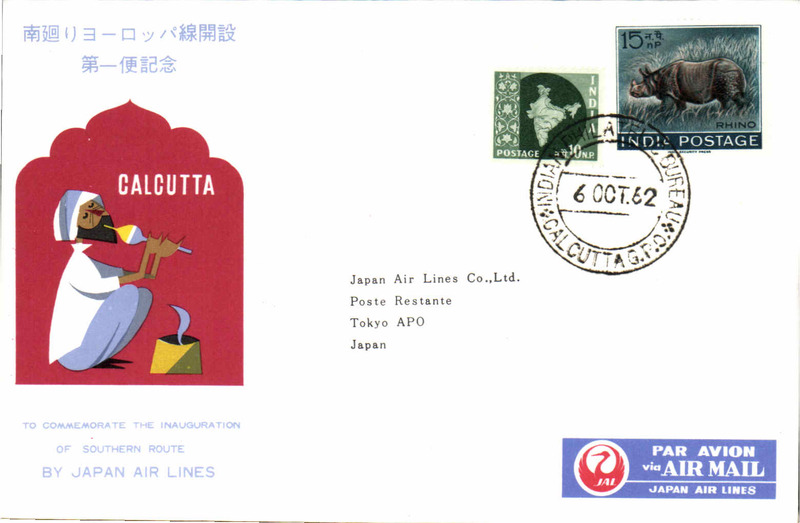 F/F inauguration of Southern route, Calcutta-Tokyo, b/s, illustrated souvenir cover, JAL. F/F, Calcutta-Tokyo , cachet, b/s, souvenir cover, JAL. Inauguration Indian Airlines Caravel Jet Service, F/F New Delhi to Bombay, official souvenir cover, flight cachet, b/s. 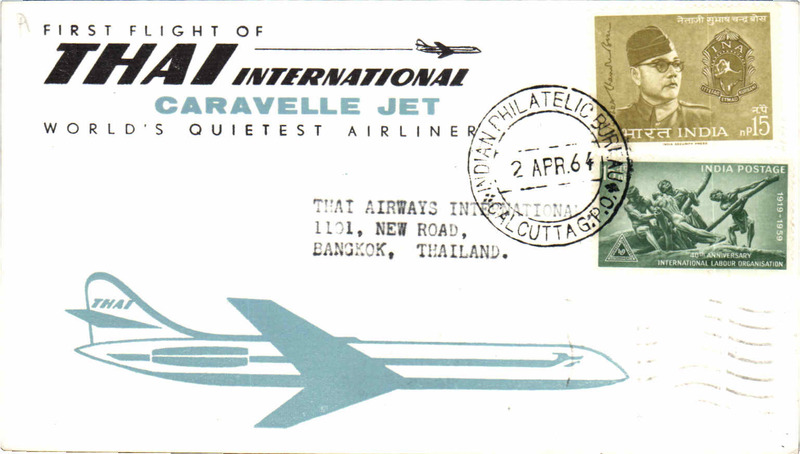 Thai International Caravelle, Calcutta-Bangkok, b/s, souvenir cover. 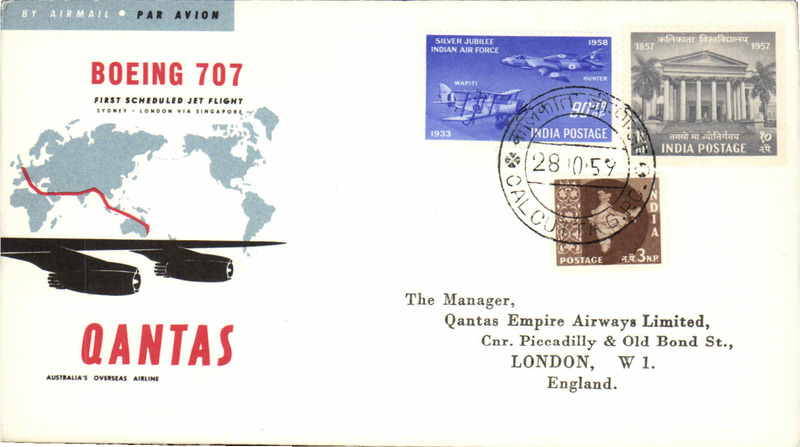 Qantas F/F Delhi-Vienna, souvenir cover, bs. 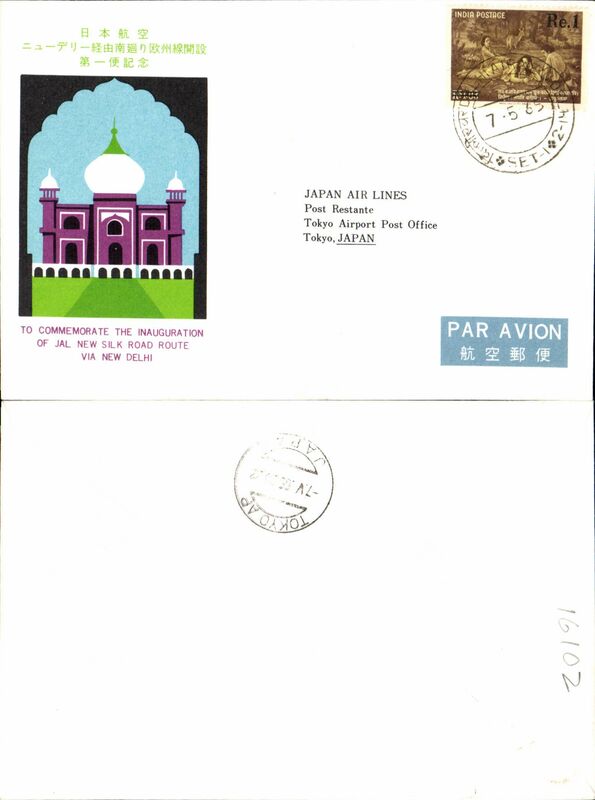 F/F New Delhi-Tokyo, cachet, b/s, souvenir cover, JAL. 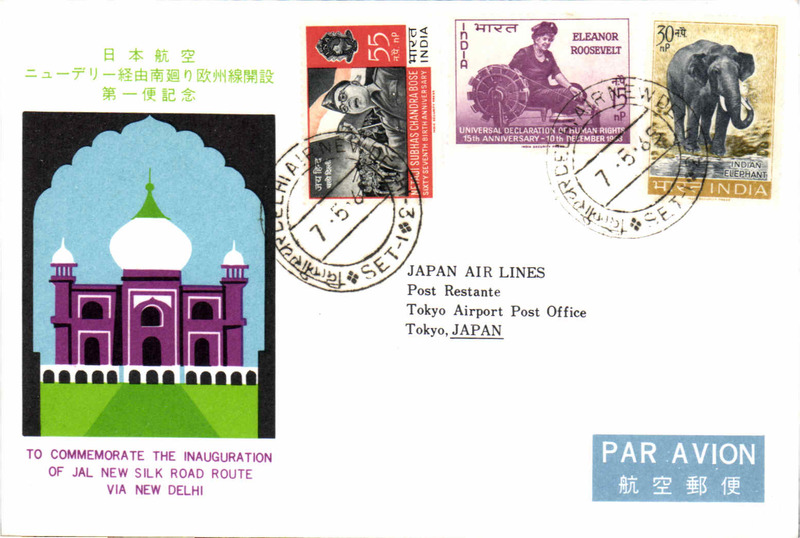 F/F inauguration of Polar route, New Delhi-Tokyo, b/s, illustrated souvenir cover, JAL. 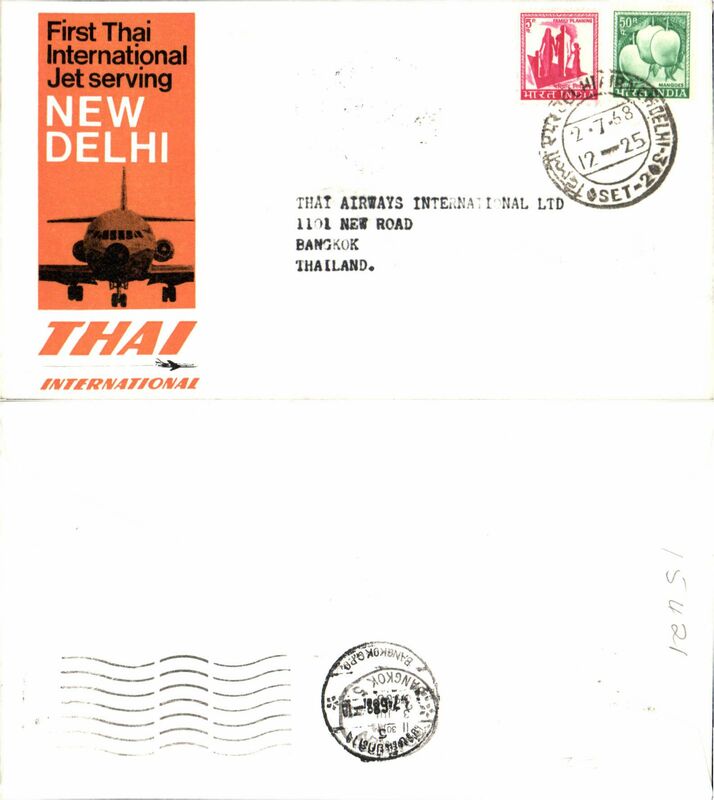 Thai Airways International, F/F New Delhi-Bangkok, bs, official souvenir cover. Air India, F/F Bombay to Entebbe, bs 31/10, attractive souvenir cover , official F/F cachet. 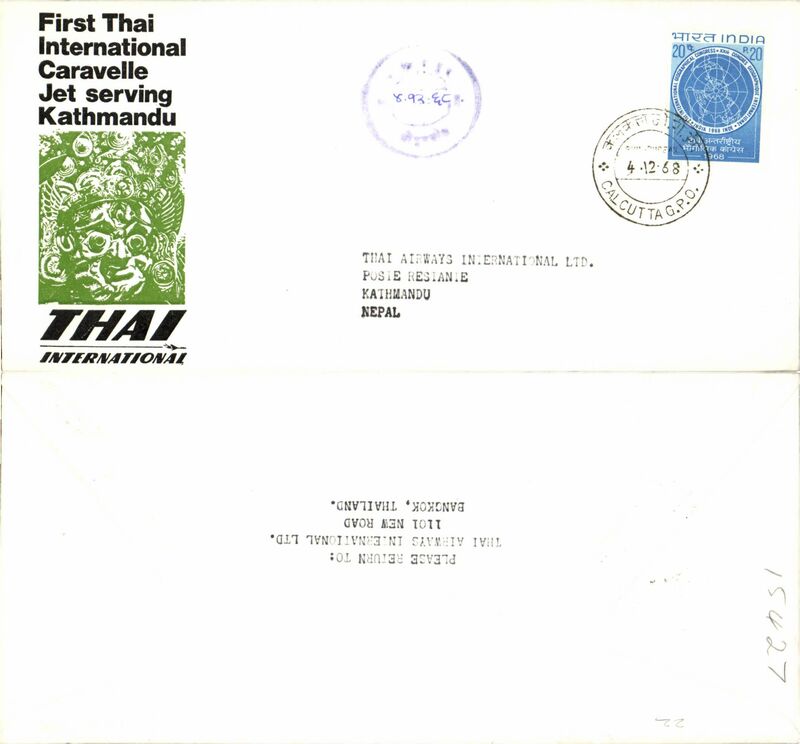 Thai Airways International, Caravelle Jet, F/F Calcutta-Kathmandu, arrival ds on front, company cachet, official souvenir cover. Thai Airways International, Caravelle Jet, F/F Calcutta-Kathmandu, arrival ds on front, official souvenir cover. Japanese Airlines, first DC8, Bombay-Tokyo, b/s, cachet, souvenir cover. Pan Am, special B 747SP flight, Delhi to New York, bs3/5, black 7 line flight cachet. 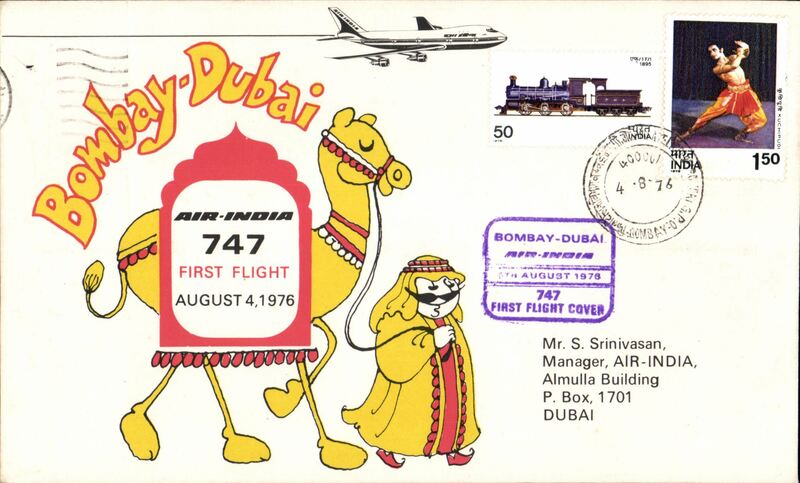 Air India 747 F/F Bombay to Dubai bs 4/8, attractive souvenir cover franked 2.00, nice strike violet framed flight cachet.